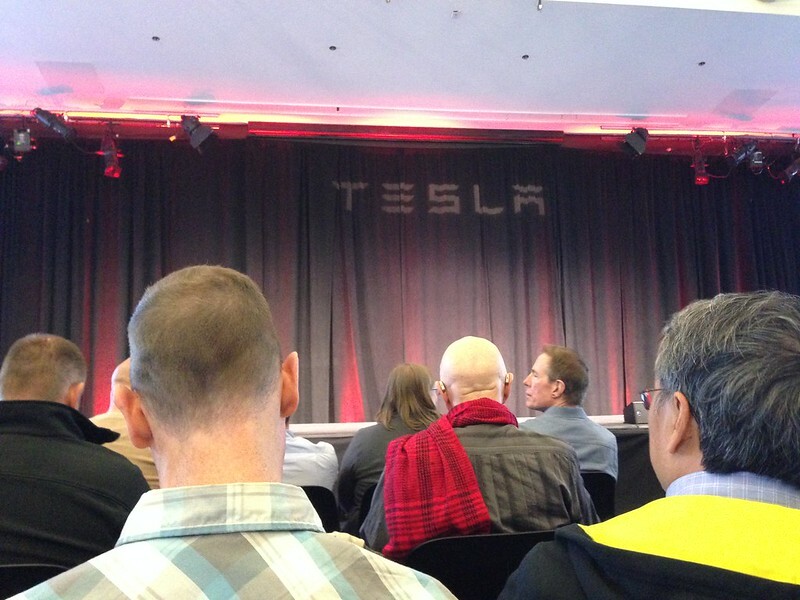 We attended our first Tesla annual shareholders meeting last year (Day One, Day Two). 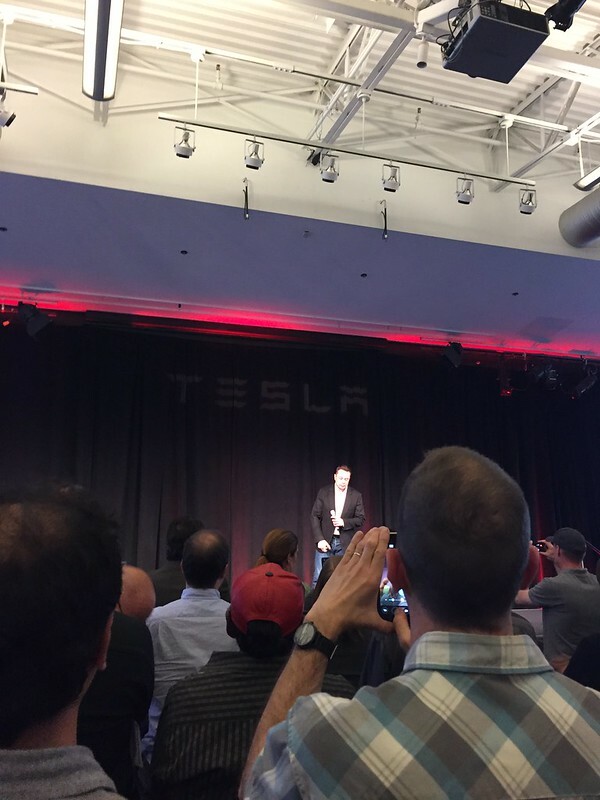 This year, since we were already in the area right before, we decided to attend the Tesla Annual Meeting again two weeks ago. 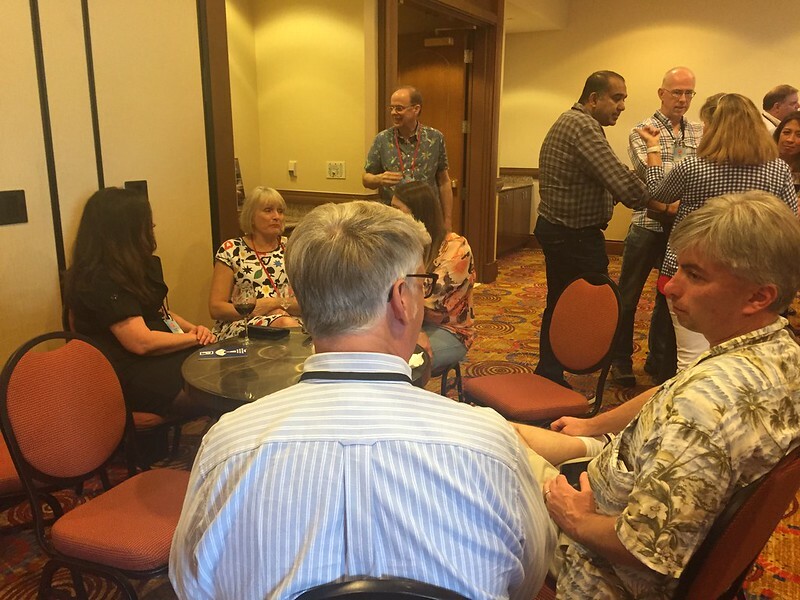 The previous Annual Meeting trip in 2016 was the central focus of those two days. 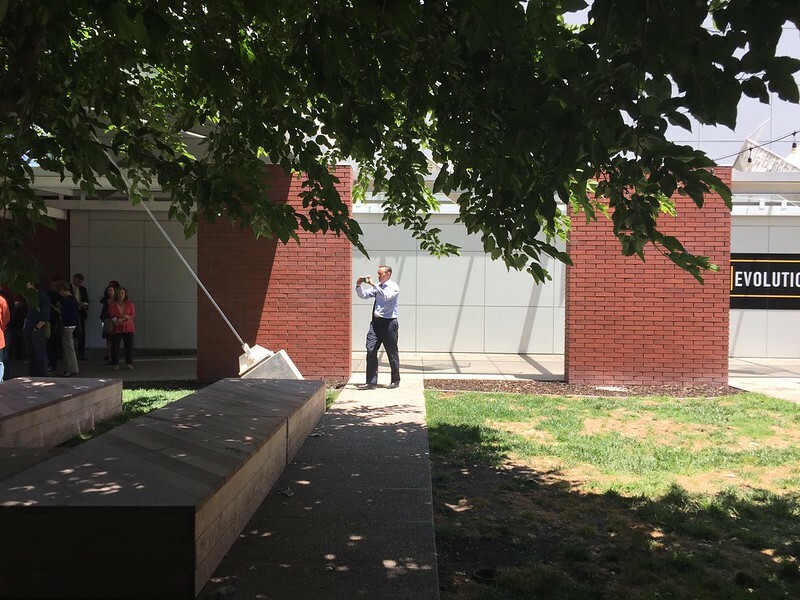 However, this year’s (2017’s) attendance was the afterthought to other activities that brought us to the area. As well as cars that hope to be EVs soon. Some one was part of Luke Skywalker’s squadron. We figured to boost our charge for the drive home. We want to get home at a decent hour after today’s Annual Meeting. 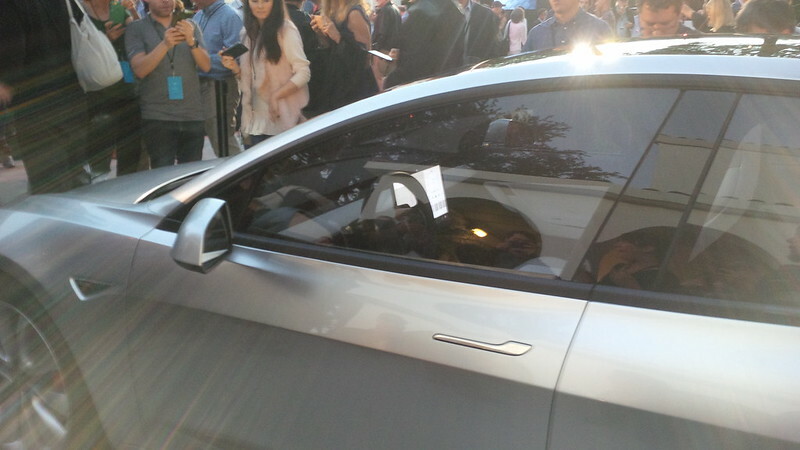 Tesla spotting in the row that we parked our cars in. 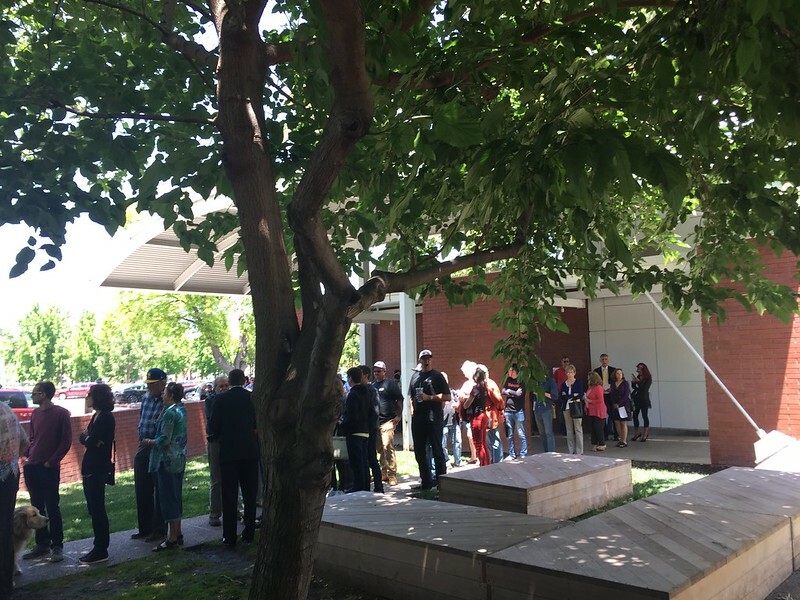 We waited in the shade of the trees before security let us into the event. 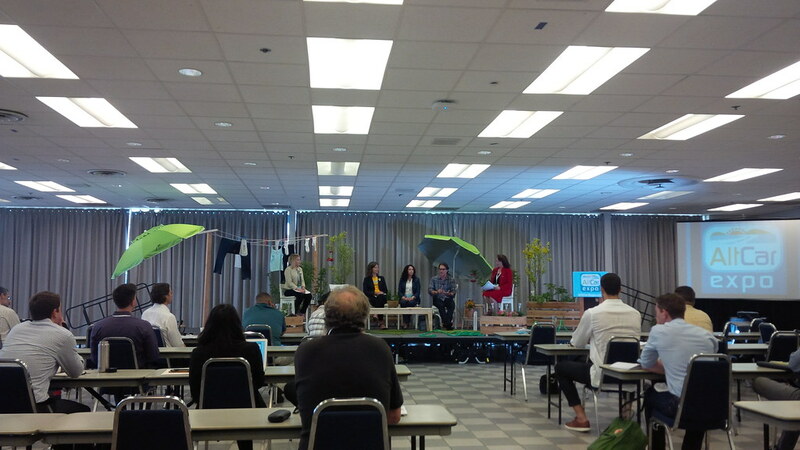 And here I am chatting with Papafox from Hawaii. 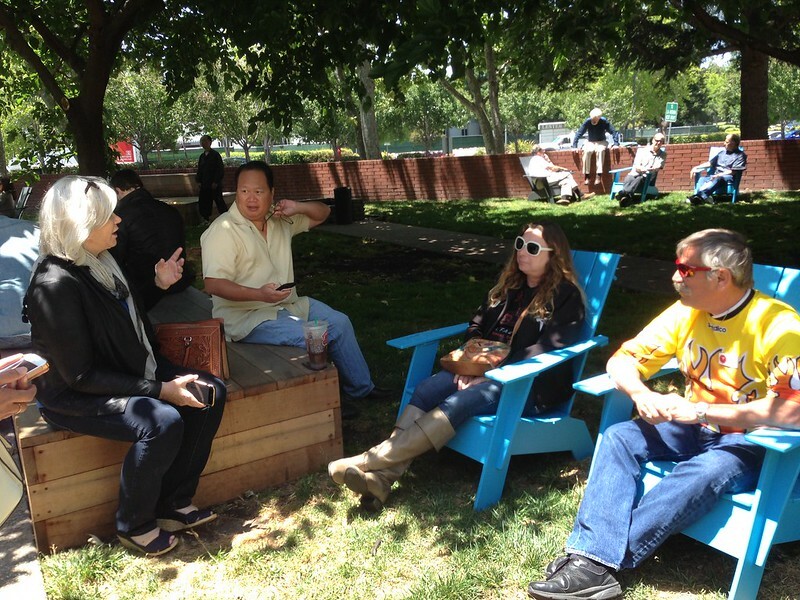 Chatting with Bonnie as well as Linda and Bill from our home club, the Tesla Owners Club of Orange County. 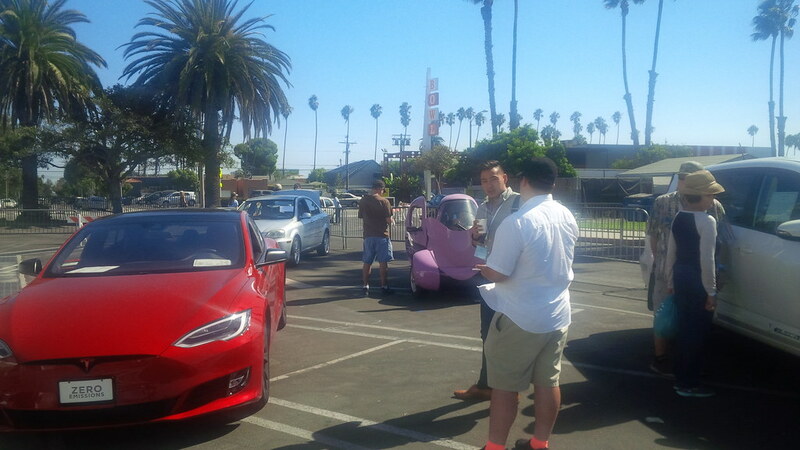 And the line started to form… Nanette from Tesla Owners Club of Hawaii was with us as well. 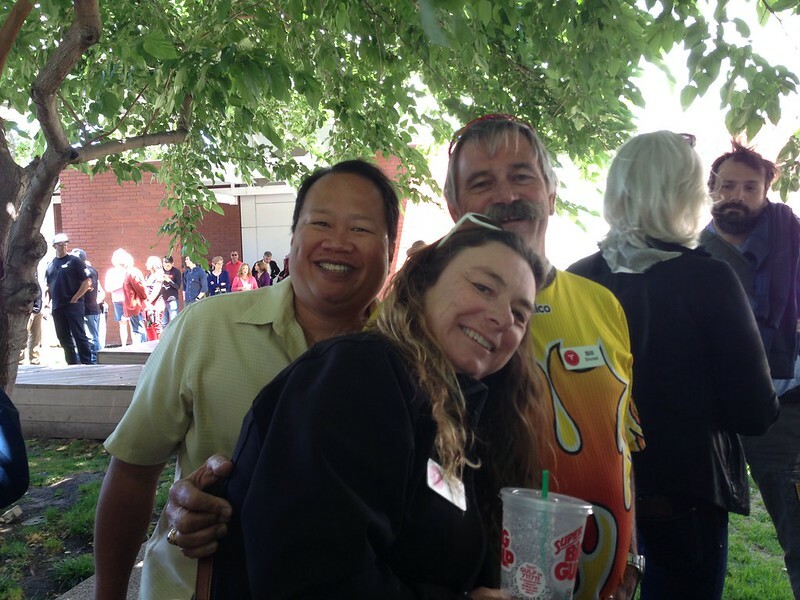 Better half gets a better picture of me with Linda and Bill. The guy ahead of us must have been made of metal, ’cause he should’ve brought a purse with all the stuff he had to empty from his pockets. 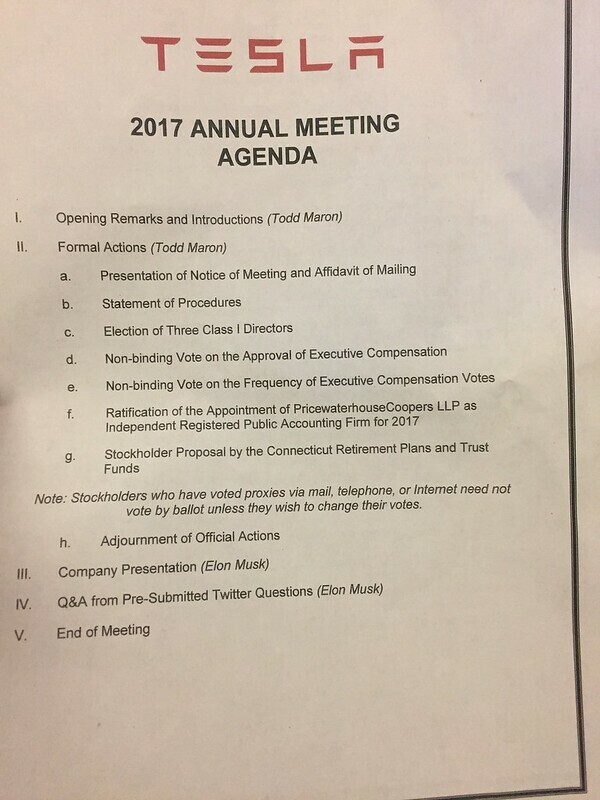 The Annual Meeting was held in the same room as last year. We did get a better seat. The agenda was relatively brief. And lots of familiar faces. Better view this trip, but not better pictures. 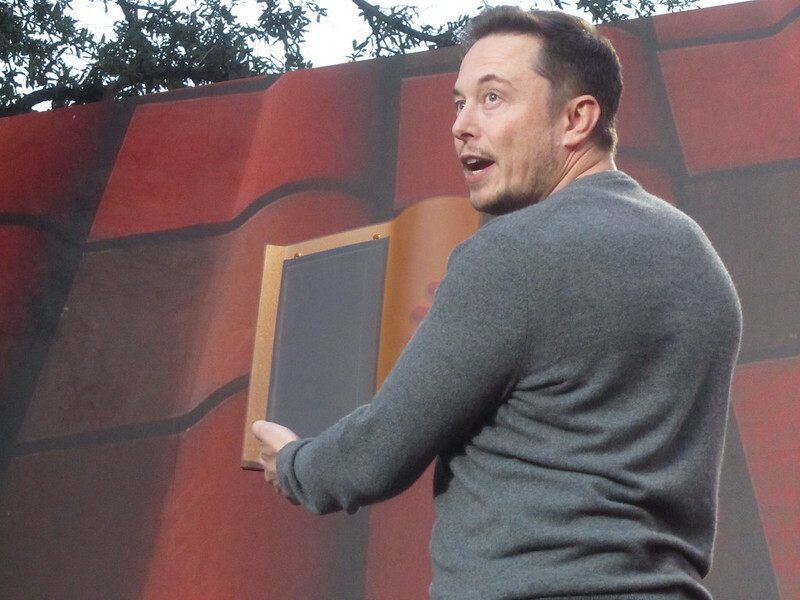 Unlike last year when Elon and JB really went “off-book” and kept us entertained at the meeting for several hours. Elon was pretty structured. A lot of it had to do with IR taking and filtering questions the day before via Twitter submissions. There was no in-room queuing for live questions. So, though the IR department let some less serious questions come through, it was all pretty well managed. 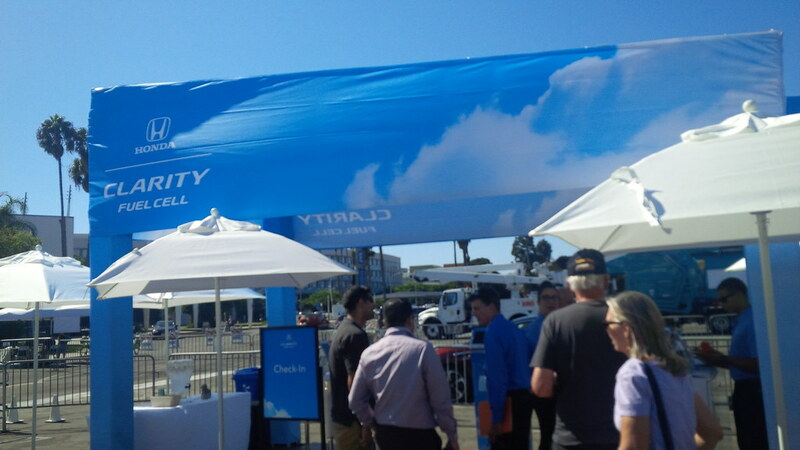 No “earth shattering” revelations and even the Model Y tease wasn’t really much. 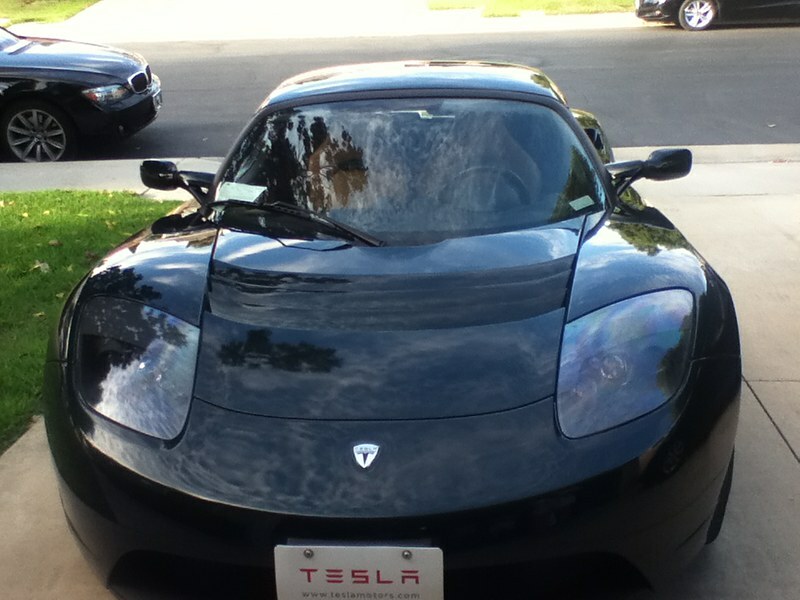 Still, it was a good way to cap the past few days of Tesla and Active E EV activities and we had a good time. 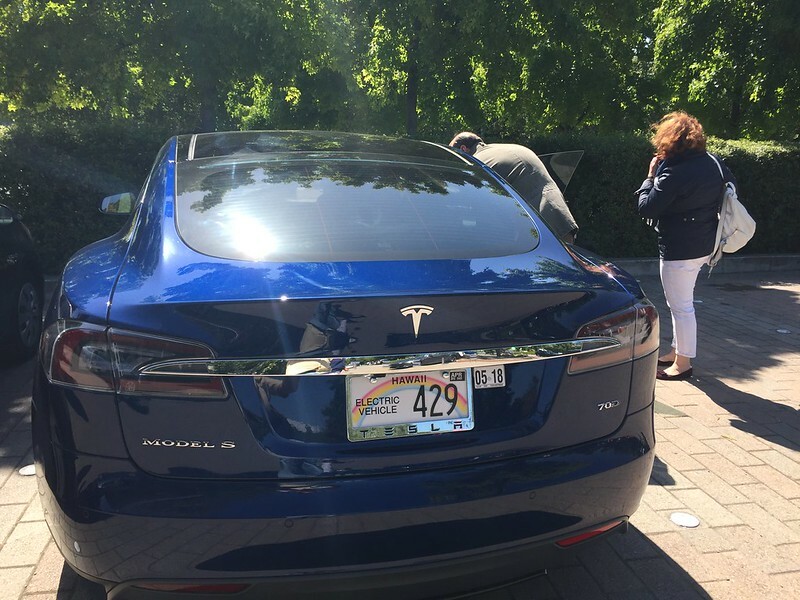 When we headed out, and finally caught a photo with the Model S with the Hawaii plate. 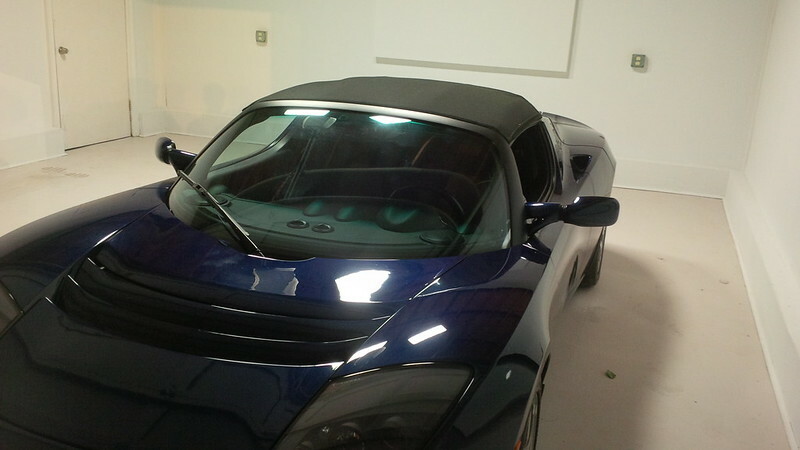 Great shot of the Roadster getting its 3rd party netting top. 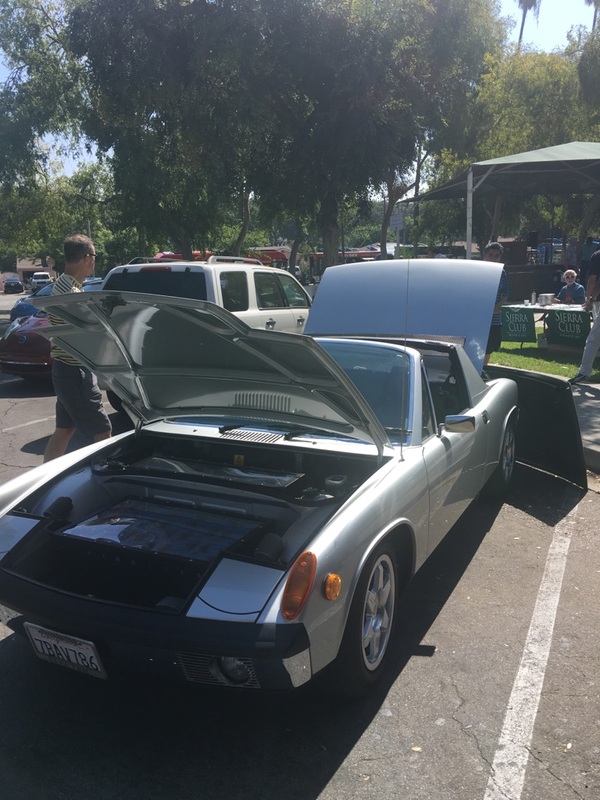 We need to find one of those for the better half’s Roadster. 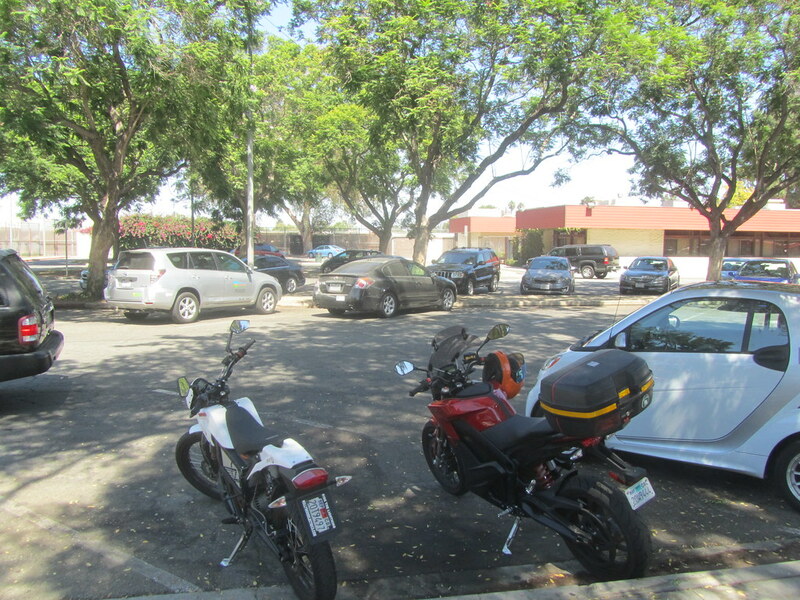 We spot a Zero Motorcycle on our way out of the Annual Meeting. 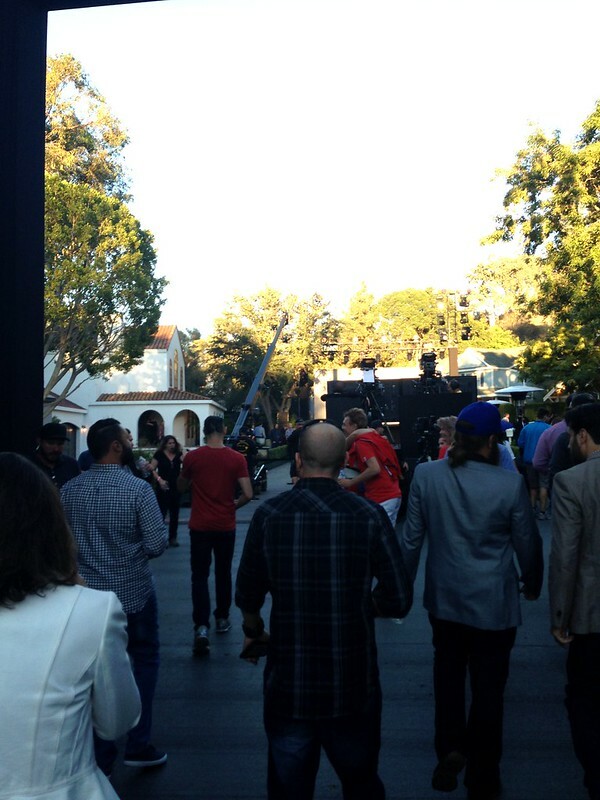 “Q: I’m guessing this is not official. 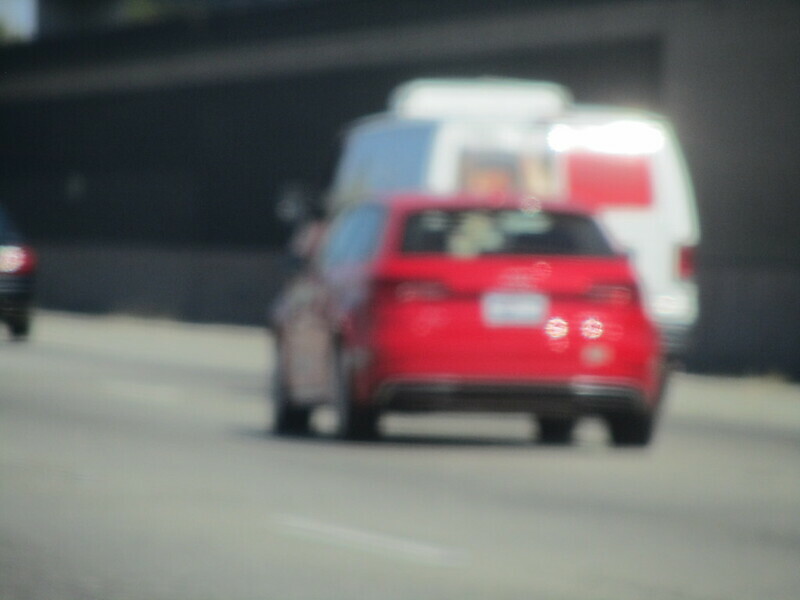 And what cars did we get to catch on camera? 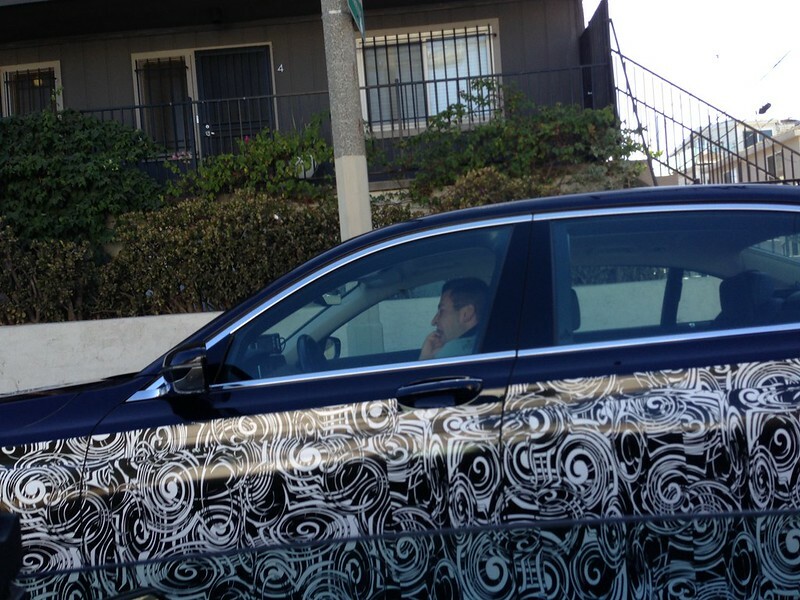 Well, unfortunately, we were only able to catch a couple of #EVBingo cars on this Rush Hour Traffic drive. 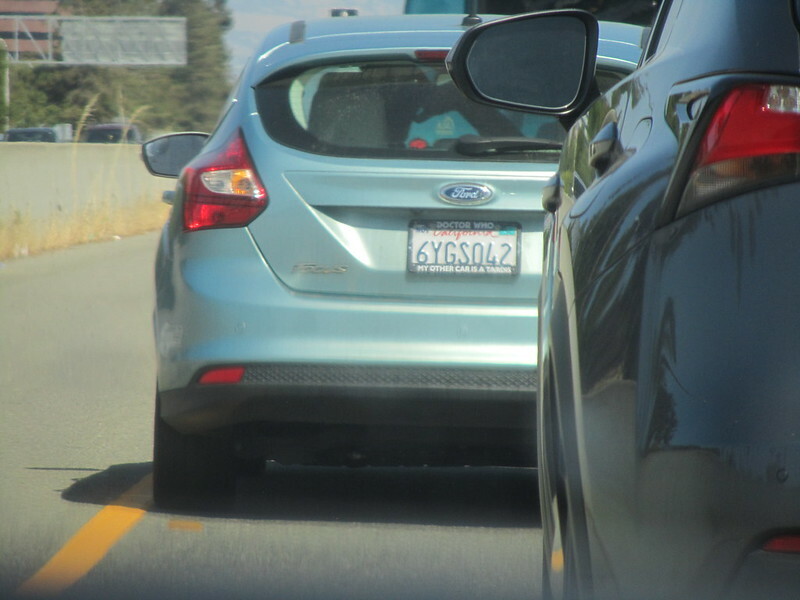 And the other EV Bingo car we captured on camera was the Ford Focus Electric that was a few cars ahead of me in the carpool lane. 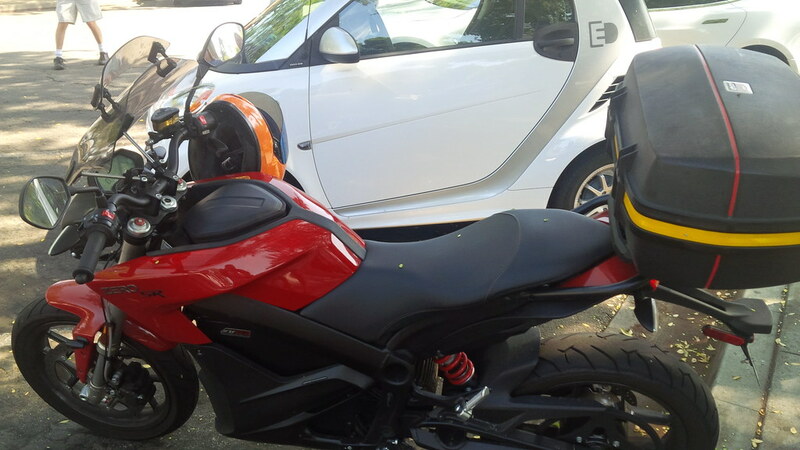 Tried to get a ruling on Zero Motorcycle, but we didn’t have points. So, that’s 361 before the California Handicap, and 180.5 after the 50% discount for the Bay Area spotting. 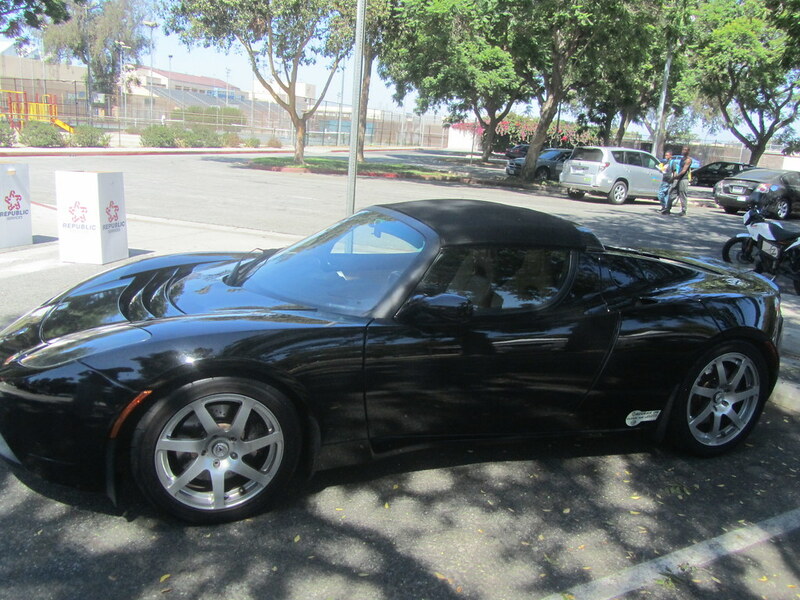 Just at the Annual Meeting parking lot and adjacent, supercharger. The total of 283 points, pre-California 50% handicap of 141.5 points. Which means that we have 644 total points (322 post handicap) before we leave the Bay Area/Silicon Valley area. I like to use the Gilroy Supercharger for the spot that we delineate these areas, so past that is between Metro Areas count. 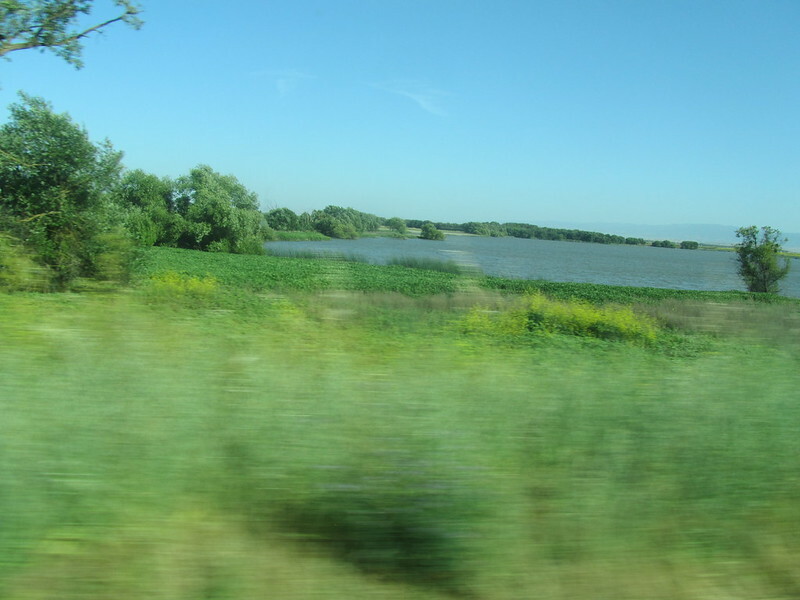 So, we head through, still mesmerized by the progress one really wet year has done for the state’s water levels. 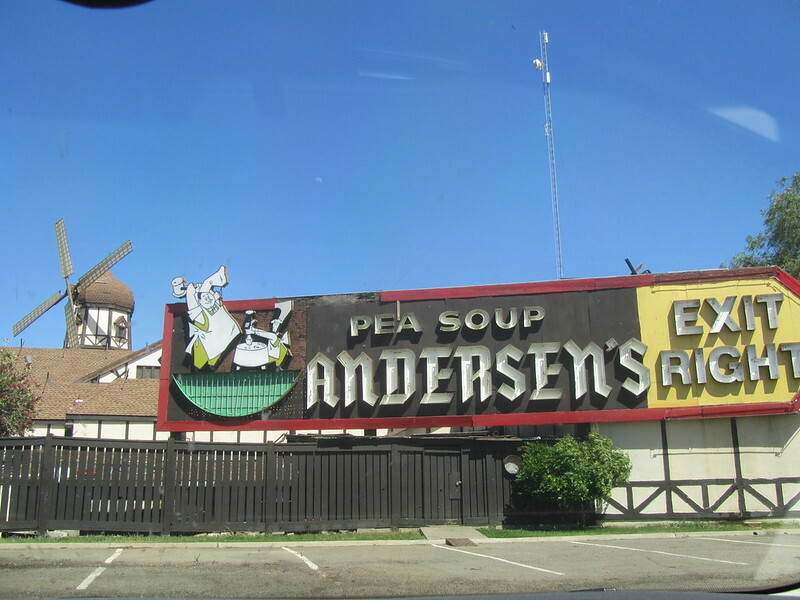 We pass that duck pond again. 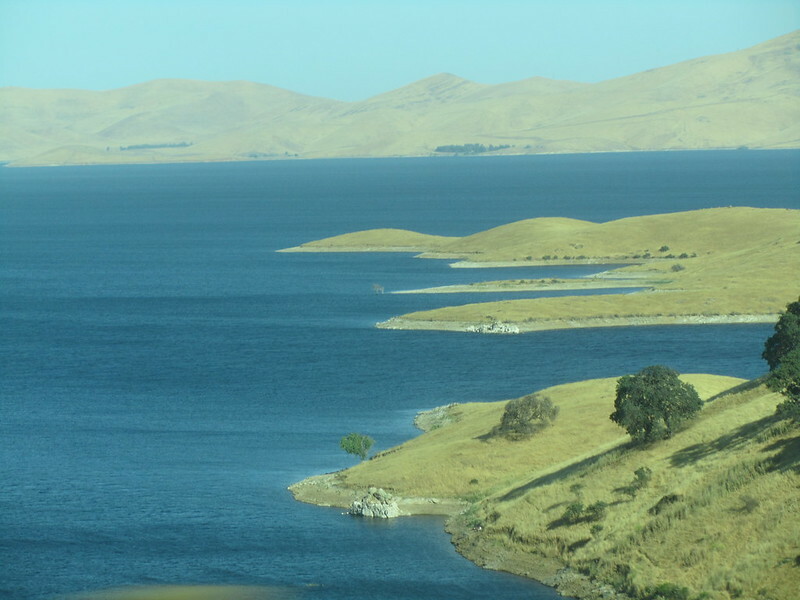 Furthermore, driving on the Southbound/Westbound side of this drive gives us better views of the reservoir to see how close to its capacity its been since the wet Winter that we’ve had. 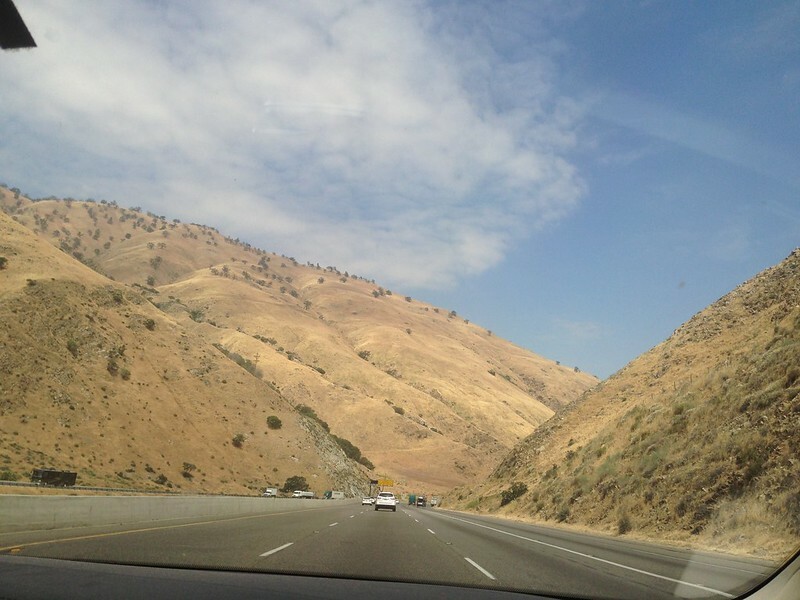 And it wasn’t long until we’re back on Interstate 5 again. 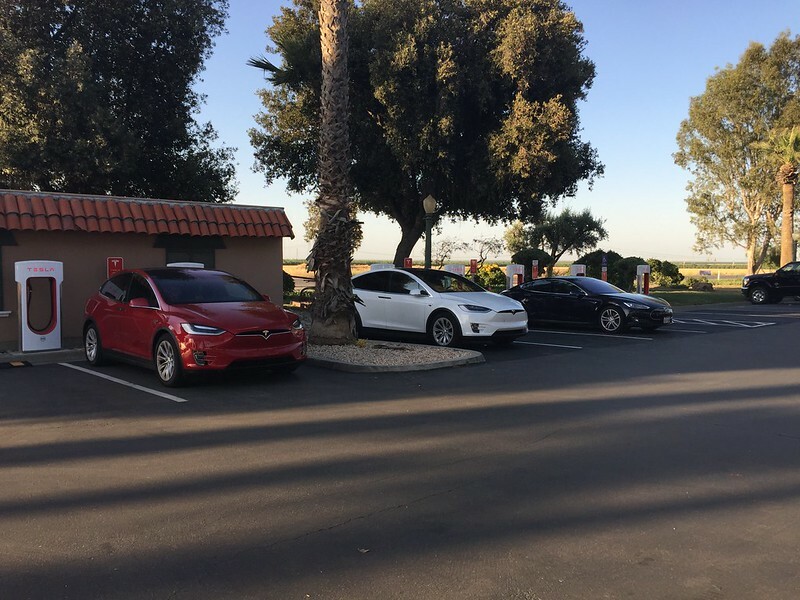 We stopped off at Harris Ranch for a big boost and had a Red, White, and Blue shot… Too bad we drive an S, and not an X, otherwise it would have been a cool Model X Red, White, and Blue shot. 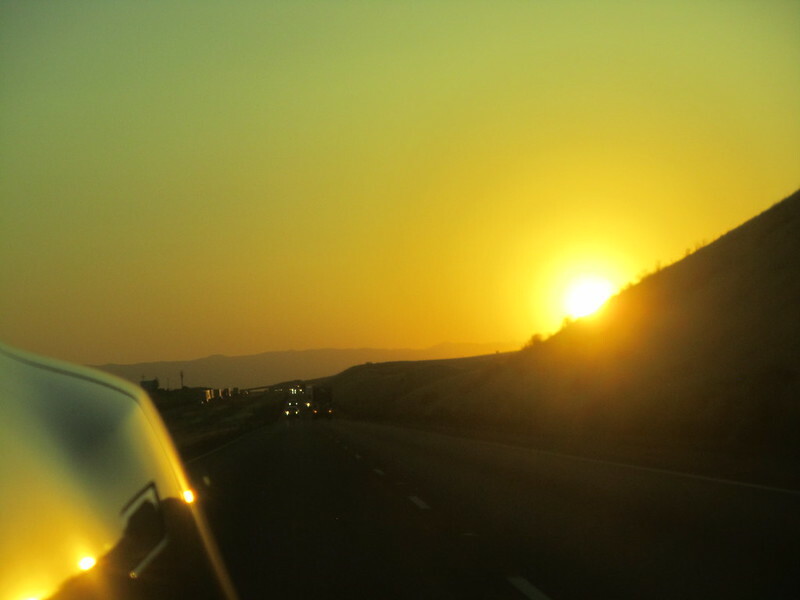 After leaving Harris Ranch, my better half played around with her camera with these great sunset shots. 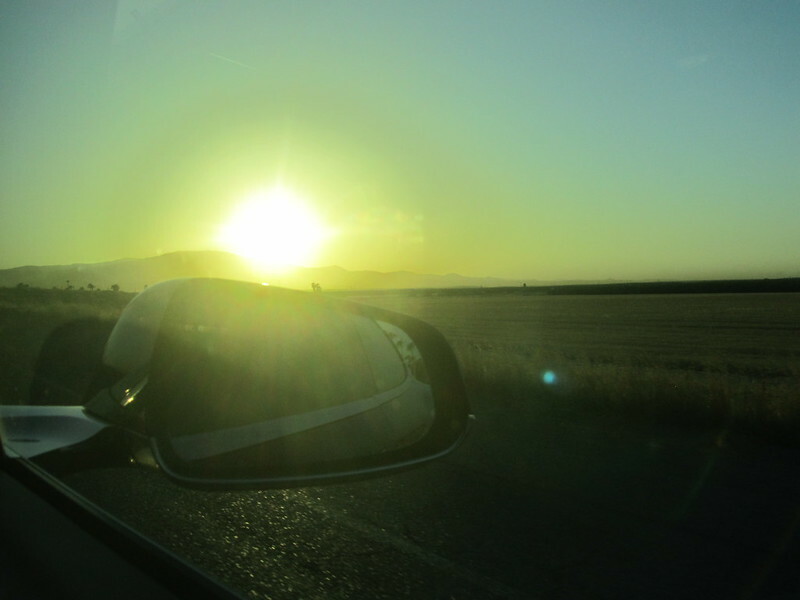 We were traveling in darkness for quite a bit of that drive back. Not as late as last year’s Annual Meeting, but still a quiet Tuesday evening drive. Even though Model S and Model X lights are easy to spot in the dark, we did a decent EV Bingo total of 39 points for inter-Metro travel. We even beat the total for the LA Metro. Granted, it was really late and we got home just after midnight. 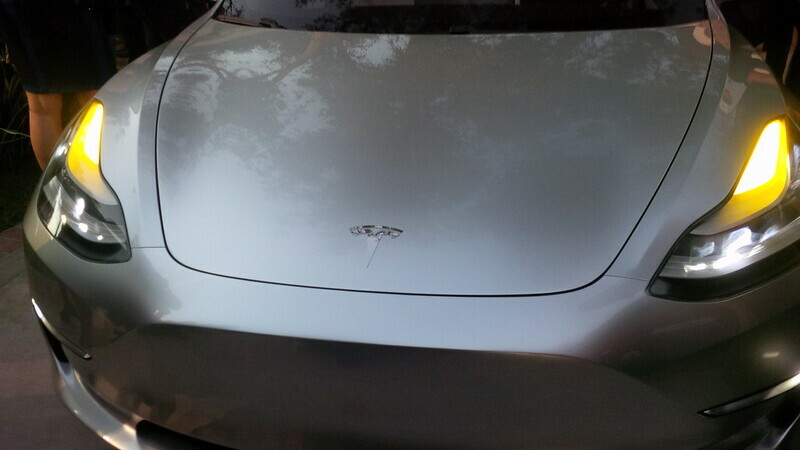 But we scored a pathetic 1 Model S spotted on the drive. That’s HALF a POINT after the California discount. At least we got home at a fairly decent hour. 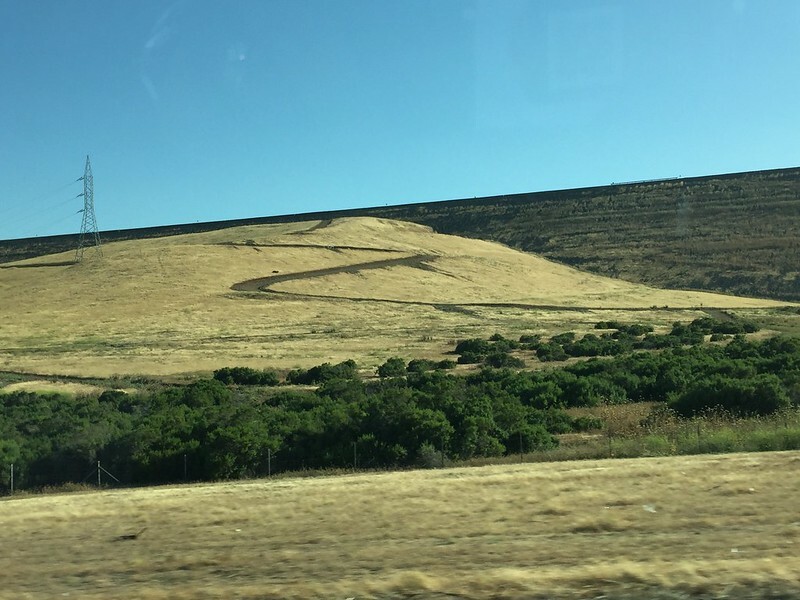 Lots of bugs gave up its life in this drive… And we’re glad that water restrictions have been eased. ’cause it felt good to clean this car. 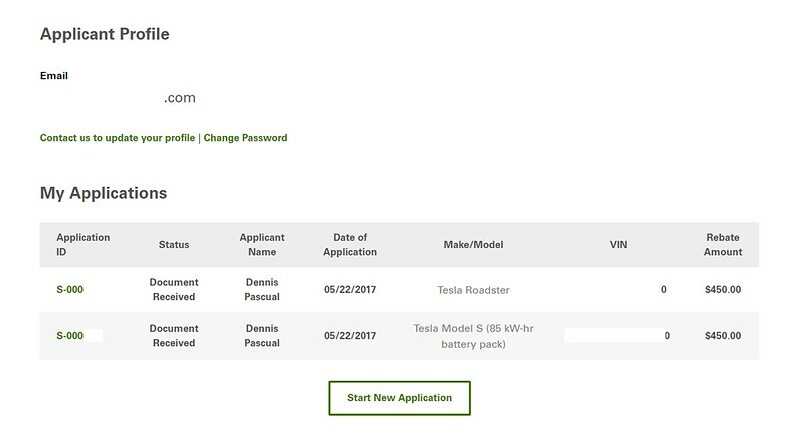 The beginning of June has been a jam-packed time for our EV life. 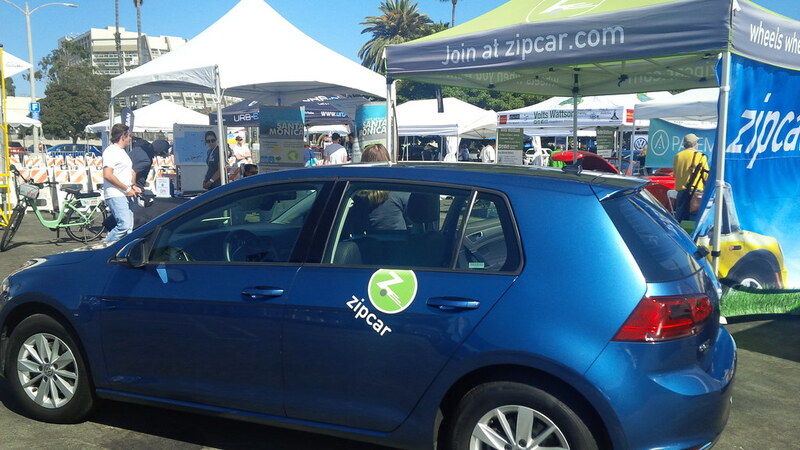 We packed three differing EV related events into six days on a trip to the Bay Area. Thus, this series of a trip in three phases. 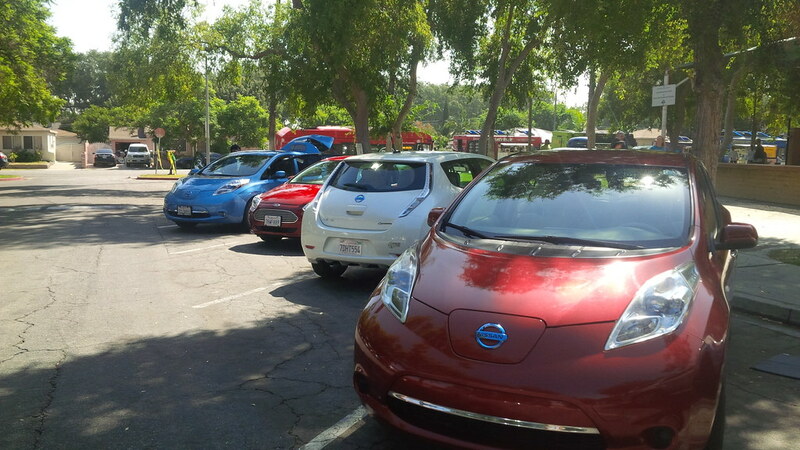 A few weeks prior to this trip, I’ve been playing #EVBingo with a bunch of fellow EV enthusiasts on Twitter. Derek Osborne, from Glasgow, Scotland sent the following Tweet and I became addicted playing this game with them since the last week of May. (We decided on Twitter to handicap California scoring from the US system that they came up with by 50%). 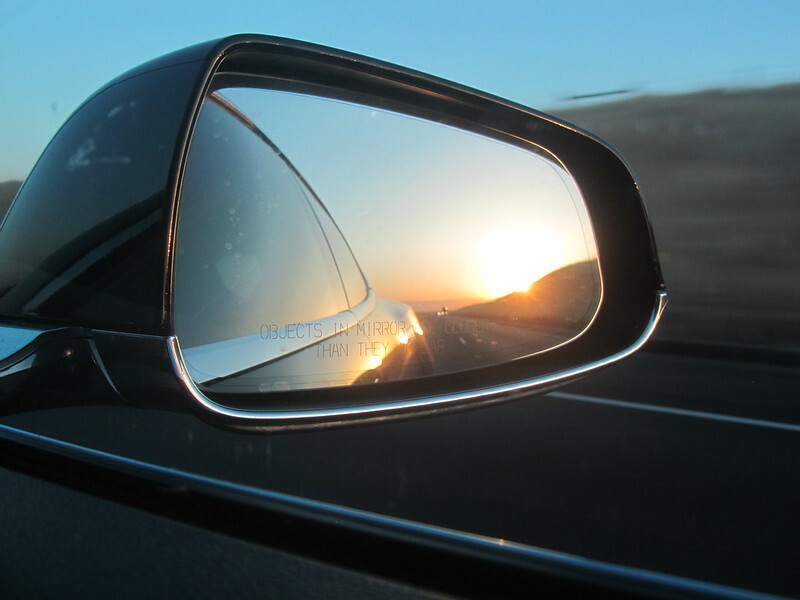 The game is played by tallying up the points for all the vehicles that is spotted on the road and adding the point totals. There’s a lot of EVs in California, so this particular game had to be handicapped for us at 50% the total value. 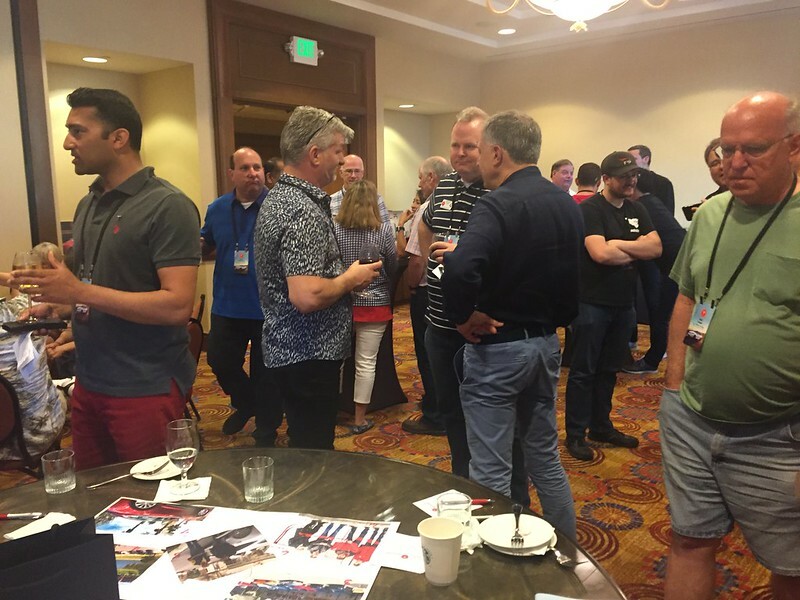 So, the first phase of the trip (June 1-June 3, 2017) was focused on meeting with the leadership of the official Tesla Owners Clubs and working with Tesla on the relationship between the clubs as well as the relationships between the club and Tesla. 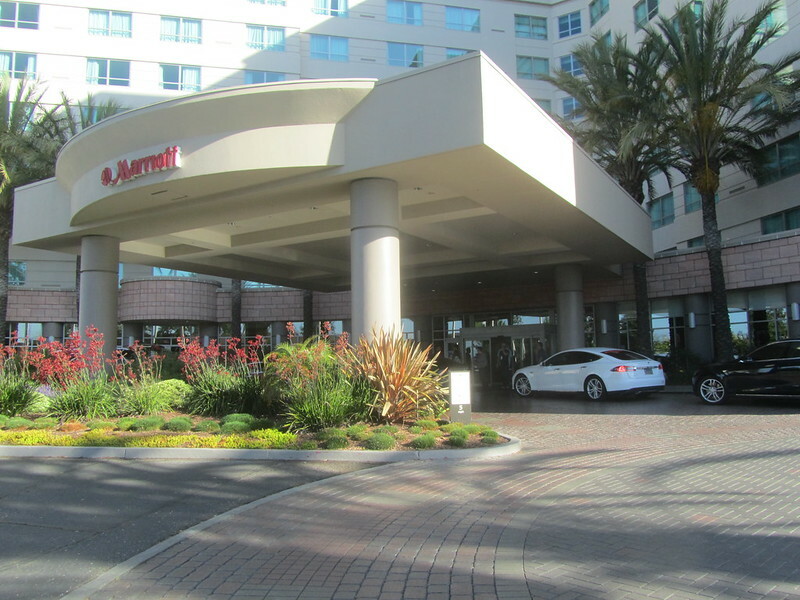 The drive on June 1st targeted arriving at the Marriott, Fremont (which is across the freeway from the Tesla Factory) in time for the evening reception for all the participating Tesla Owners clubs at the hotel. 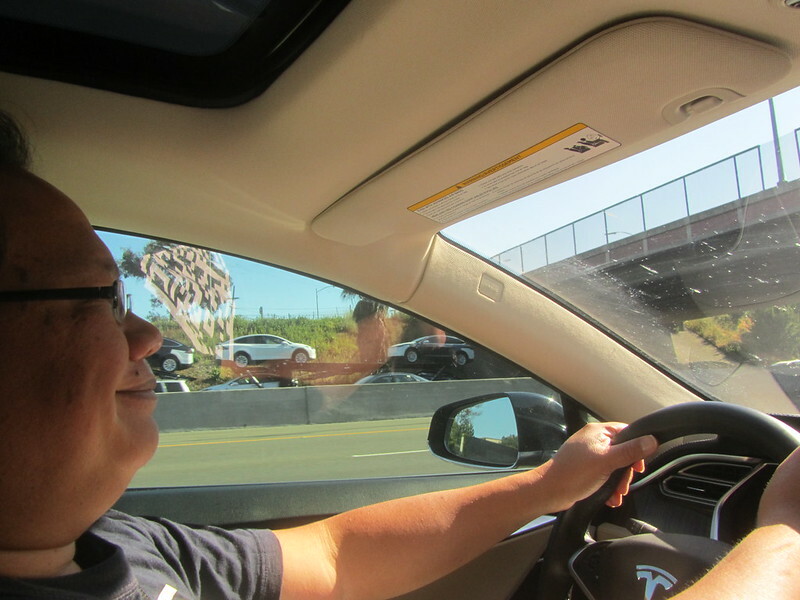 We left home and proceeded North through the I-405 traffic in West Los Angeles because of the #EVBingo addiction. 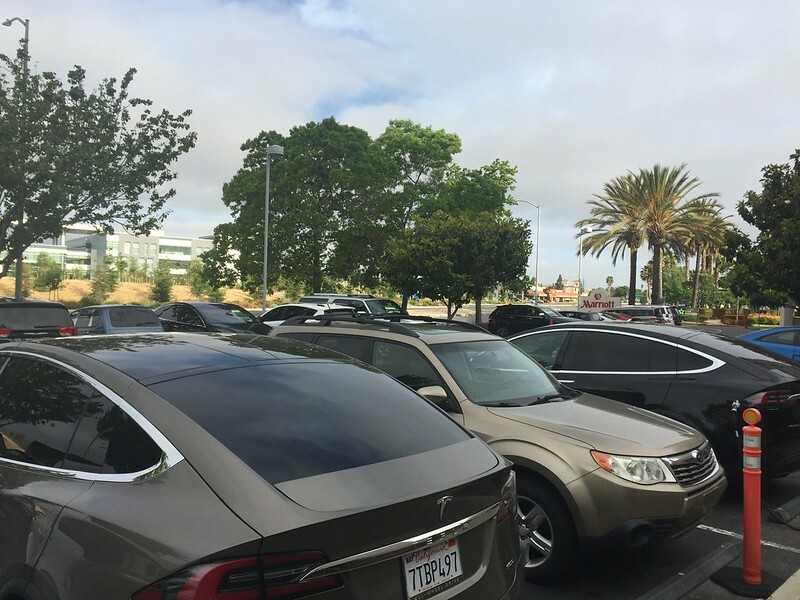 I figured to spot more EVs in the heavier, more direct West LA traffic than going the longer, but less populated route through the foothills. Even with my more direct, but heavier traffic route, the in-car Trip Planner only required us to make two stops to make our destination. 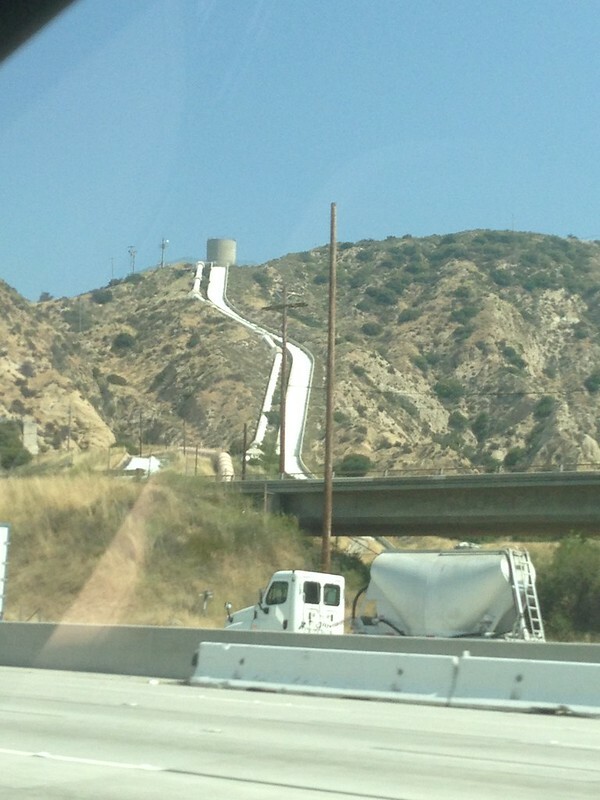 Before leaving the LA Metro area, we spot a very positive sight. 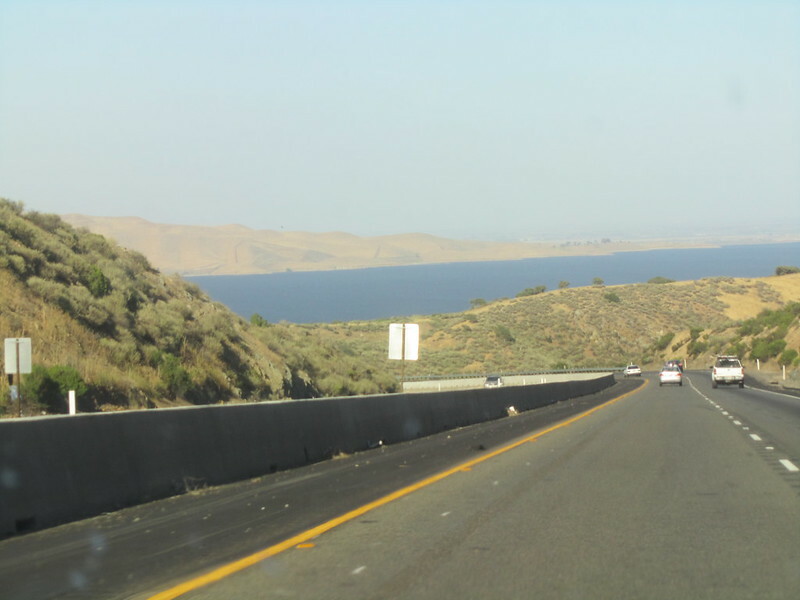 The California Aqueduct is flowing with lots of water again. Additionally, in the interest of figuring out how many #EVBingo points I would spot on the drive within the LA area vs. between metro areas vs. Silicon Valley/Bay Area totals. 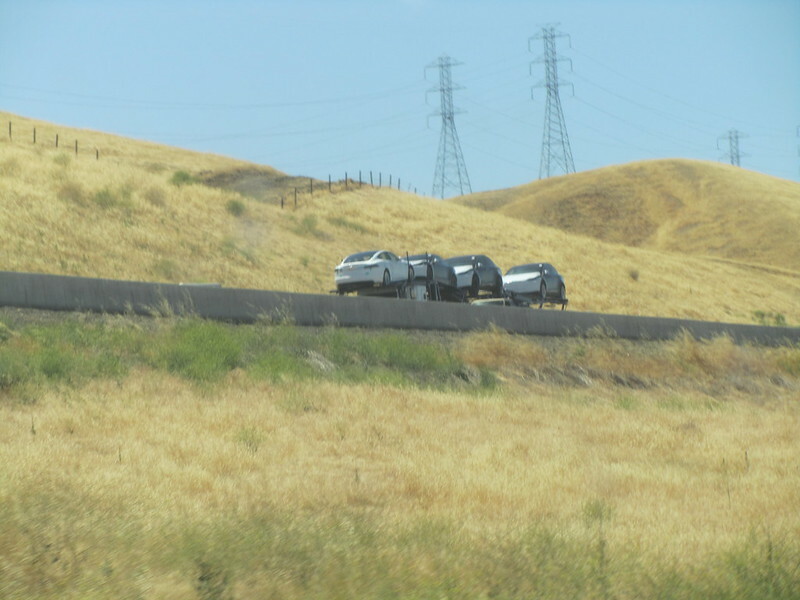 So, as we pass the California Aqueduct in the northern parts of LA County, we ran through our totals for the drive through traffic. So, before we headed into the parts of California in between the LA Metro Area and Silicon Valley/Bay Area, we did a quick total count. Which means that with the California 50% handicap, we’re at 337.5 points. 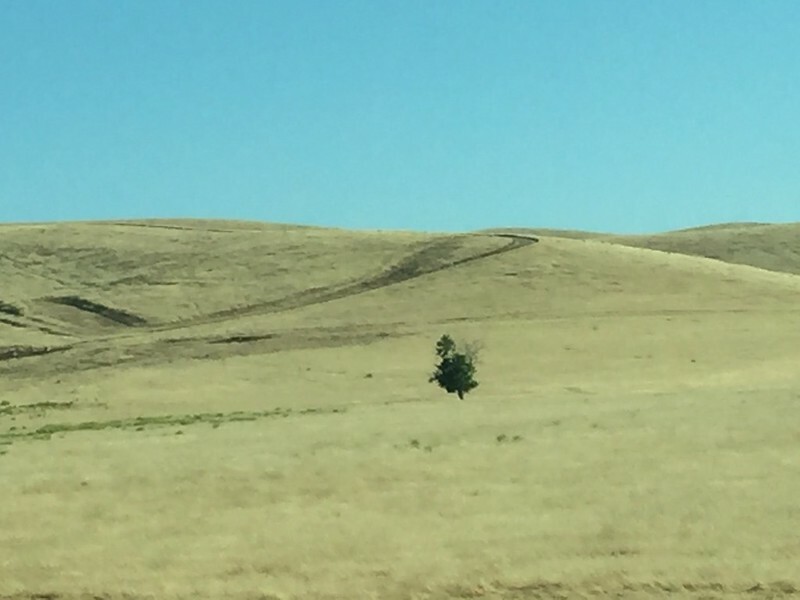 And we’re reminded of why California is called the Golden State. Dry Brush sure looks like gold. 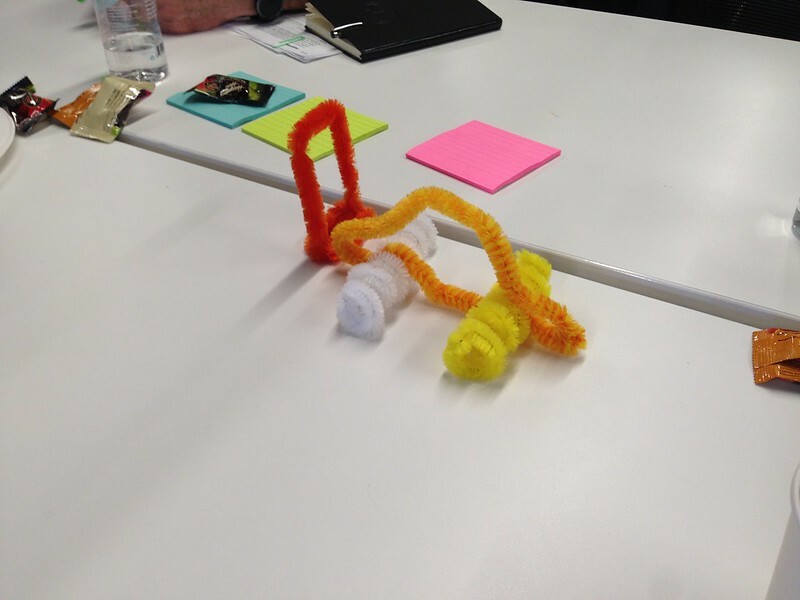 #EVBingo was not the only game that I was playing on the road. 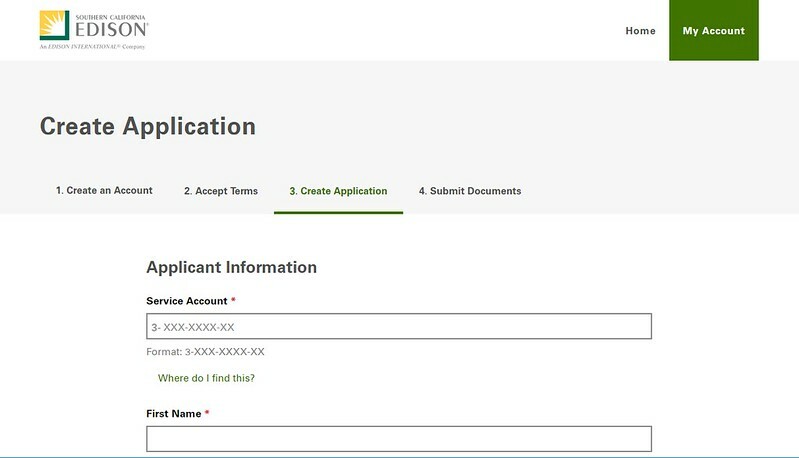 I was also helping beta-test TezLabApp (iTunes or Android) from HappyFunCorp. 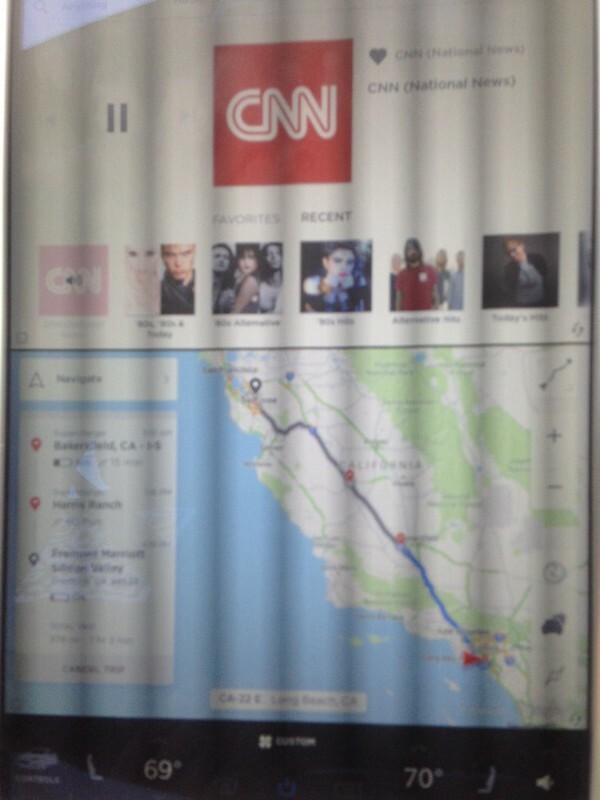 And one of the categories in this Tesla Social/gamifcation app is number of superchargers visited for the week, either for all the folks on the app, or your “friends.” So, I made a deal with my better half that we would stop in as many supercharger locations and plug in as long as we got to the conference in “decent” time. 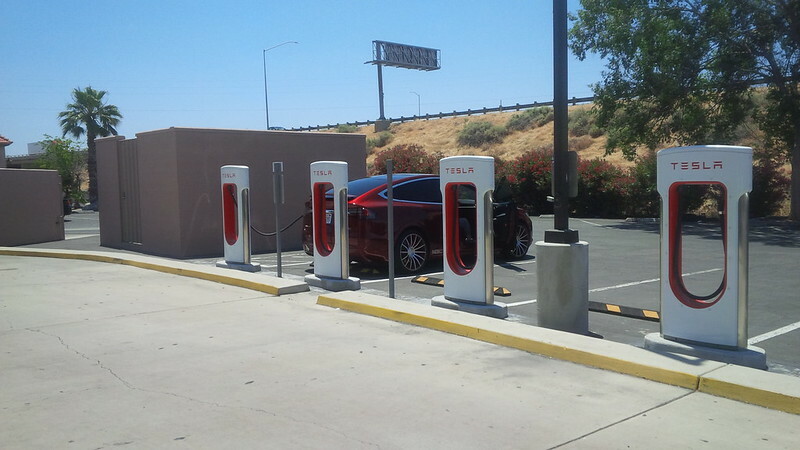 If you look above, the Tejon Ranch supercharger has four more supercharger stalls deployed. 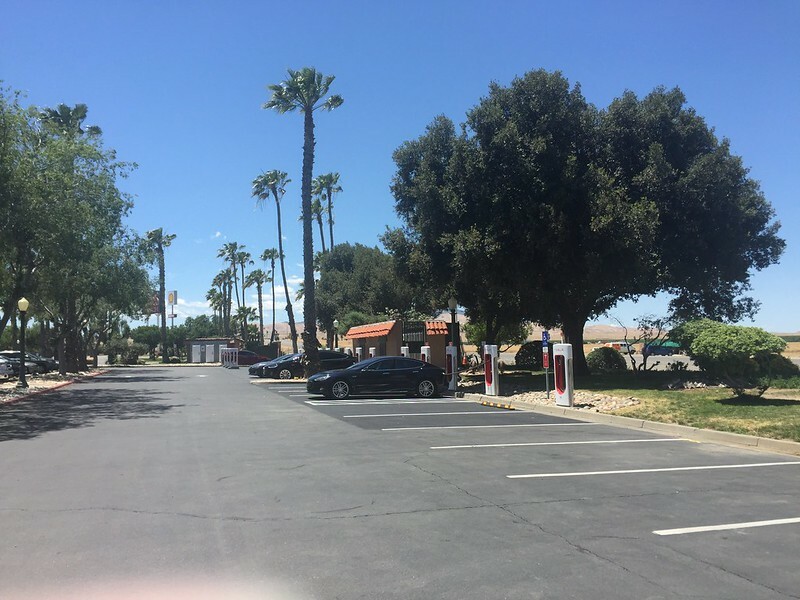 Granted, they are of the “mobile” supercharger variety, but this is usually an indication that further, more permanent stalls will be placed at this location in the future. 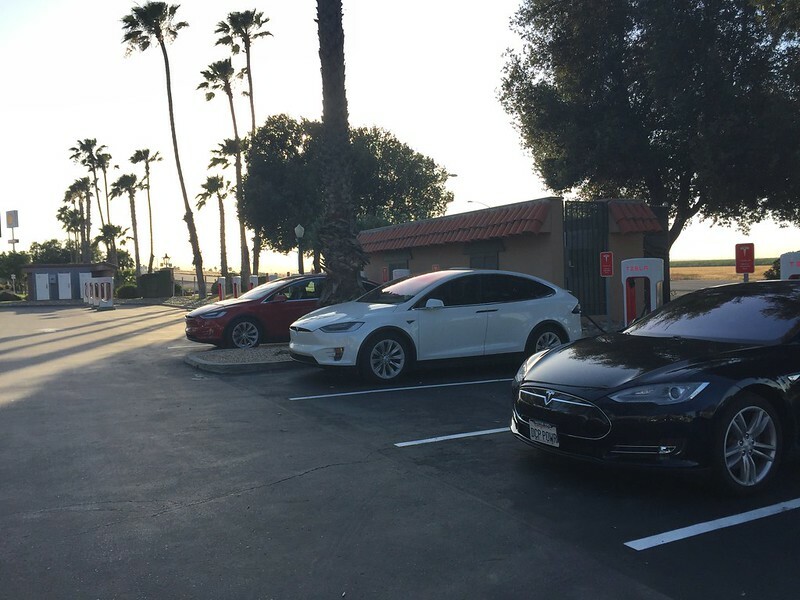 Our first new, to us, supercharger stop was at the Bakersfield Supercharger. 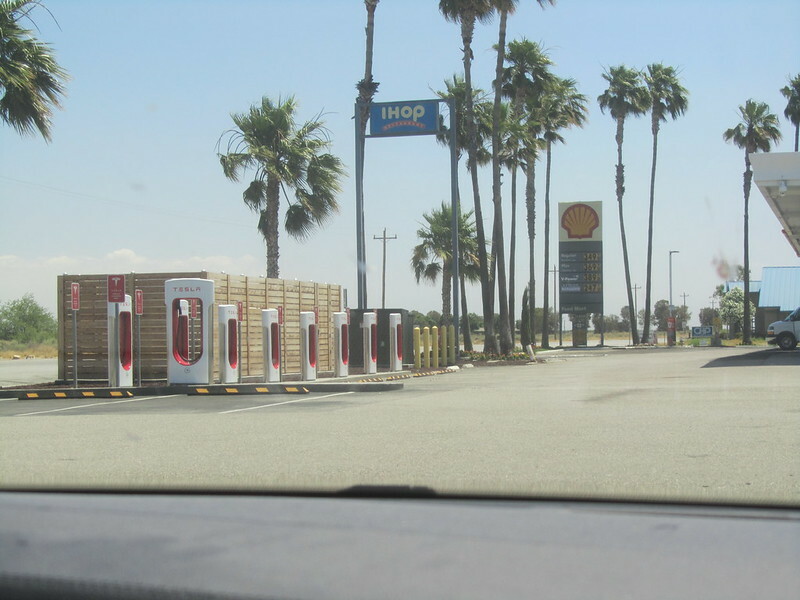 This location is interesting in that it is one exit South of the Buttonwillow Supercharger on I-5. Having stopped at Buttonwillow late night/early morning in the past, we can attest that this location with its placement at a gas station location (and IHOP, as well as being located a block away from the California Highway Patrol) makes it ideal for any late night supercharging that we may have to do on this route in the future. Our view while supercharging at the stall perpendicular to the rest of the installation has a nice view of the current gasoline prices on this route. 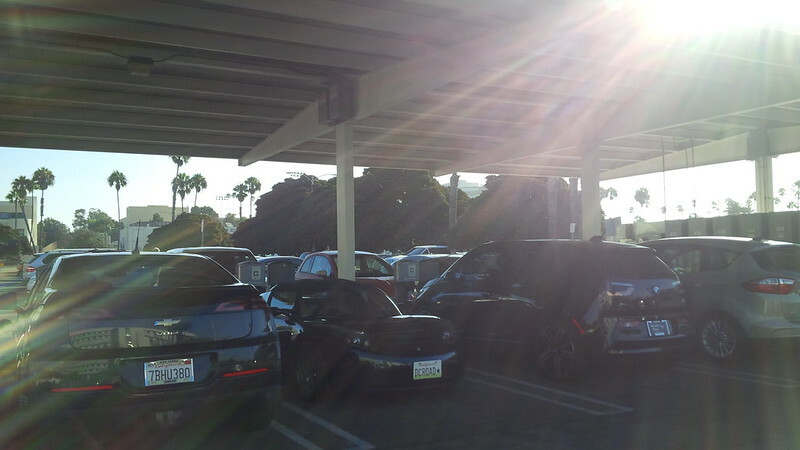 What it looked like behind me, before someone else was by to join us at the supercharger. The Trip Planner had us originally scheduled to stop and charge here for fifteen minutes before we headed to Harris Ranch. 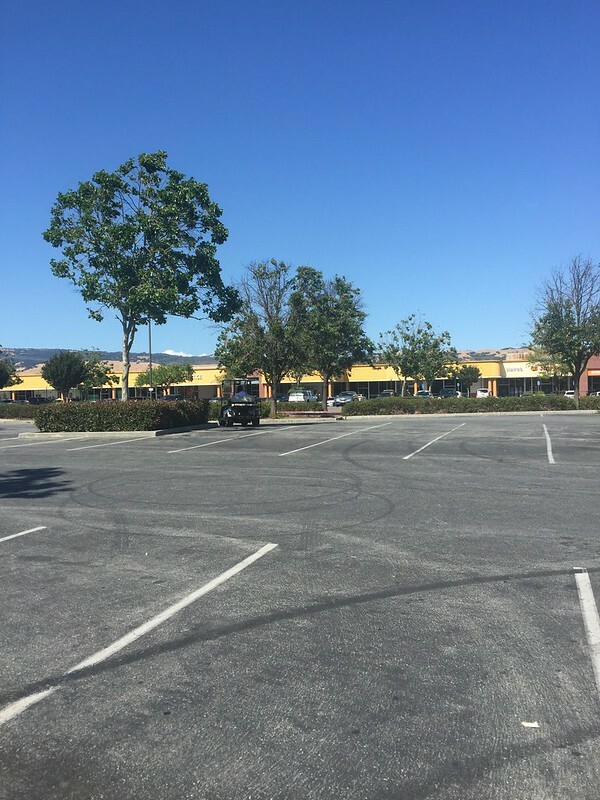 However, I was pining for some coffee and we knew that Buttonwillow (which is the next exit North of us) was collocated by a Subway and Starbucks. 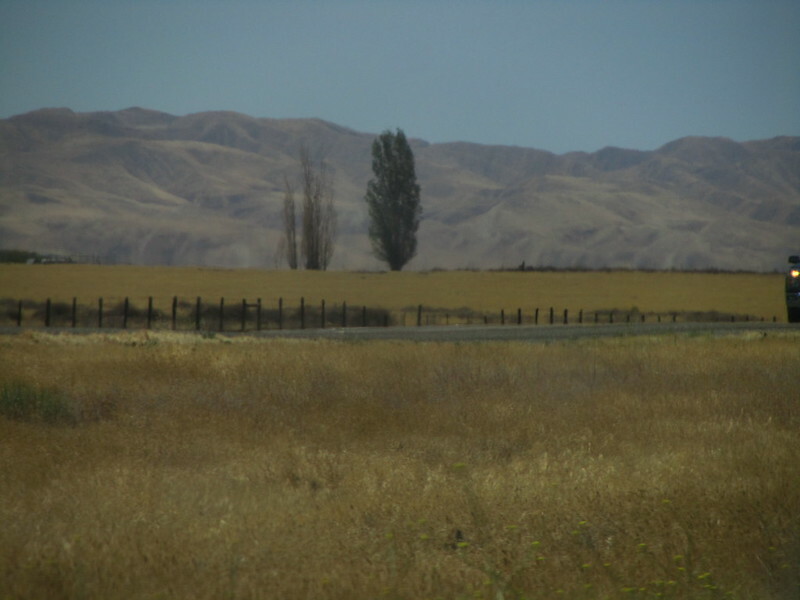 So, we unplugged and headed North. 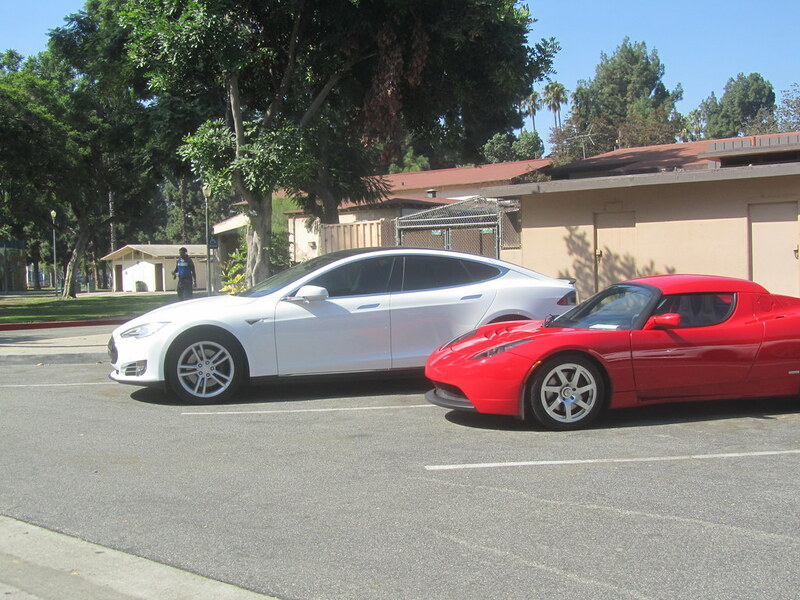 Moments later, this white Model X took the spot behind us. 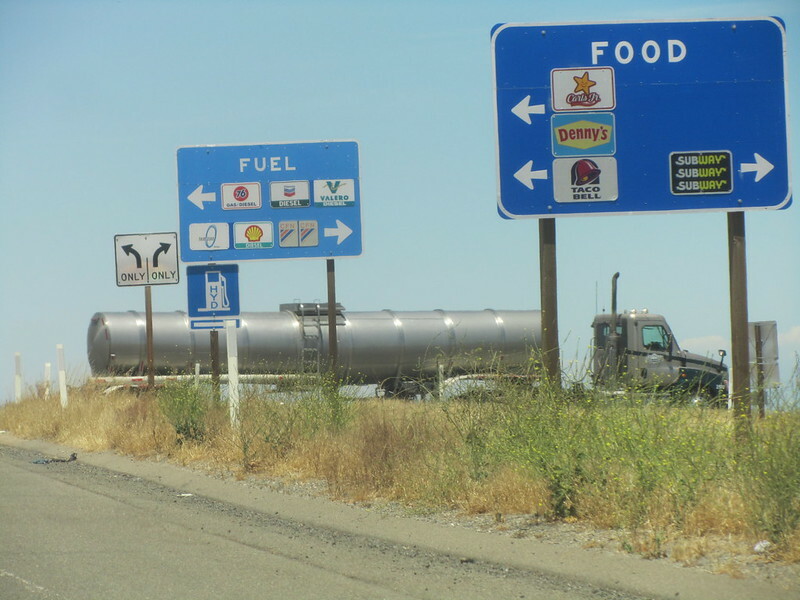 So, we headed to Buttonwillow, one exit North of the Bakersfield Supercharger. (approximately 3 miles, I believe.) As I previously mentioned, this stop had a lot more to do with the collocated Starbucks than anything else (that and getting the TezLabApp (iTunes or Android) points. 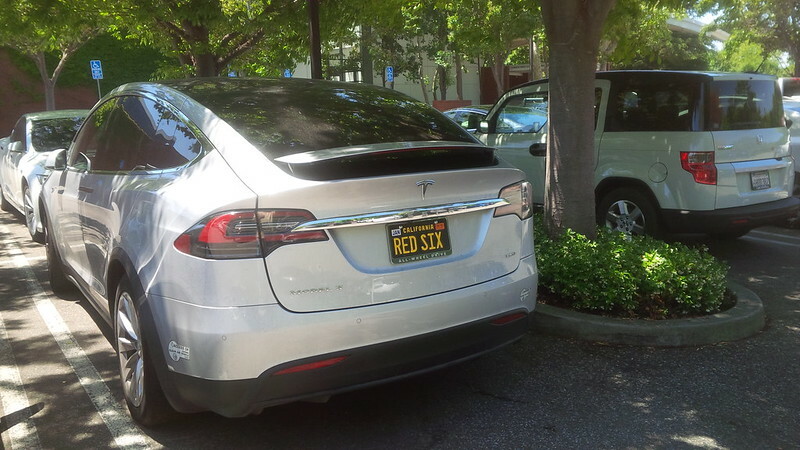 We were joined by a Signature Red Model X with some interesting rims. Getting our Starbucks order completed took longer than the recommended supercharging stop for our next stop at Harris Ranch. 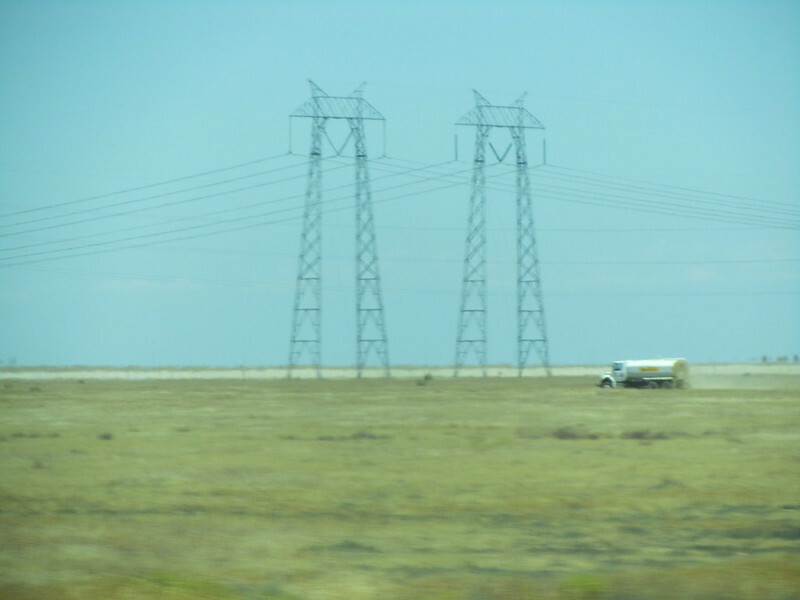 On the drive along the I-5, we’re reminded that as long as the grid has a connection, we’re sure to find a way to recharge any EV. 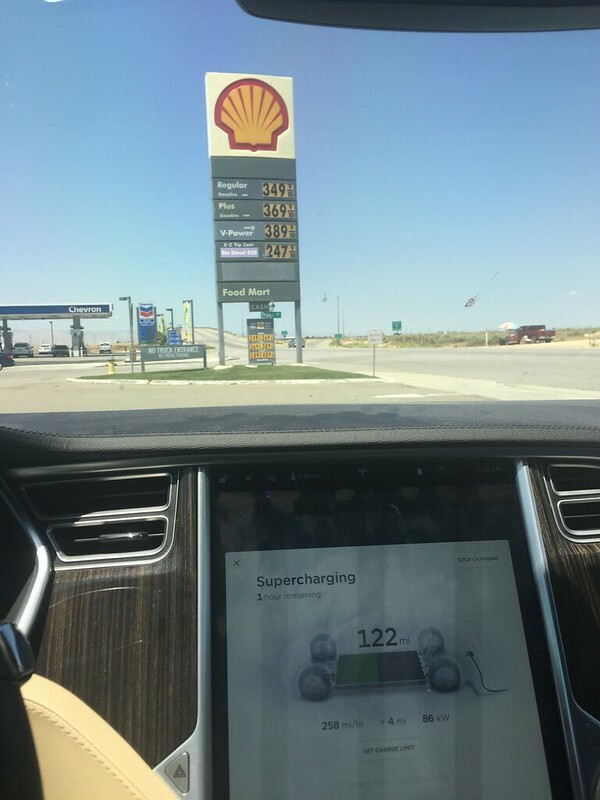 It’s just great that Tesla provides the supercharger network to do it in a quicker way than most other EVs. 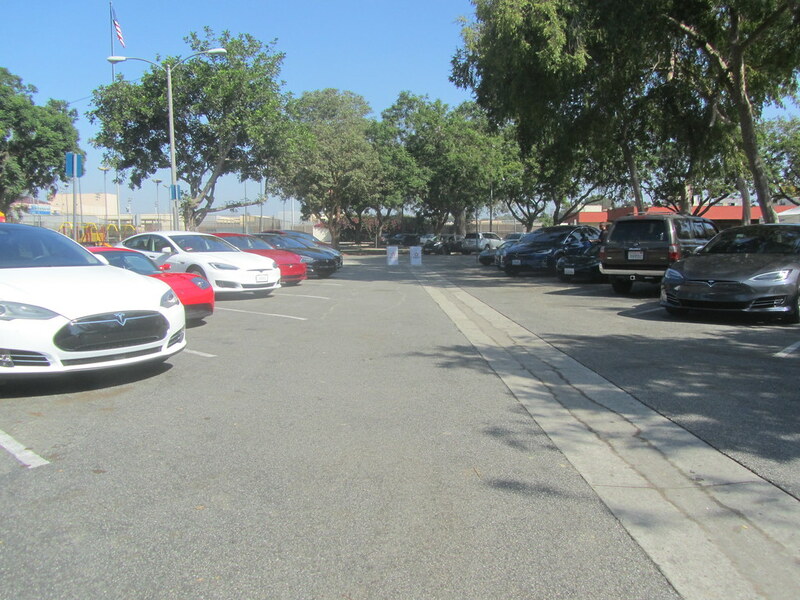 This site has expanded again for the third time and is now up to 20 supercharger stalls. It originally had six charger stalls, then 13 charger stalls, and now 20 supercharger stalls. The last two are reserved to be used last for handicap access. I made a mistake on this stop and charged there. I read the sign for the one I was using when we LEFT Harris Ranch, so I was charging at one of those two chargers that were reserved to be used last on this trip. To be fair, the last one was the extra-wide that is common for handicap access. 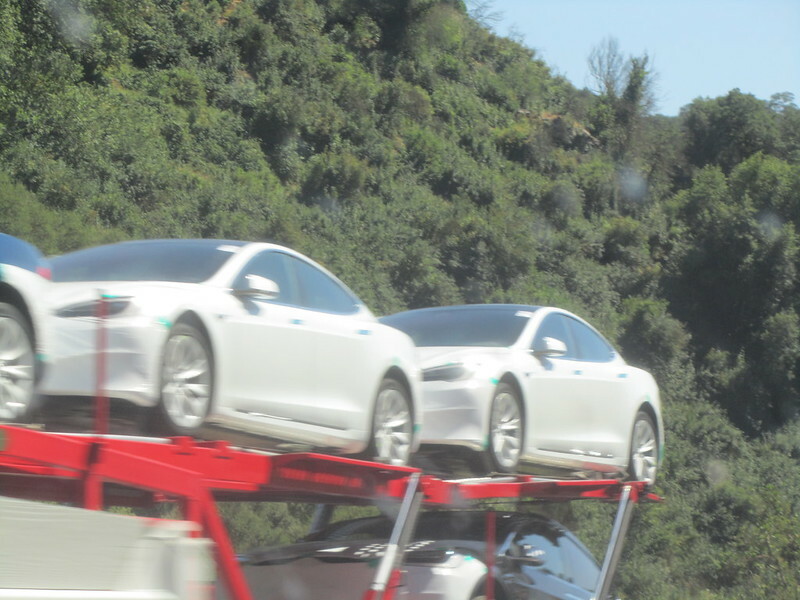 We’ve been spotting a ton of Tesla vehicles on car carriers on this trip, and we finally caught one on film. 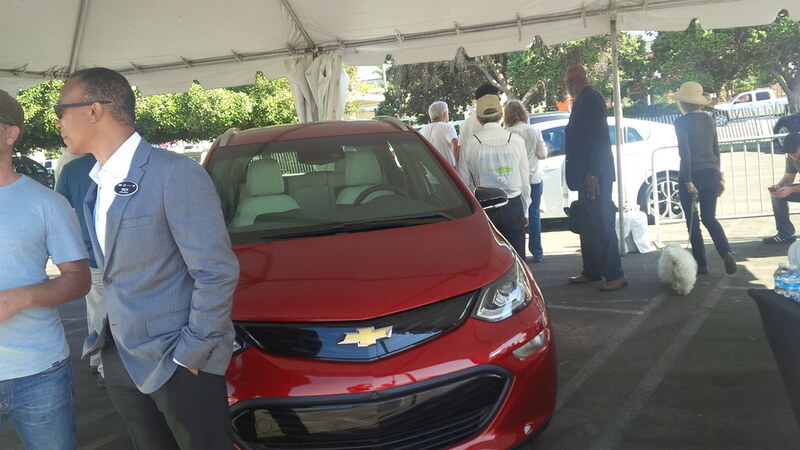 Luckily, the #EVBingo folks said that we can count EVs on car carriers that are NOT found in a dealership or Tesla Gallery. 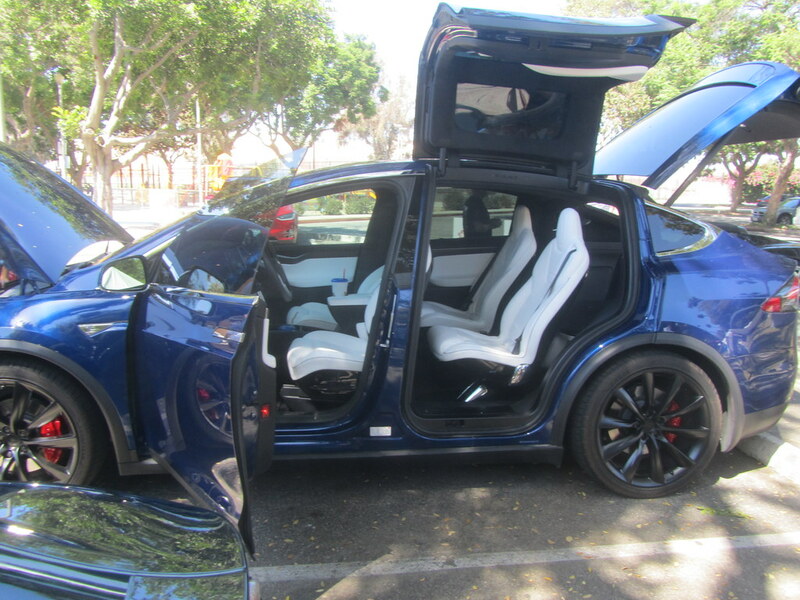 It seems that most of the Teslas on the transporters on this day are predominantly Model X. Though the better half caught this one carrier with a lot of S on it. 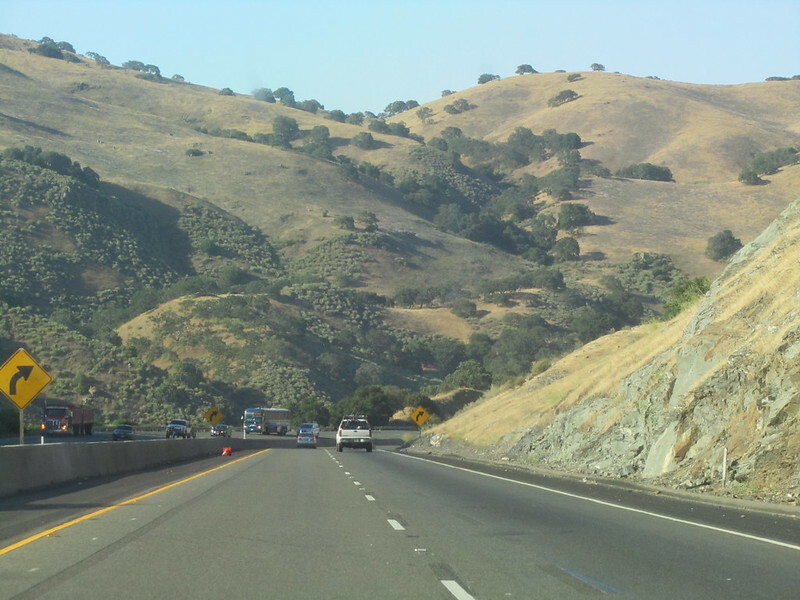 Before making the turn-off for Gilroy, we pass 77,000 miles. 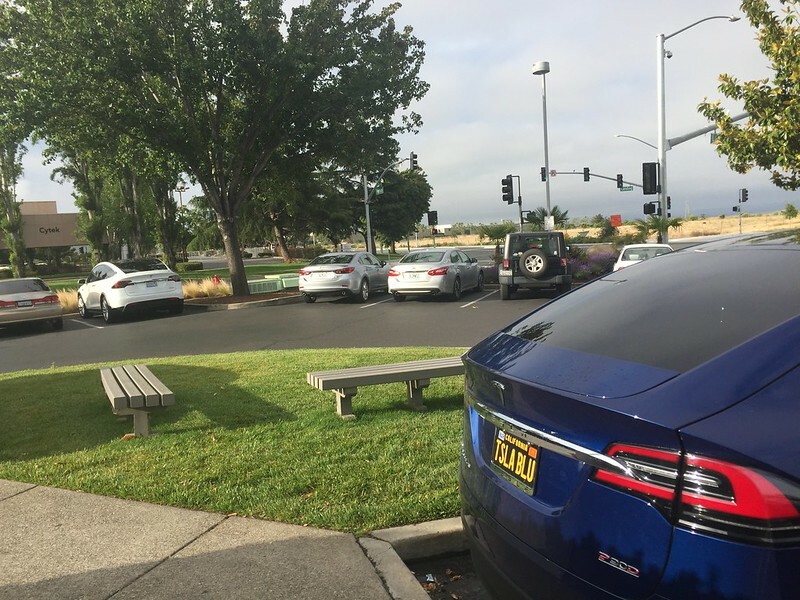 Now, the navigation didn’t require us to stop anywhere else, but it’s common practice for us to supercharge to near maximum at Gilroy so that we’re not so reliant on supercharging or destination charging while visiting hotels in the Silicon Valley/Bay Area. So, the warning below was for our destination for the evening. 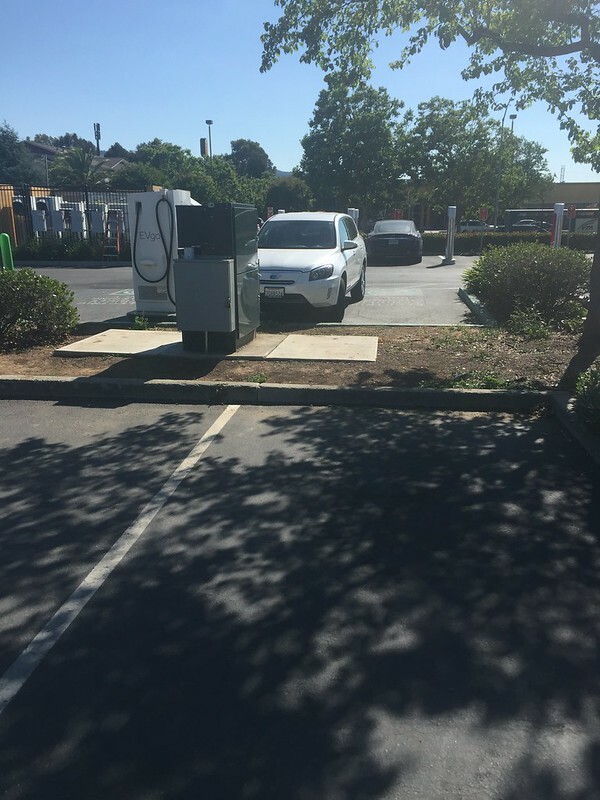 However, instead of going to Gilroy directly, we noticed that there is a new, to us, Supercharger at Gustline that was about a six mile detour from our route. So, we decided to go ahead and get the points for the TezLabApp (iTunes or Android) contest. 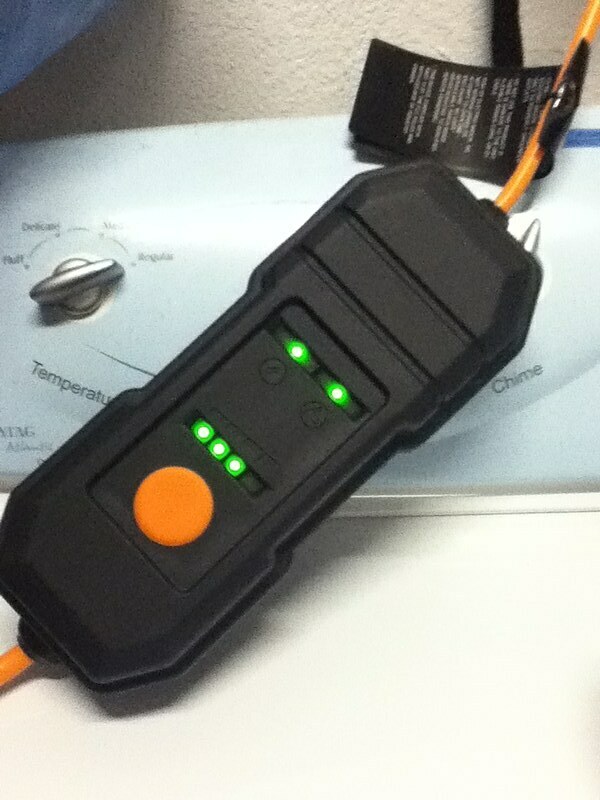 Have to be careful of the dip in the charging stalls. So, if one has air suspension, remember to use it before backing into the stalls. This is the view from our charging stall. We didn’t really need to stop, and after a few minutes of photo taking and documentation and obtaining TezLabApp (iTunes or Android) points, we headed to Gilroy. 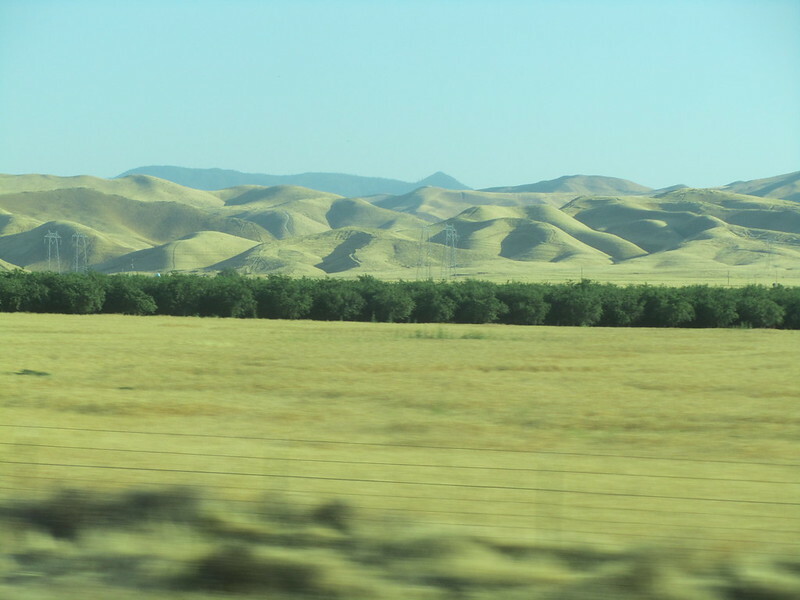 The drive to Gilroy we’re greeted with a welcome sight. 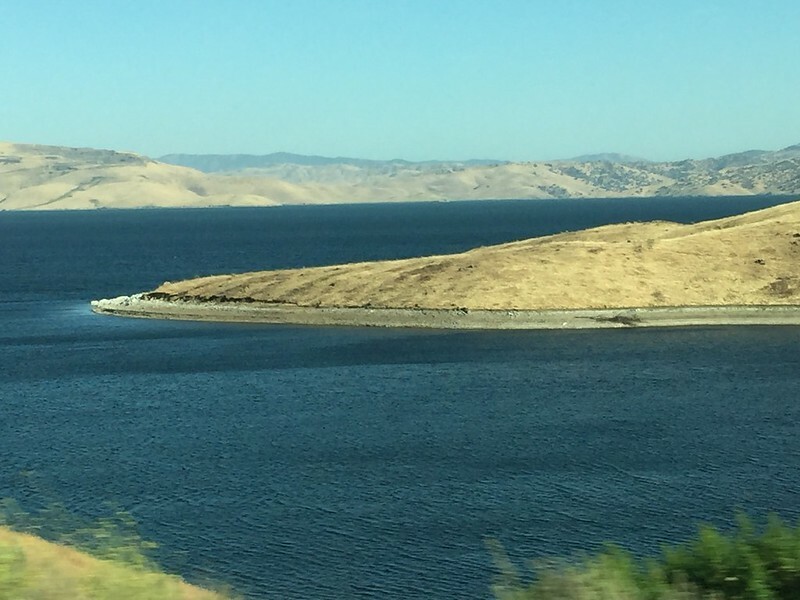 The reservoir that has looked rather parched in the past few years and previous trips looks like it’s almost at capacity. Even the little duck pond that we’ve passed has water in it again. 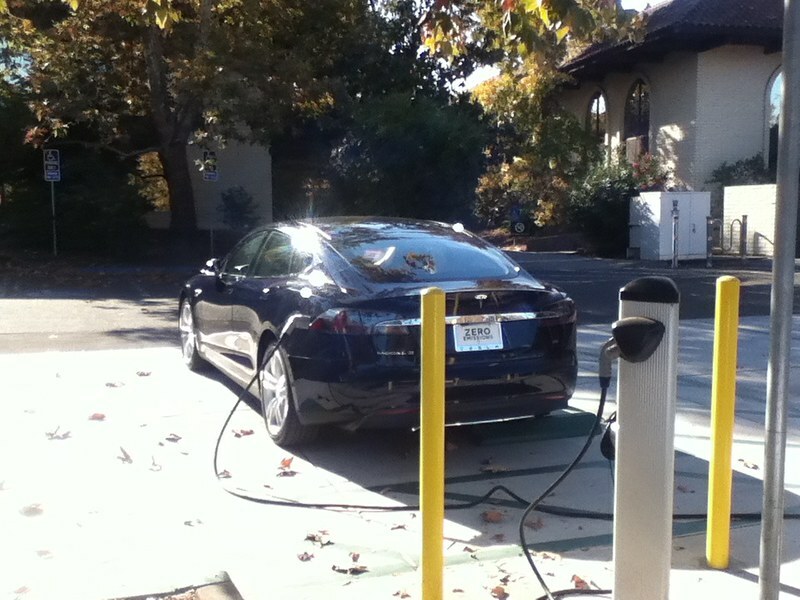 The Gilroy supercharger location is another of the original locations in the Supercharger network. 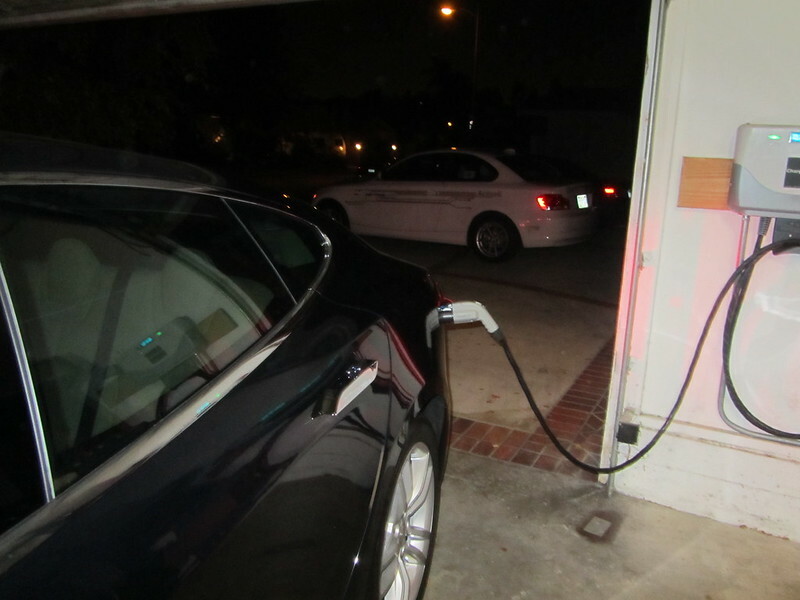 We decided to check out the newest four stalls and charged at one of them. 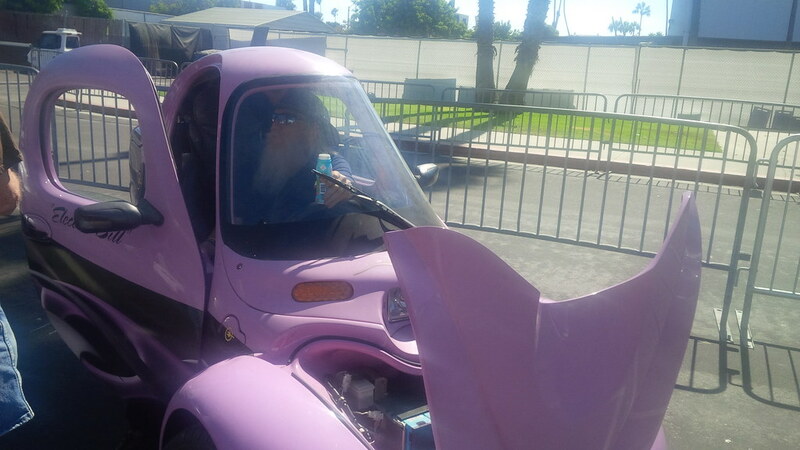 Spotted another EV (Golf Cart, which unfortunately has mixed consideration for #EVBingo). 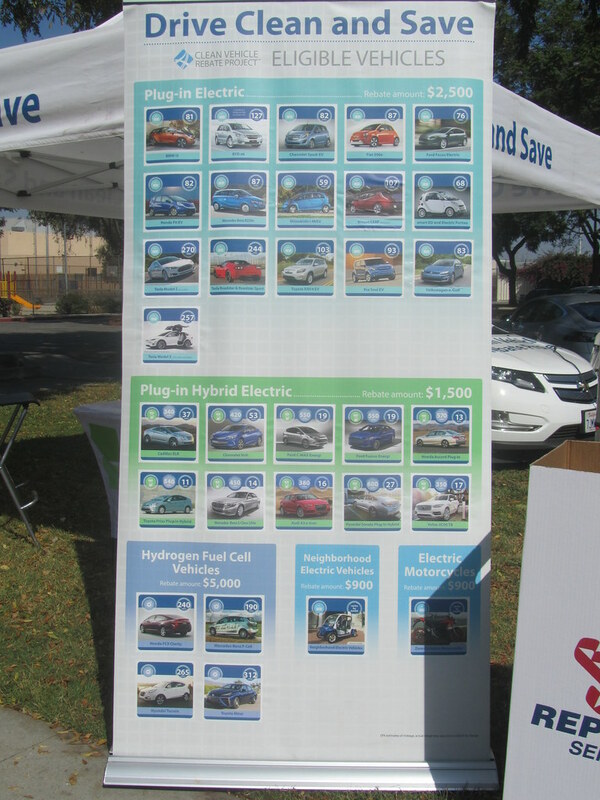 Did spot a JdeMO powered 2nd Gen RAV4EV pull up to the CHAdeMO/CCS station at Gilroy. Spoke with the owner for a few minutes before heading onward to the conference. 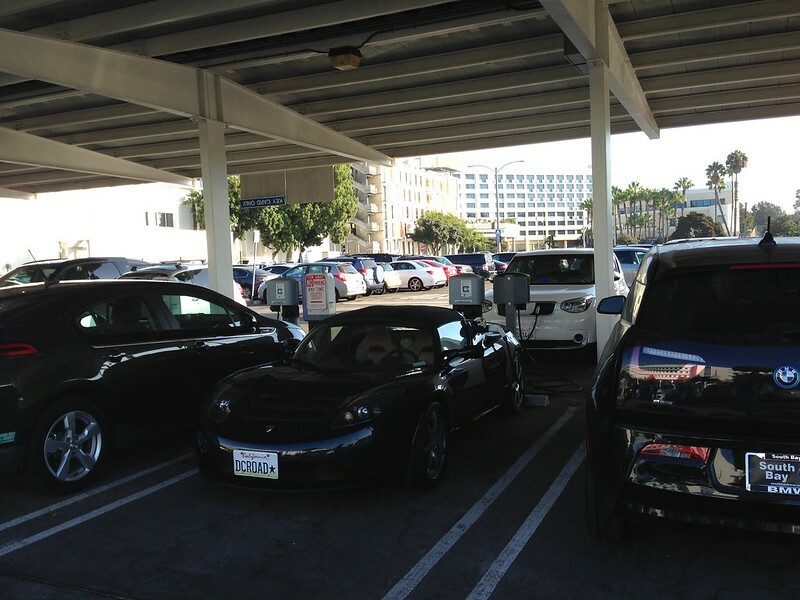 The JdeMO from QuickChargePower is a device that adds CHAdeMO DC Fast Charge capability originally for the 2nd Gen RAV 4 and now the Roadster. Which means that with the California 50% handicap, we’re at 181.5 points. Or 938 total points without the handicap or 469 points after the 50% handicap, for today’s drive, so far. 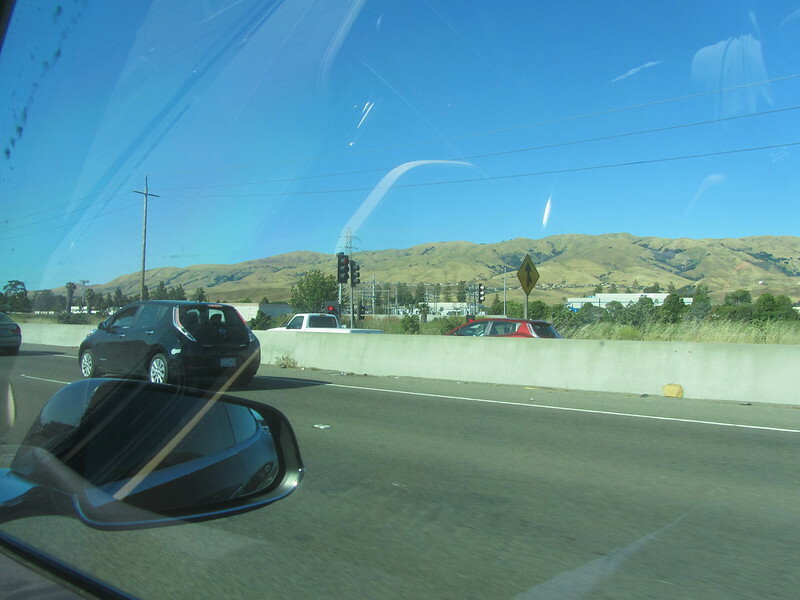 We headed from Gilroy to the Fremont Marriott and for more metro-area #EVBingo, in the middle of Silicon Valley Rush Hour traffic. 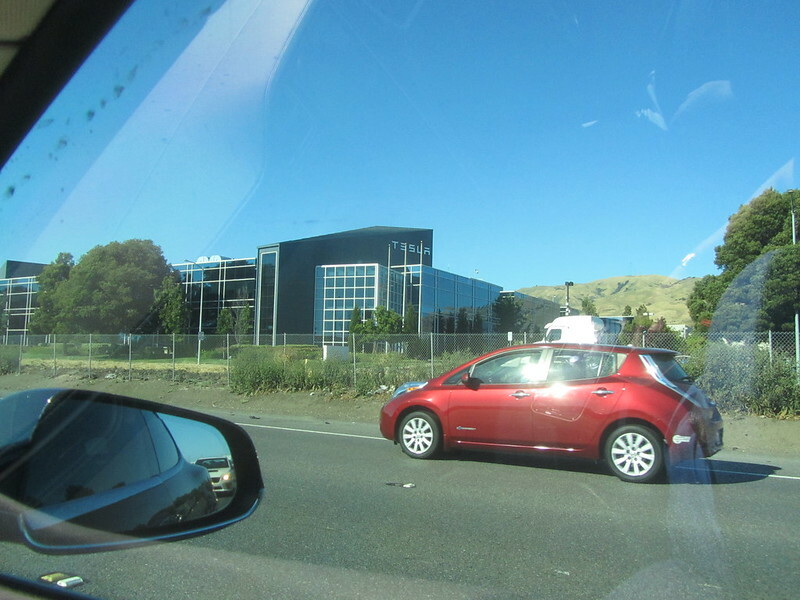 And another Tesla filled Car carrier on the other side of the freeway. 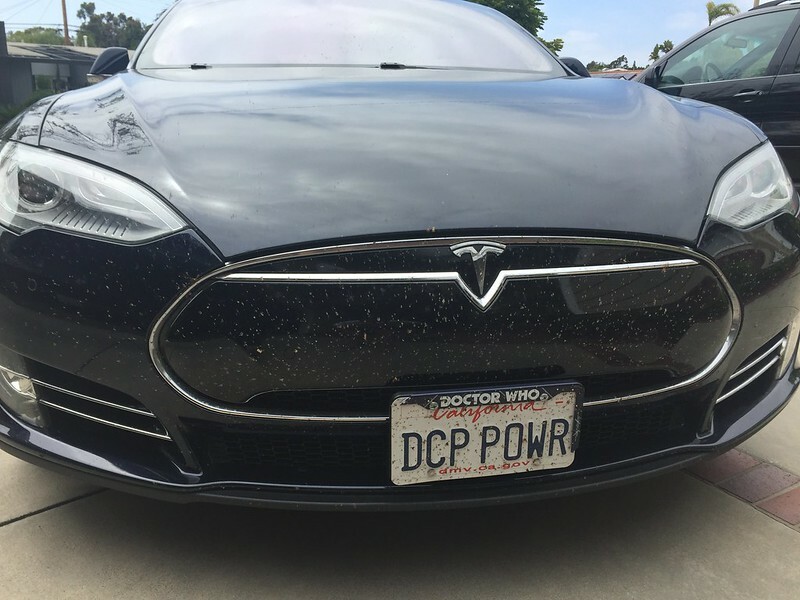 It wasn’t just Teslas in this part of the drive. There seemed to be an inordinate number of LEAFs in traffic with us. It was not uncommon on this part of the drive to catch a few LEAFs at the same time. It was like a flashback to 2012 or 2013 when it seems that every other EV was a LEAF. 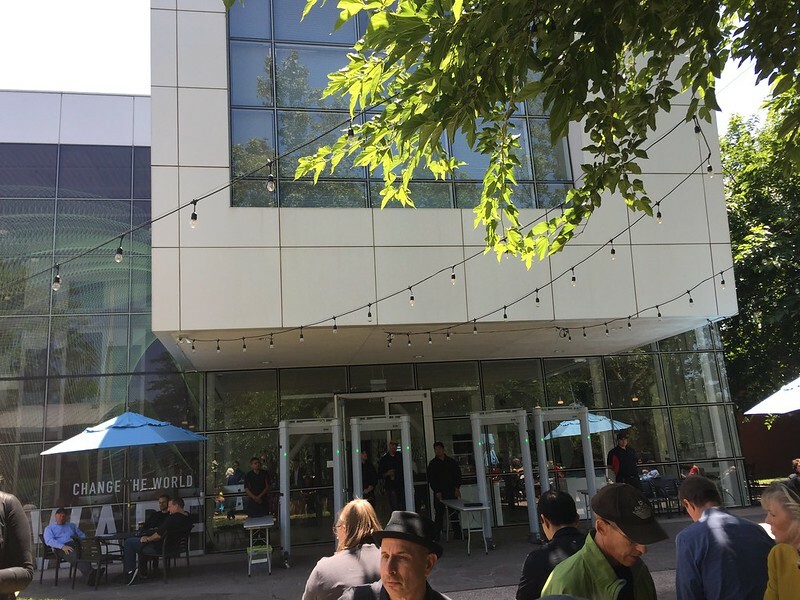 Here’s an interesting shot that my better half and co-pilot captured with the former Solar City location sporting Tesla signage and one of many LEAFs that we spotted for #EVBingo in the Silicon Valley area. 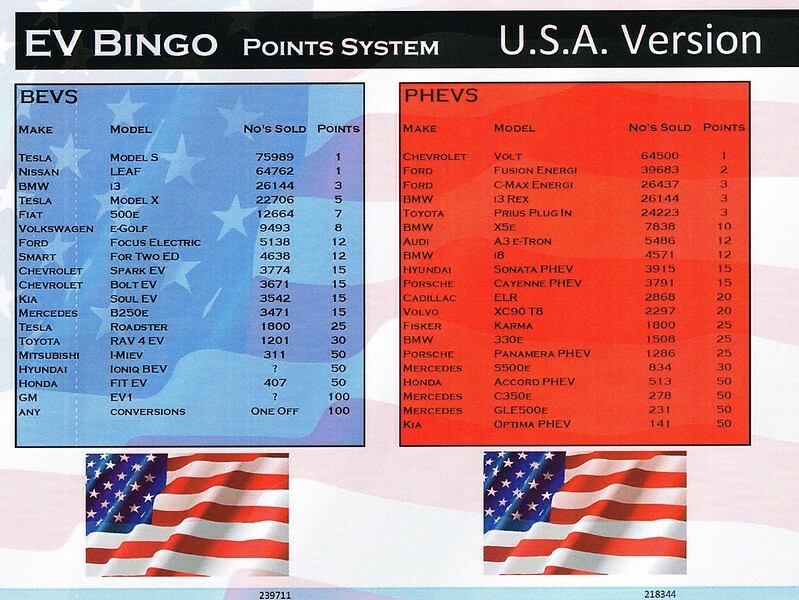 Before heading down to the Tesla Owners Club Leadership Conference Thursday Reception, we do a quick #EVBingo tally. Which means that with the California 50% handicap, we’re at 204.5 points for Silicon Valley. 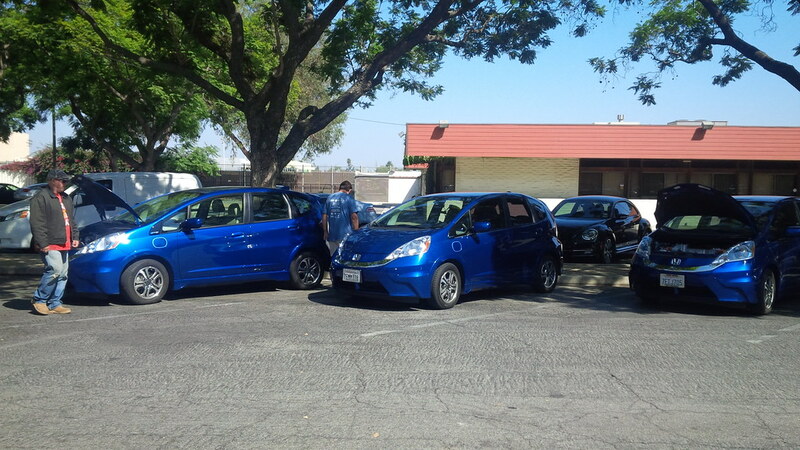 Interesting to spot a lot more LEAF and Volt than S and X this close to the Fremont Factory. Still didn’t spot any Model 3 on this drive. And adding all the legs of this one day, gives us the totals for this Thursday. Or 1347 total points without the handicap or 673.5 points after the 50% handicap, for today’s drive. 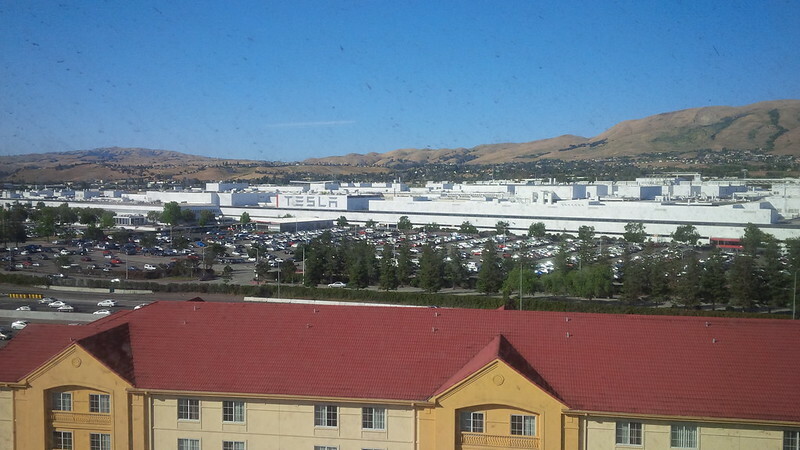 I’m not even sure if that counts the points for the Teslas that we can spot from outside our window from our room today. 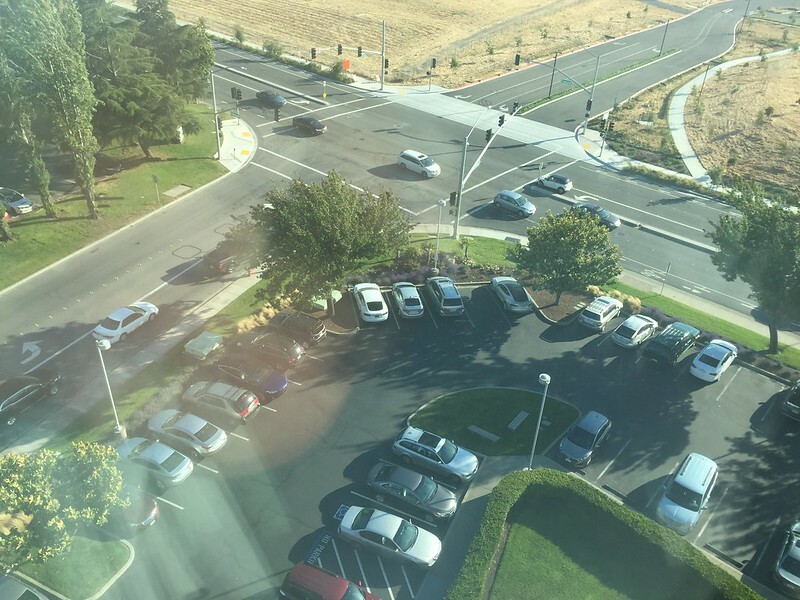 I know it didn’t include the ones across the freeway at Tesla’s Factory from the Marriott’s Executive Lounge. 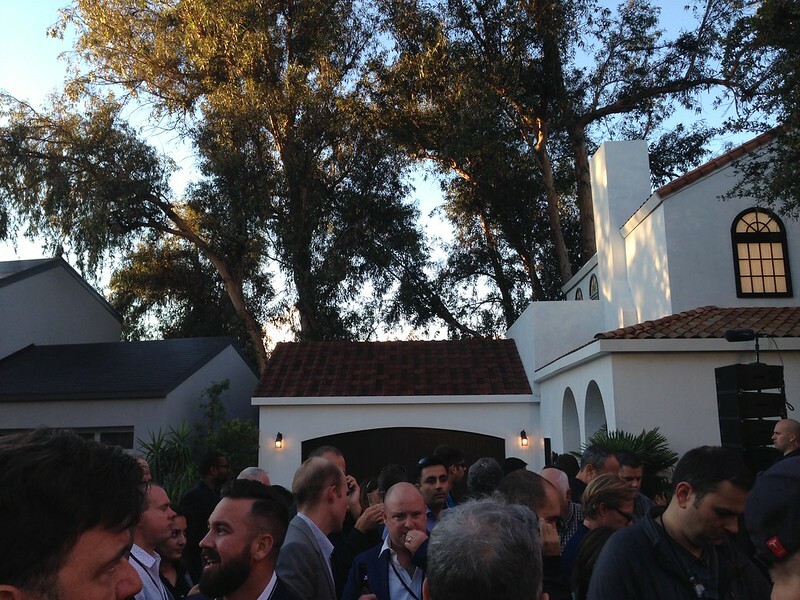 Either way, we headed to our evening reception with fellow Tesla Owners Club leaders. 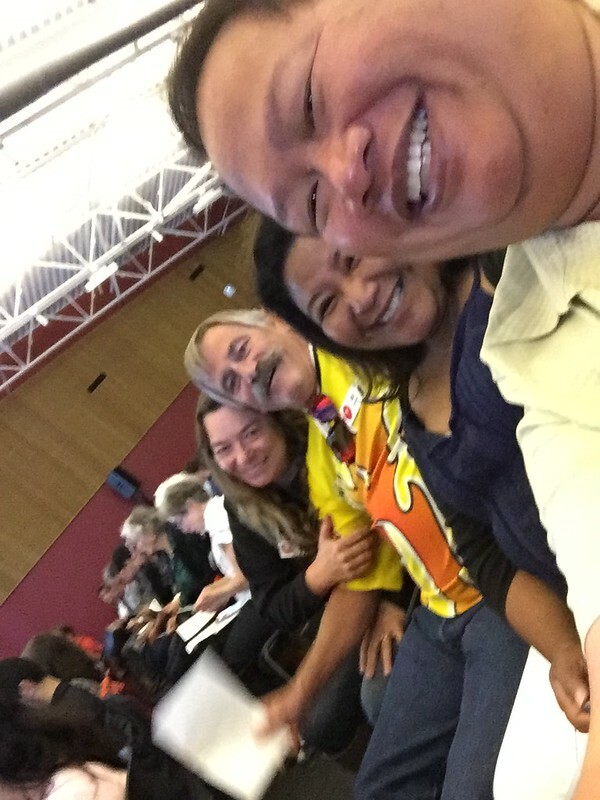 Aside from folks from all over North America, we had friends fly all the way in from Europe and Australia to join us in this first formal event. 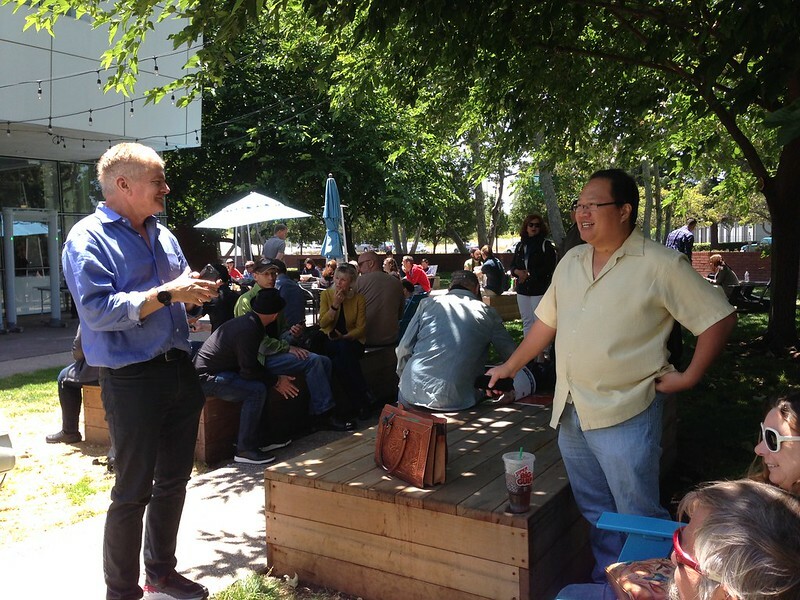 Those that followed us on last year’s Long Way Round trip to the Gigafactory would remember the lunch that we had with fellow clubs before the event. 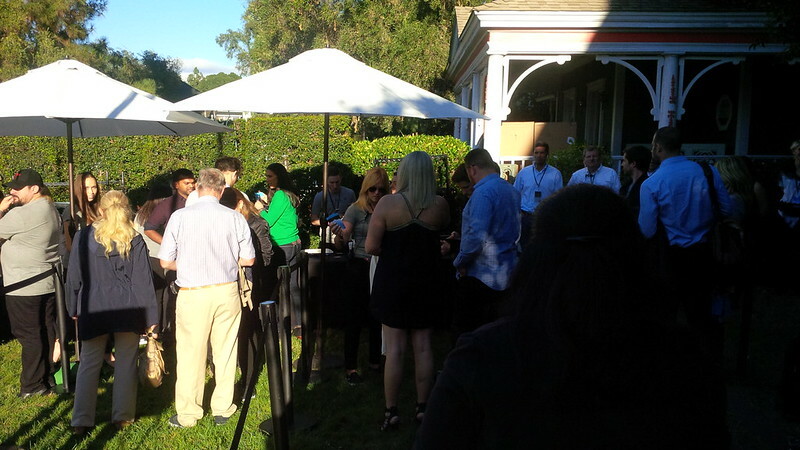 The evening reception was casual and provided the attendees with the time to “get to know” each other again. Zeb (pictured on the right) had done this trip on the furthest drive for the group, having driven cross-country from North Carolina and documented it on Google Plus. Our Belgian friends, who would later capture some great Model 3 shots on this trip at the reception were all wearing their club polos. And here I am speaking with some of the Europeans again. 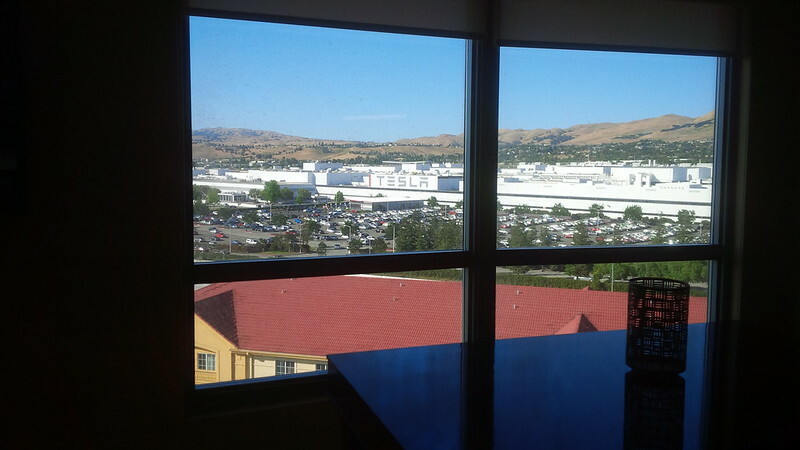 Before turning in for the night, went back up to the Executive Lounge to get a nice shot of the Tesla Factory across the street. 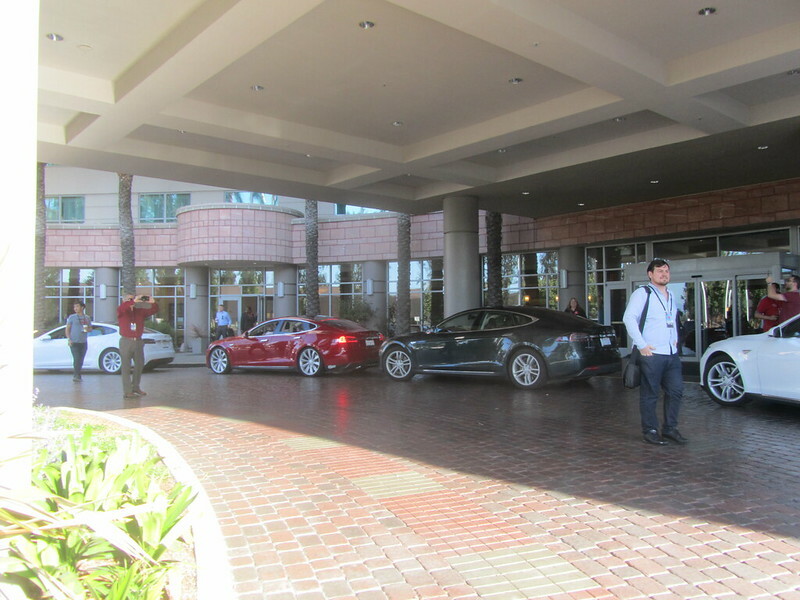 Day 2 of the Conference starts off with a bunch of us that drove to the conference providing Zero emission transport from the hotel to the Tesla Factory. 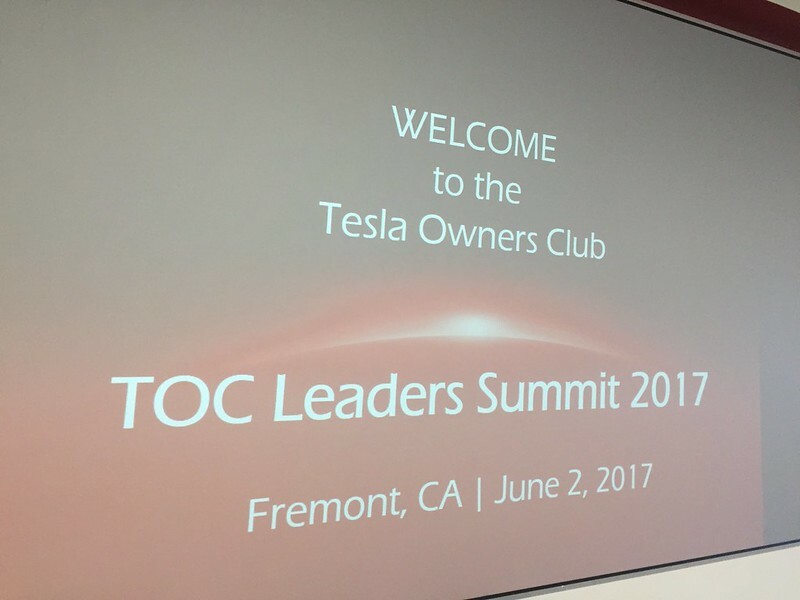 Tesla provided the clubs with a room and the time with quite a few employees and executives to spend the day with us as we brainstormed how to make the Tesla Owners Club Program a bigger success. 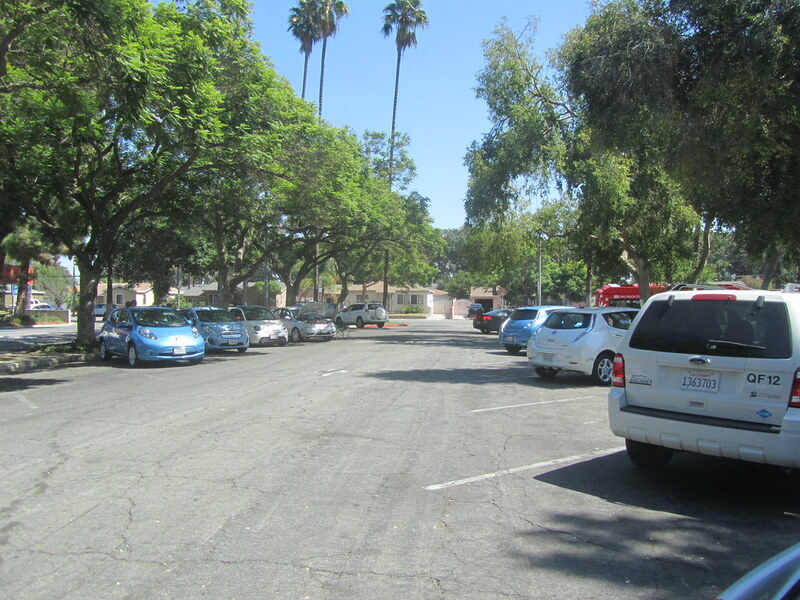 Here are four shots of the driveway before those cars took off. 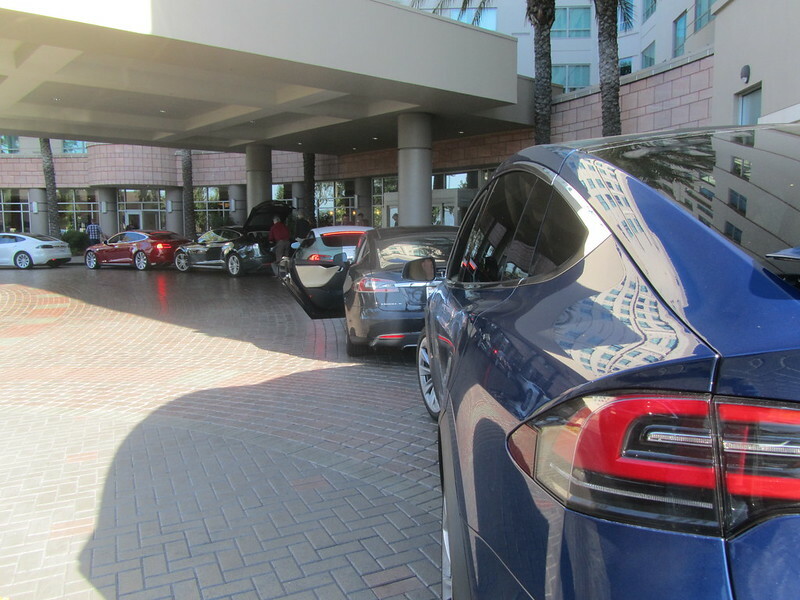 A hotel driveway full of Teslas mean that either I’m in Heaven, in California, Norway, or Amsterdam’s Schipol Airport… One of those four things is accurate. 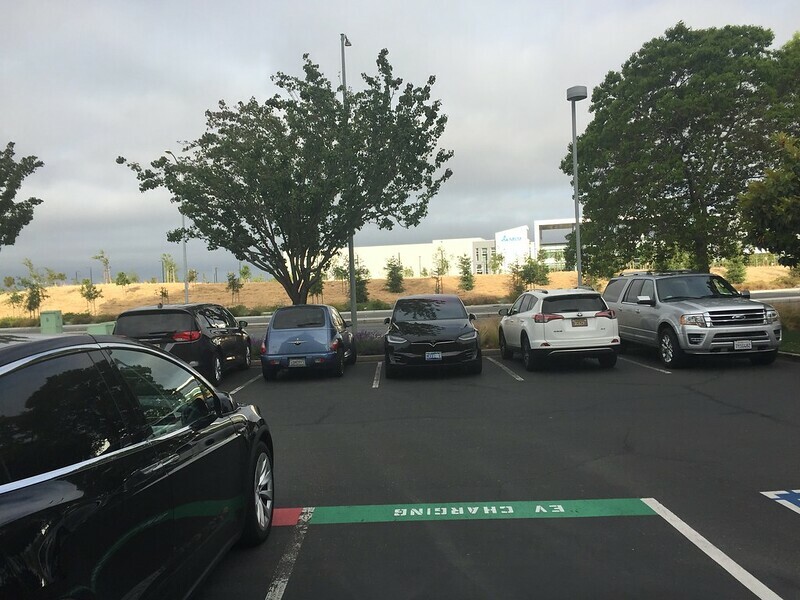 Our event with Tesla was occurring during the same time as the Model 3 VIP Event/Factory Tour for folks from the Referral program, so I’m not sure whether they had us park for our event or the other one, but we parked by the supercharger/delivery center at the Fremont Factory. 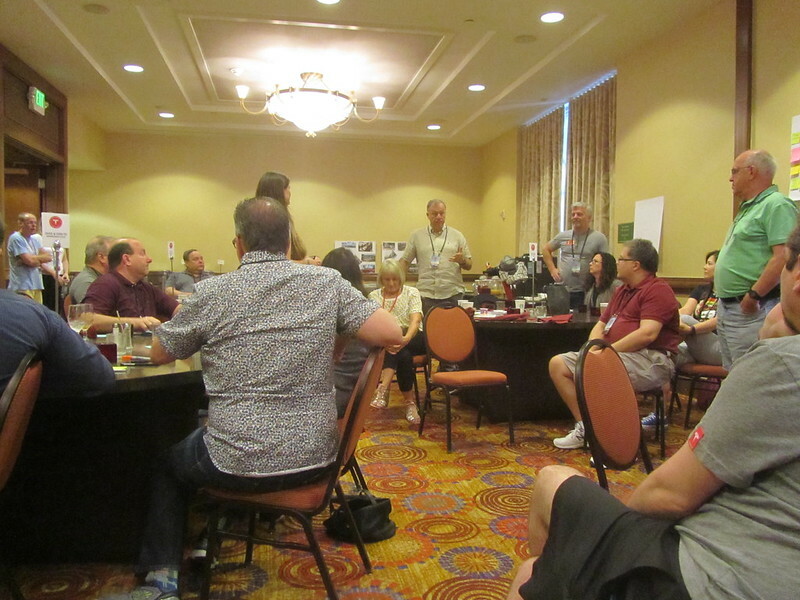 We headed through security into the training room set aside for the TOC Leadership were meeting. 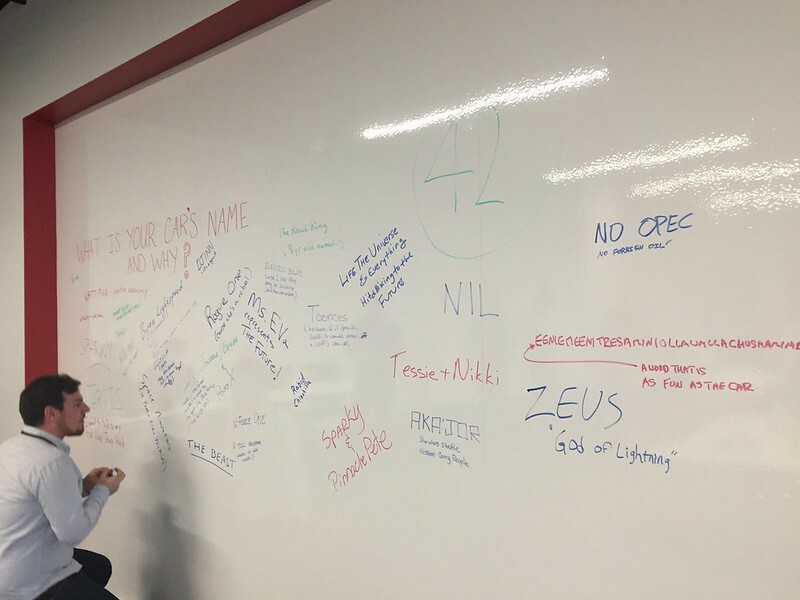 We were asked some ice breaker questions. and waited for the start. It was a long, productive day and we got a break in the middle to do an updated factory tour. 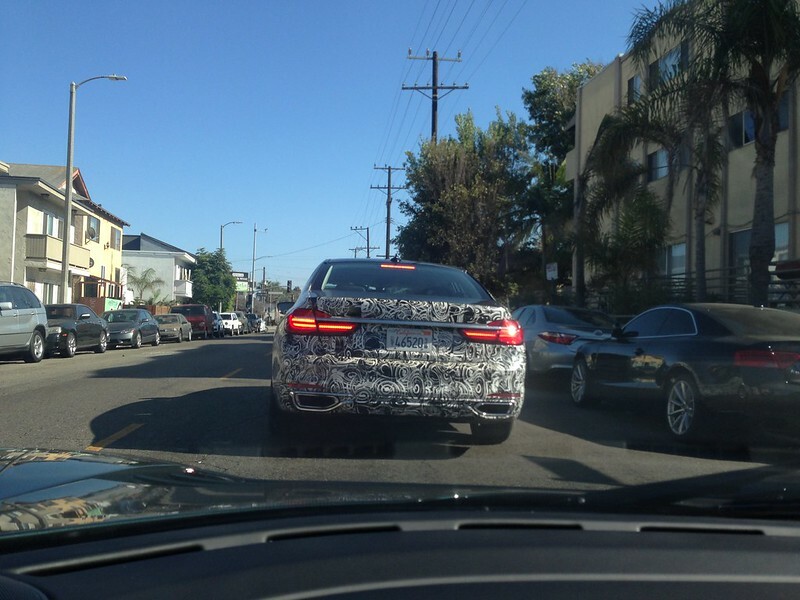 …We saw the production line and the factory itself seems to be “more full” than I’ve ever seen it before. This was the third time that I’ve visited the factory and it seems like they’re now fully utilizing the building. But we had NDAs and couldn’t take any pictures whatsoever. It wasn’t all serious work. 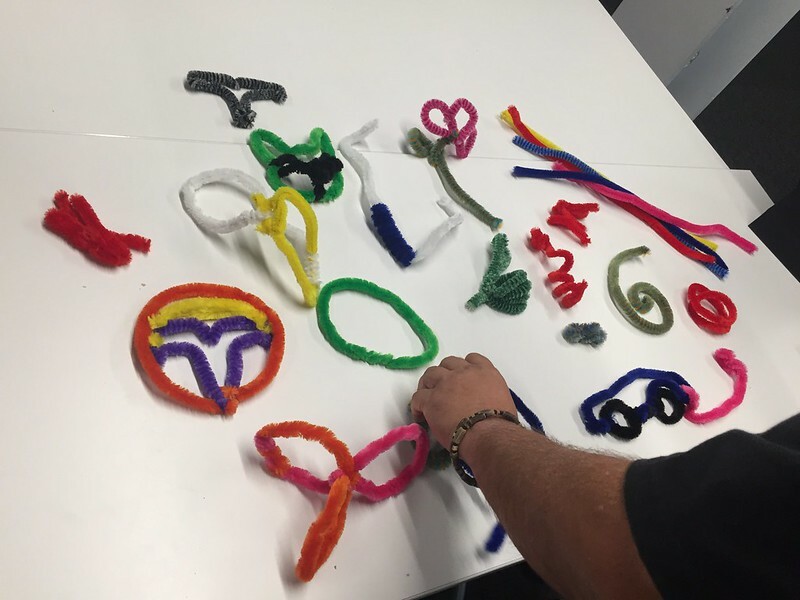 In between sessions, the tables were provided some pipe cleaners and folks got creative with what was provided for them. Here was a rendering of a Model 3 supercharging. Either a Rocket Ship to Mars or La Tour Eiffel from Stephen Pace as well as some chocolate covered macadamia nuts from the Hawaii Club. 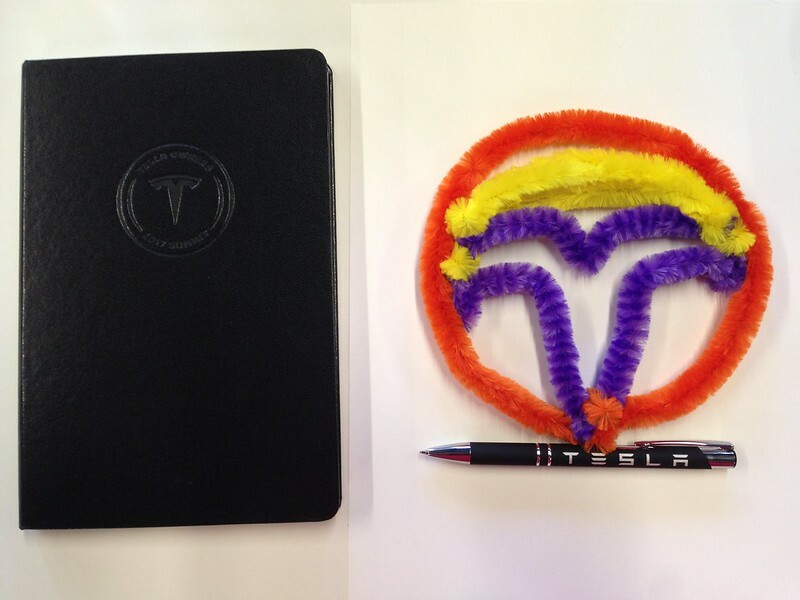 Doing a Tesla logo and the notebook that we used at the conference. 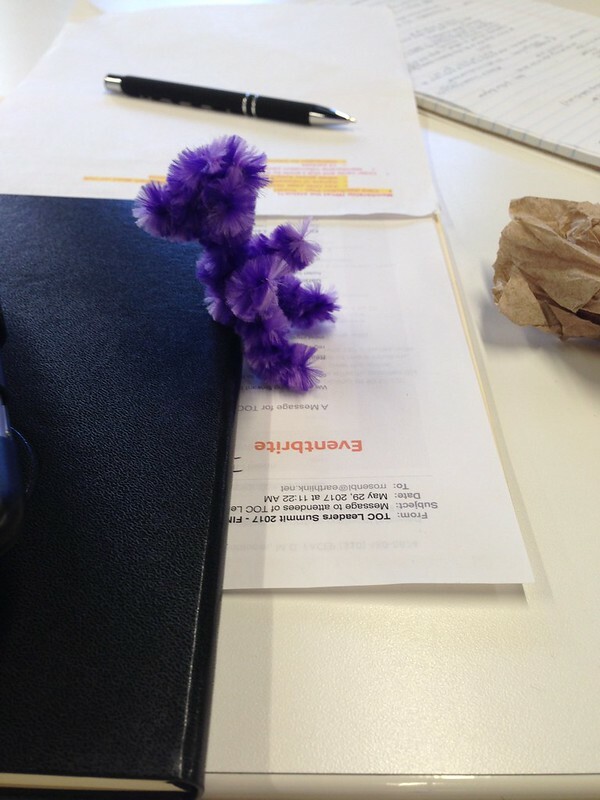 Here are the selection of pipe cleaner fun that the folks put together. 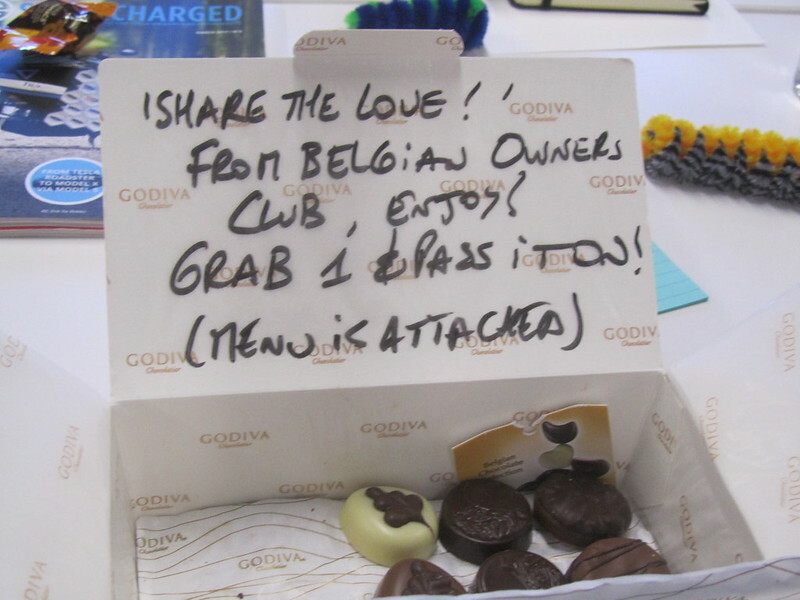 Aside from the goodies that Tesla fed us with, our friends from Hawaii brought some chocolate macadamia nuts that were in bite size packages on our tables, the Belgians brought Godiva. 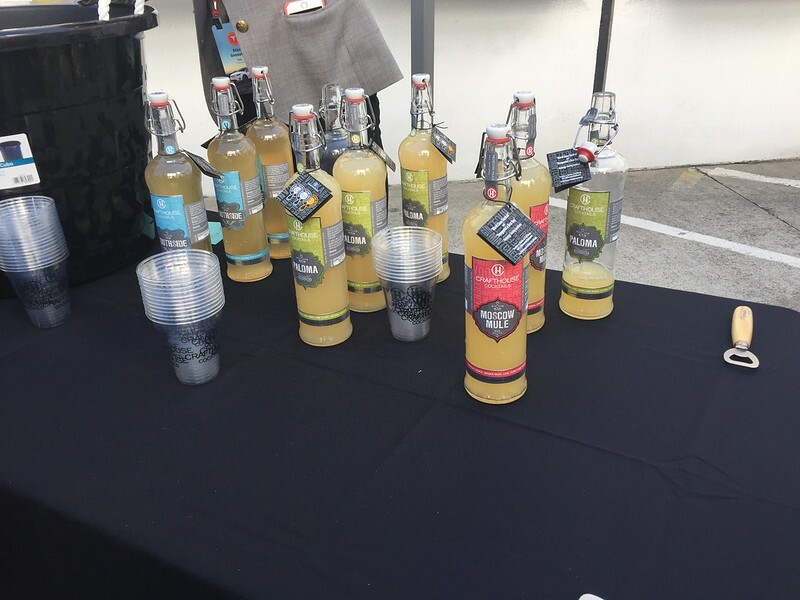 After a long day of brainstorming and working with our Tesla hosts, we had some dinner and drinks at the Factory. 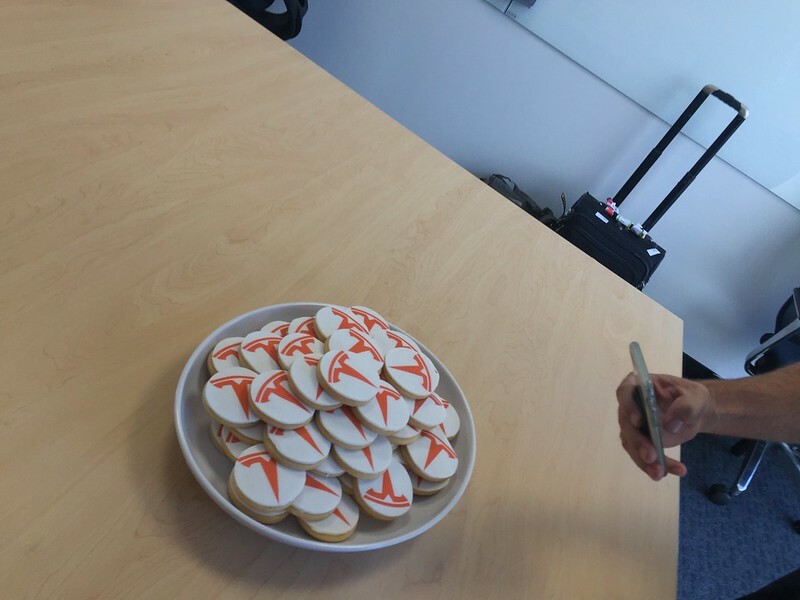 and some special Tesla cookies for dessert. 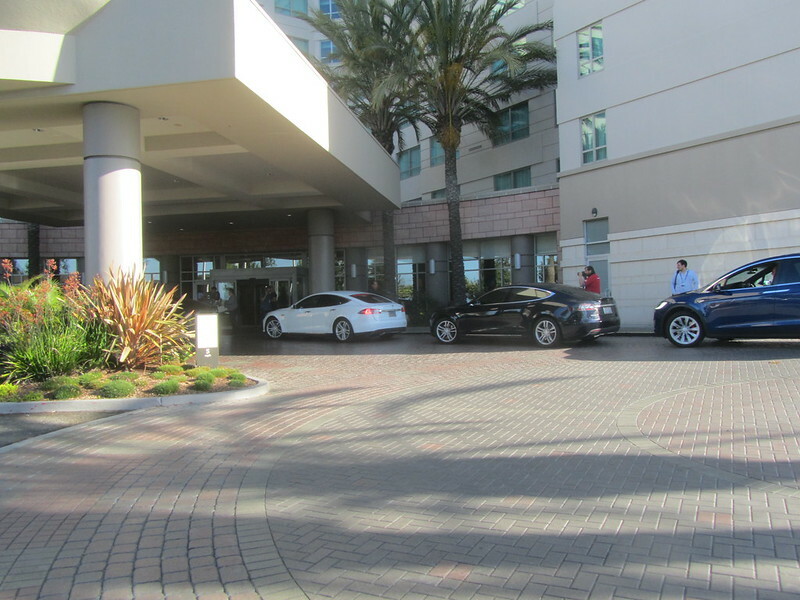 We had some further interesting happenings that I won’t be sharing with you here… But, let’s just say that I got a good idea of the differences in size between the Model 3 and Model S.
And then we were back at the Marriott. 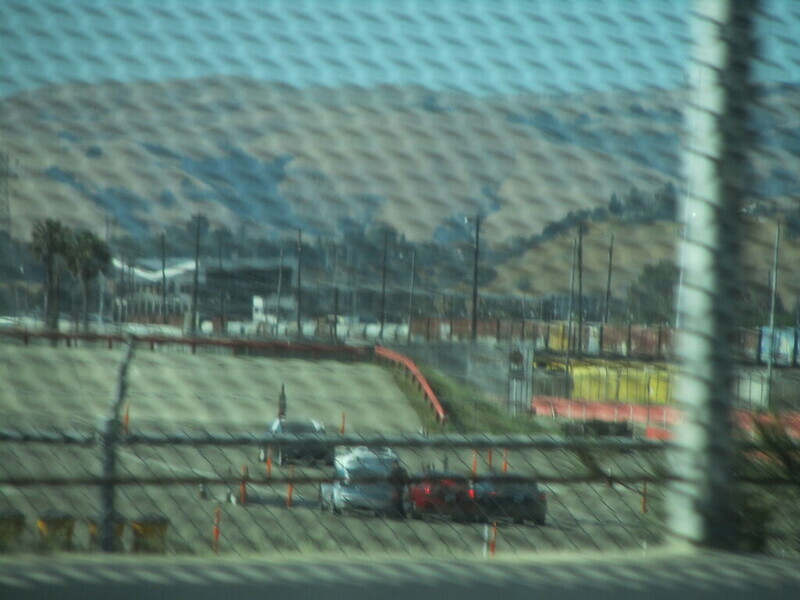 When we got back to the hotel, we found out that Robert R and our friends from Belgium were busy taking pictures of the Model 3, both in the wild and on the Test Track near the Factory. 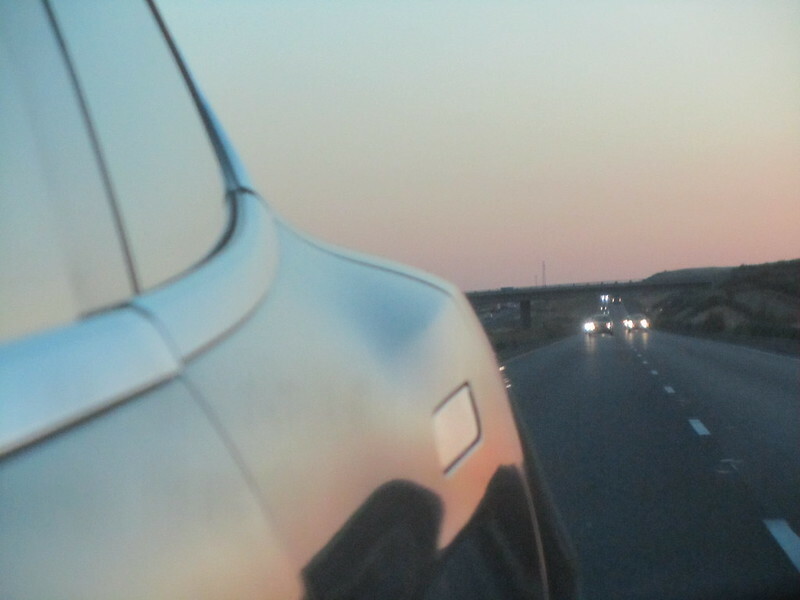 This was what they first spotted that first evening of #Model3 spotting. 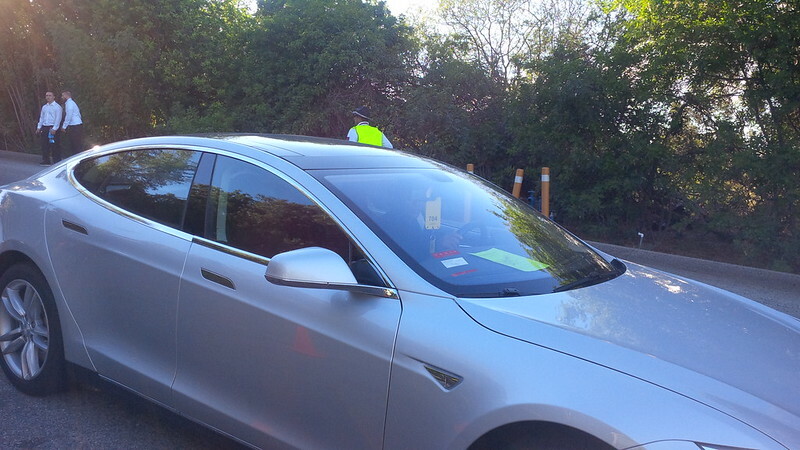 They were also by the Tesla track beside the factory and had a few shots on their Twitter page as well. 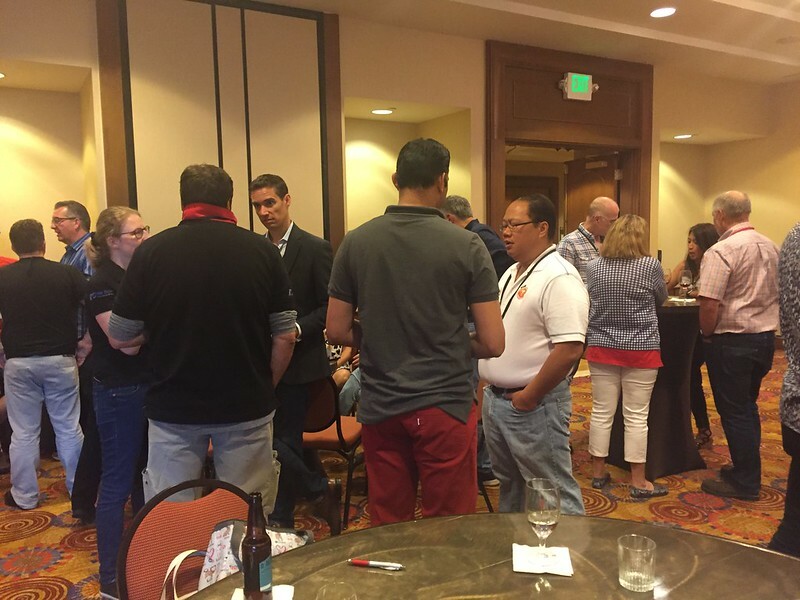 Had a good time with some late night discussions at the hotel lobby with fellow club leaders, but decided to turn in. The next morning, we had a half day session left for the conference. 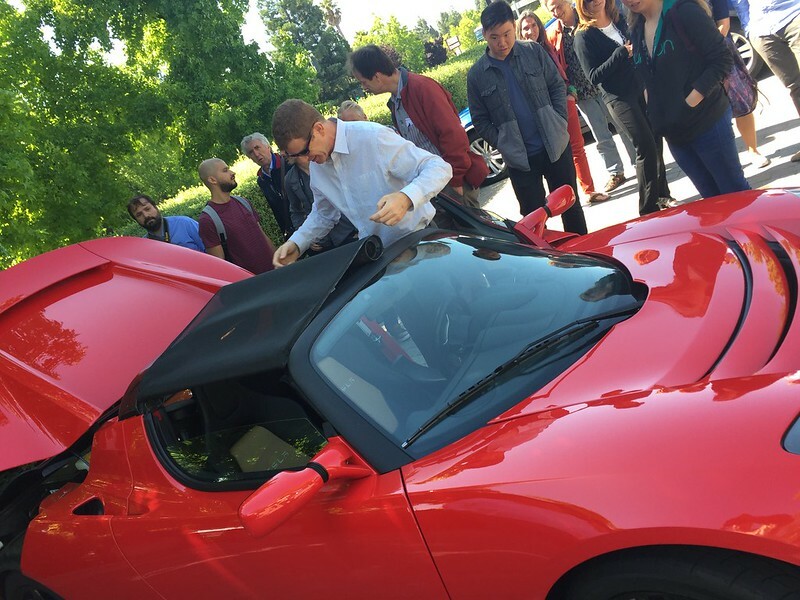 But before the start of the conference, I thought to see if I can clean the windshield on the car. 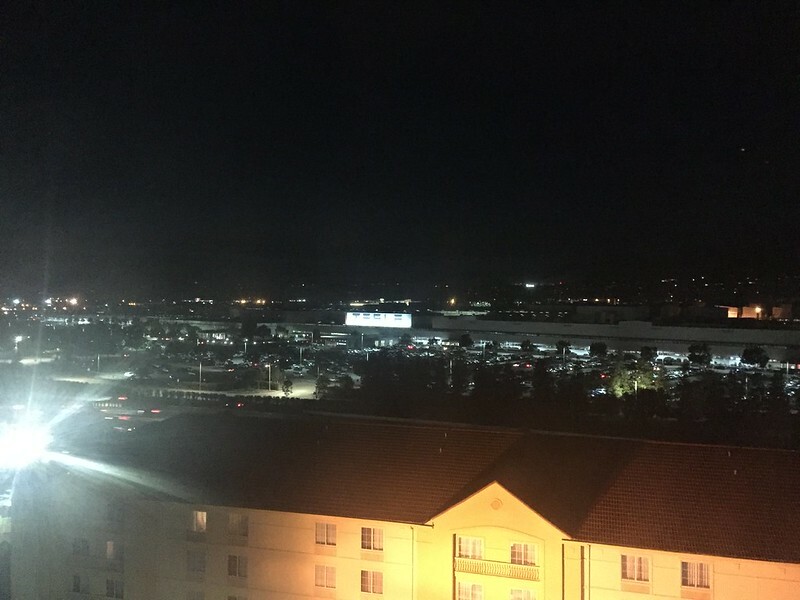 Want to spot Teslas from the hotel window? 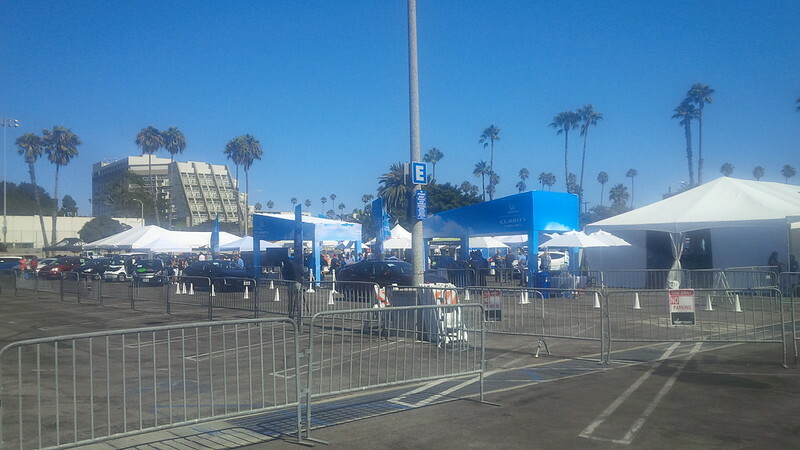 Our S is parked beside the traffic cones on the bottom right corner of the picture. 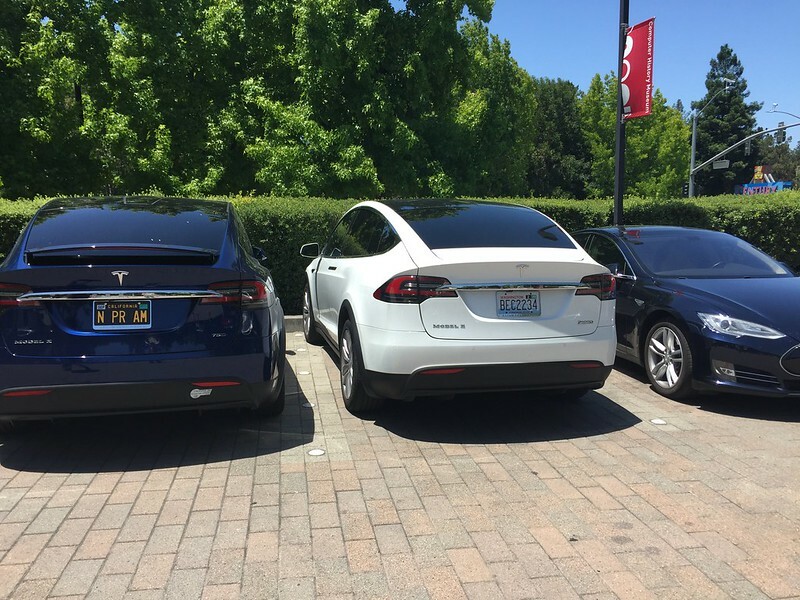 Here are some of the Teslas that I could spot from above. 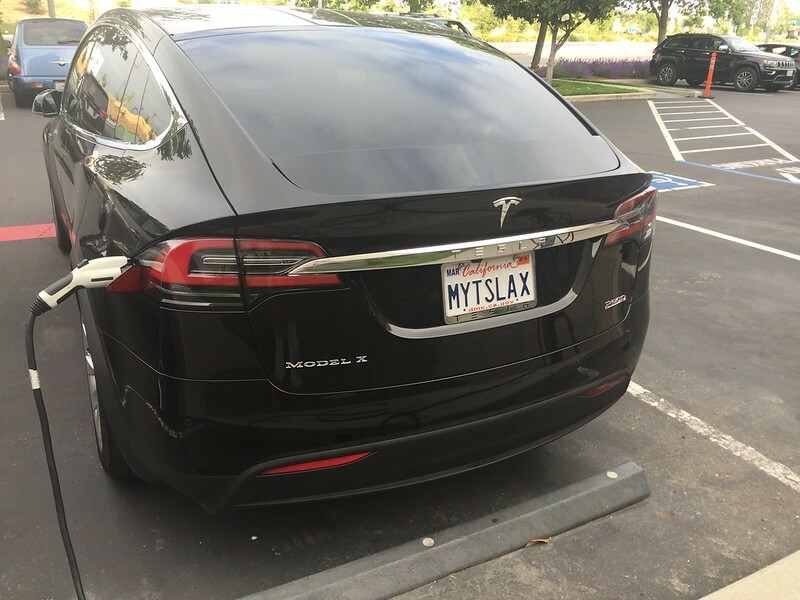 Lot of other folks did this drive in their Model X. Zeb from North Carolina had already headed back at this time. 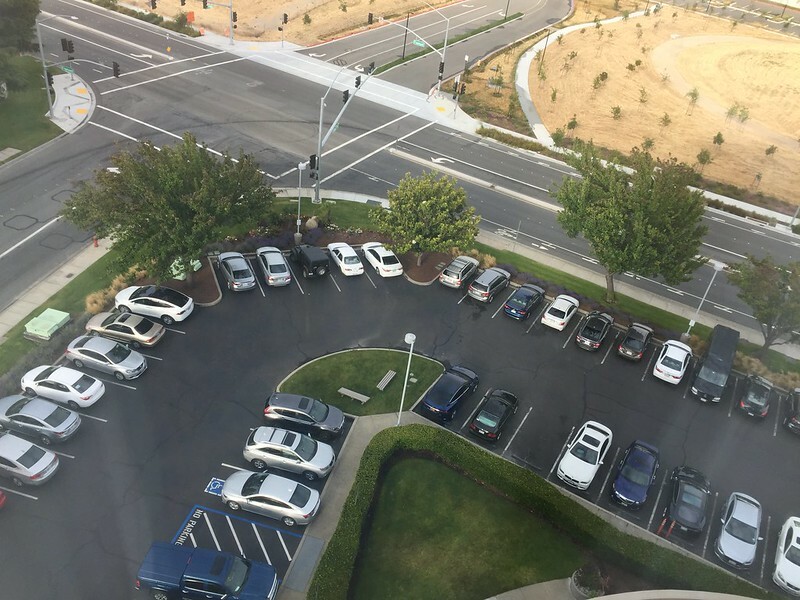 I was trying to find his car to show the guy with the farthest drive from this group. 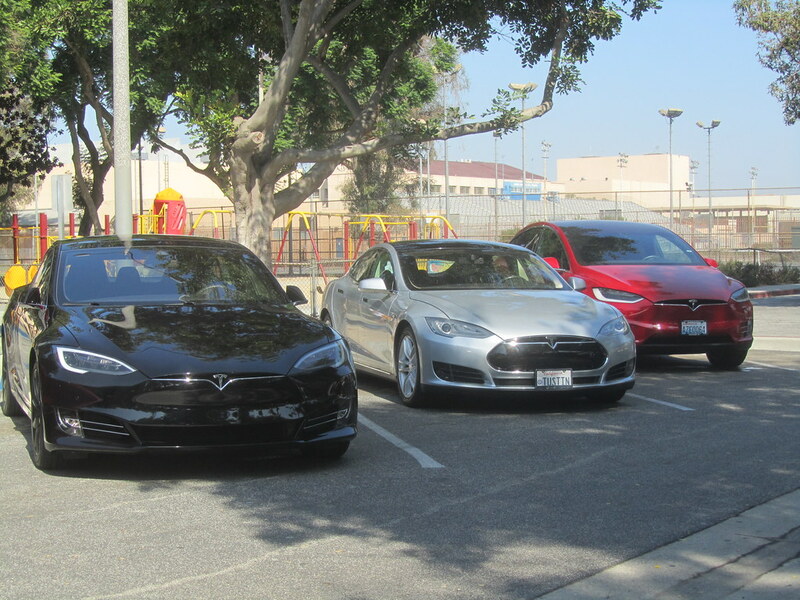 But eventually, we all met back for our clubs debrief and we had a productive session amongst the Tesla Clubs. 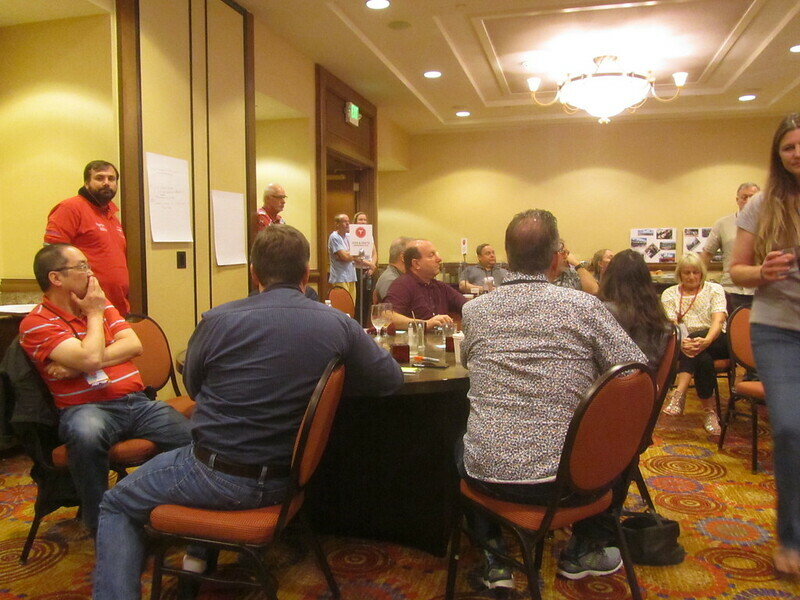 It was good to get a grasp of what other clubs are up to, what sort of response they get and strategies on how to work within the community and with Tesla. We strengthened our bonds and said goodbye to old friends and new. 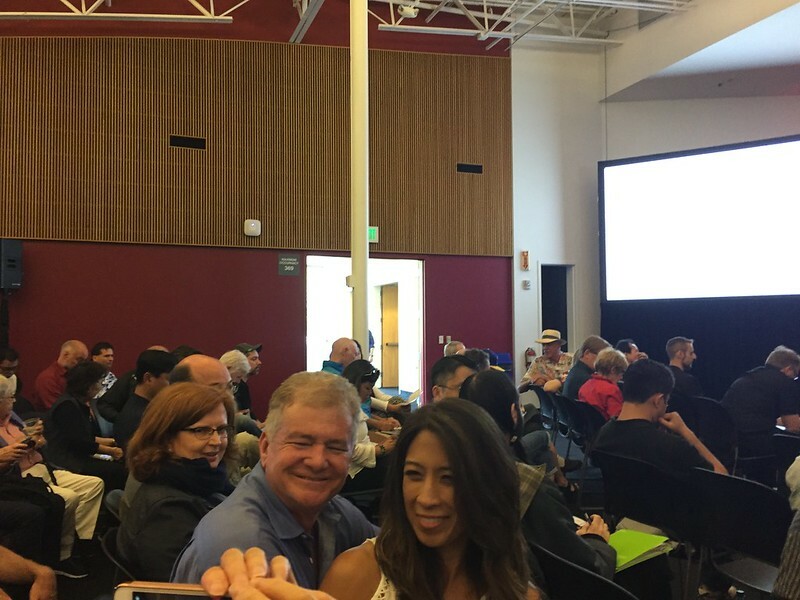 With the full expectation to spot some of these folks on Tuesday for the Tesla Annual Meeting, which is Phase 3 of our trip. Besides, we were provided with the last gift from the event planning committee. 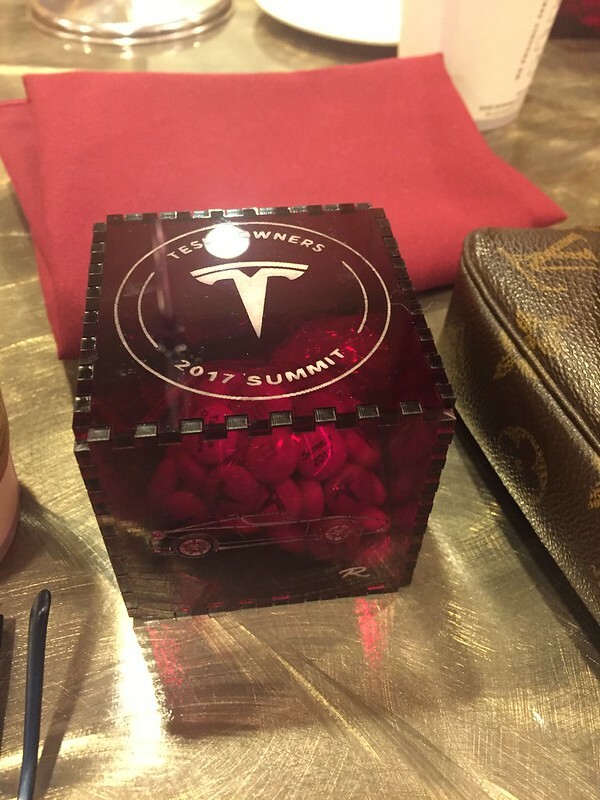 The chocolate was enclosed in this puzzle box adorned with all four Tesla vehicles produced or about to be produced, so that was cool. 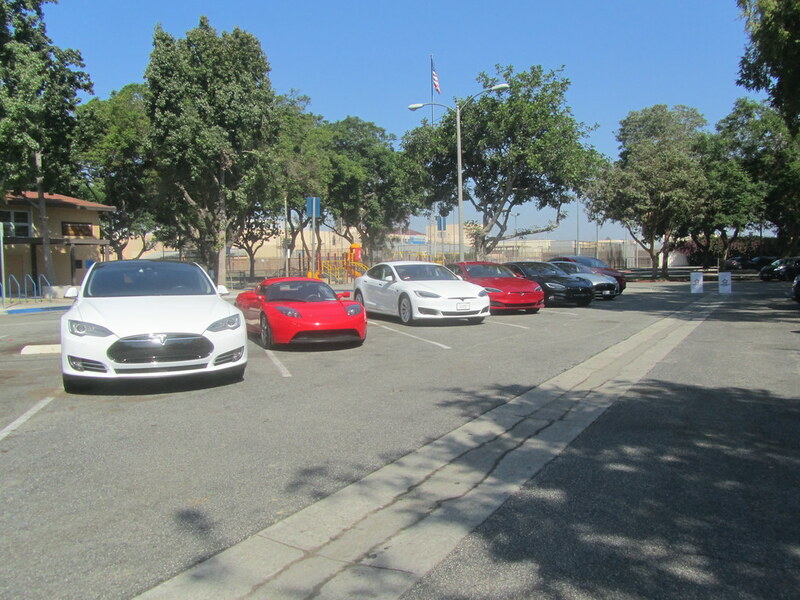 The rest of Saturday, the 3rd was hanging out with Trevor Page of Model3OwnersClub. 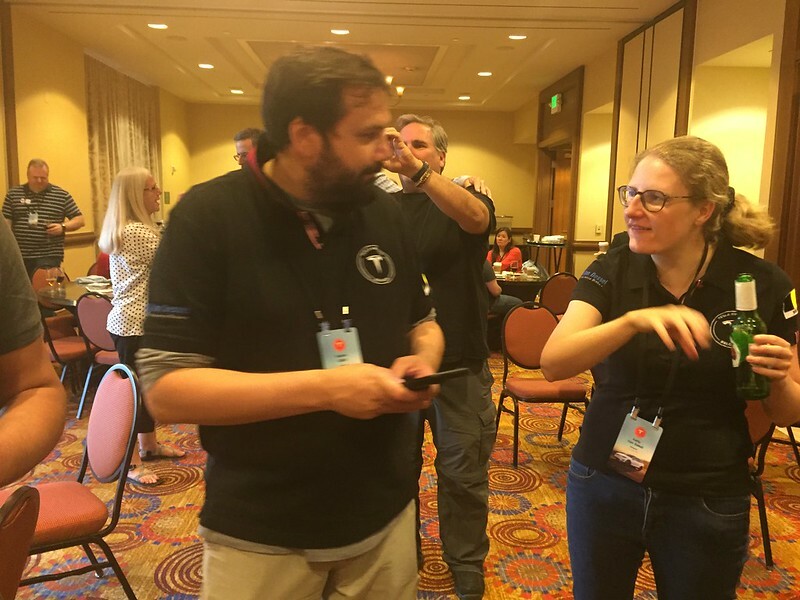 We were in contact with each other because he was flying in for the Referral Program VIP Tour and Q&A Session that was held during the same weekend as the TOC event. We were trying to find a time to hang and I volunteered to take him to the airport, so we hung out for a while before his flight. 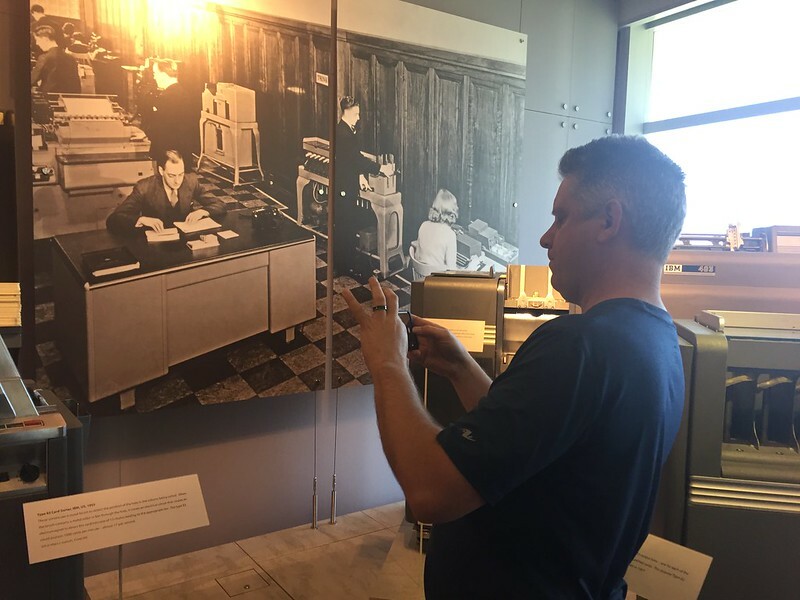 He hasn’t visited the area before and I didn’t know what traffic in the area was like, so figured to take him to the Computer History Museum in Mountain View. 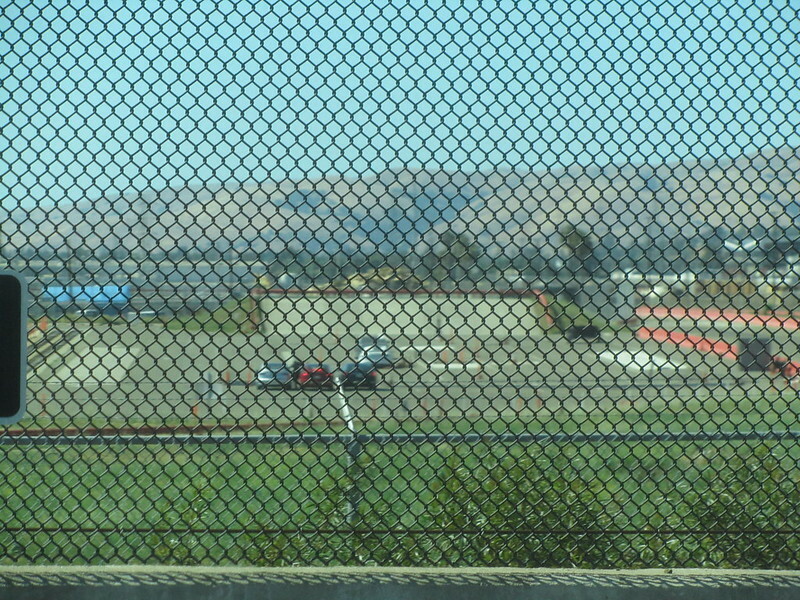 The museum is a short drive, even in traffic, from San Jose Airport. 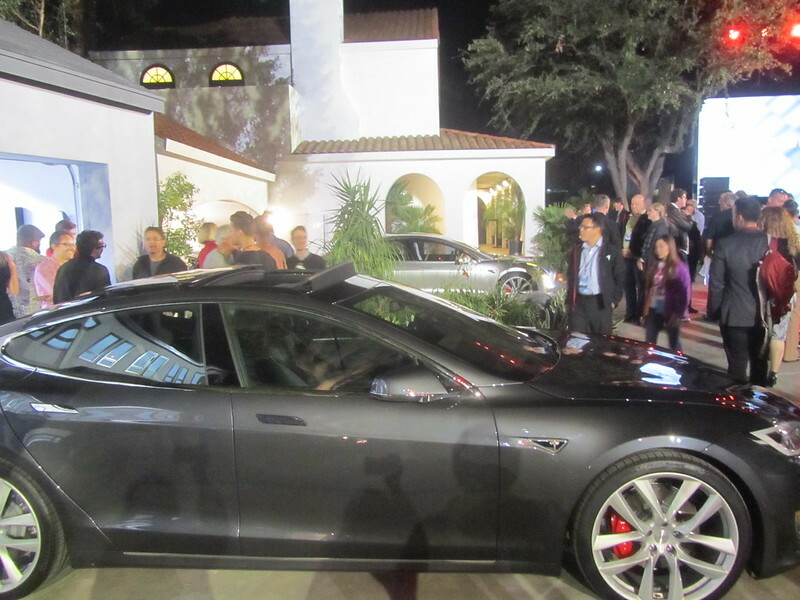 Additionally, the museum is the same location as the Tesla Annual Meeting and figured that he would enjoy that. 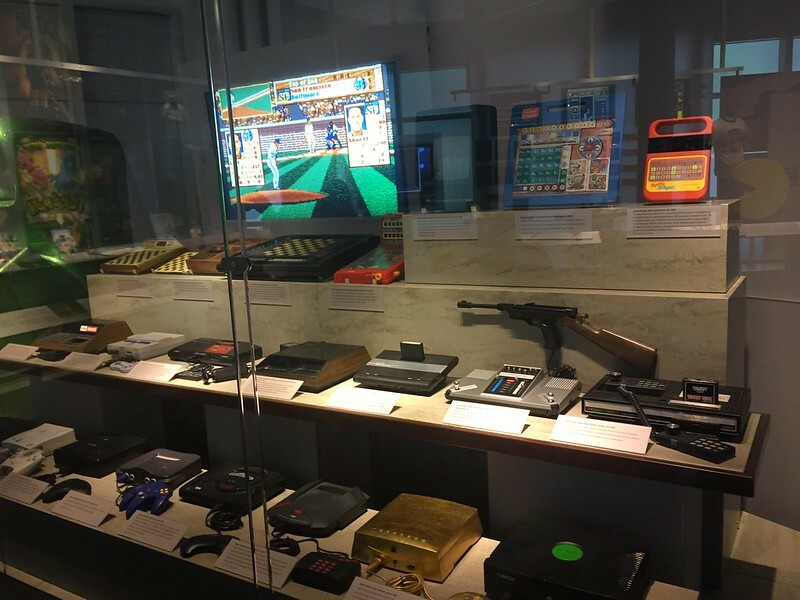 We’ve been in the building last year for the Annual Meeting, but never really visited the museum. Needless to say, it was a blast. 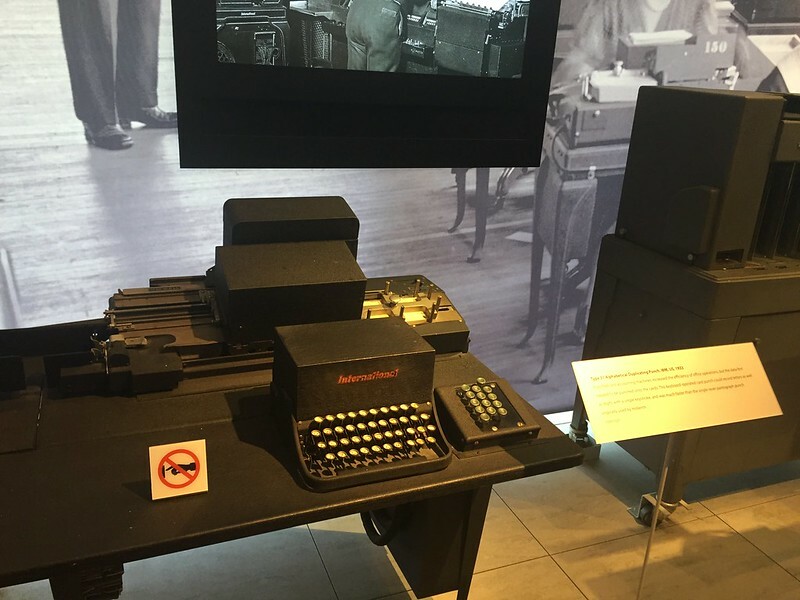 We saw some really old computers. Here’s Trev taking a photo. 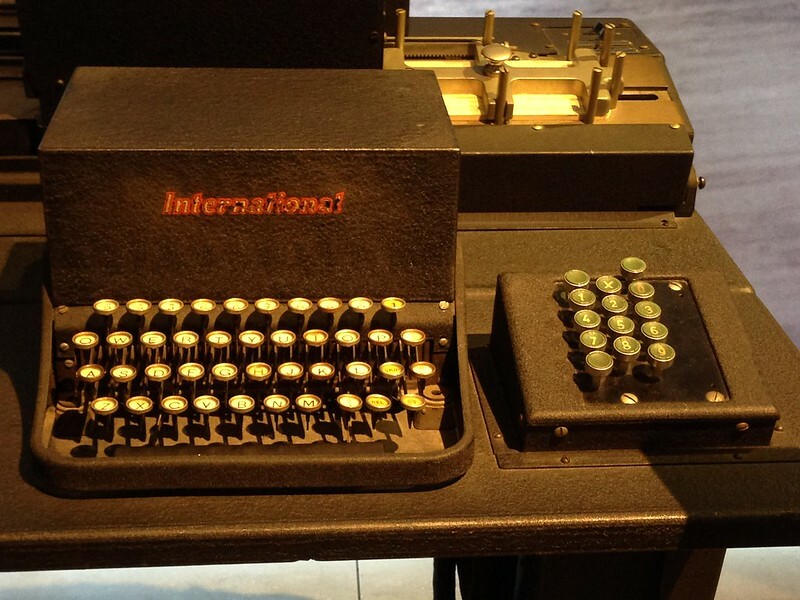 And a lot of very important historical computers. 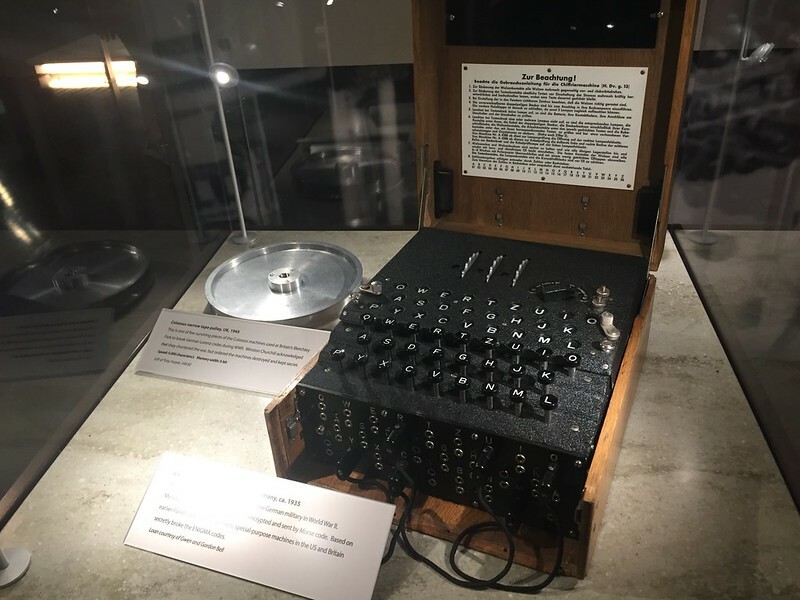 Like this Enigma Machine. 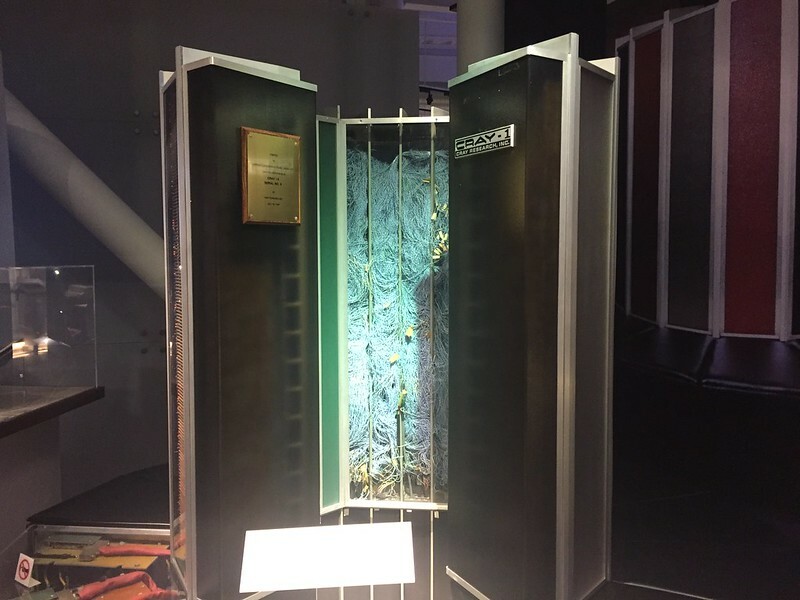 Or this really old memory tube that was 2560 bits of RAM. Trev in front of some old military computer installation. 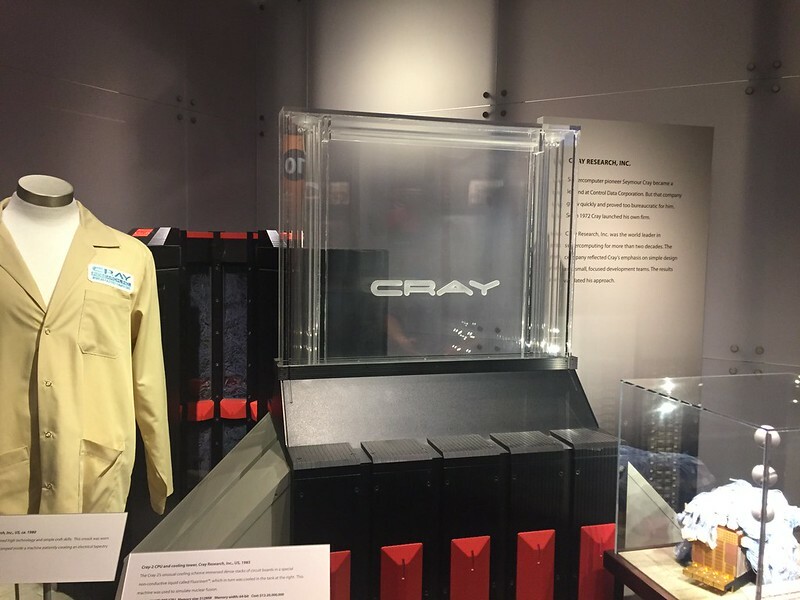 A couple of old Cray computers. 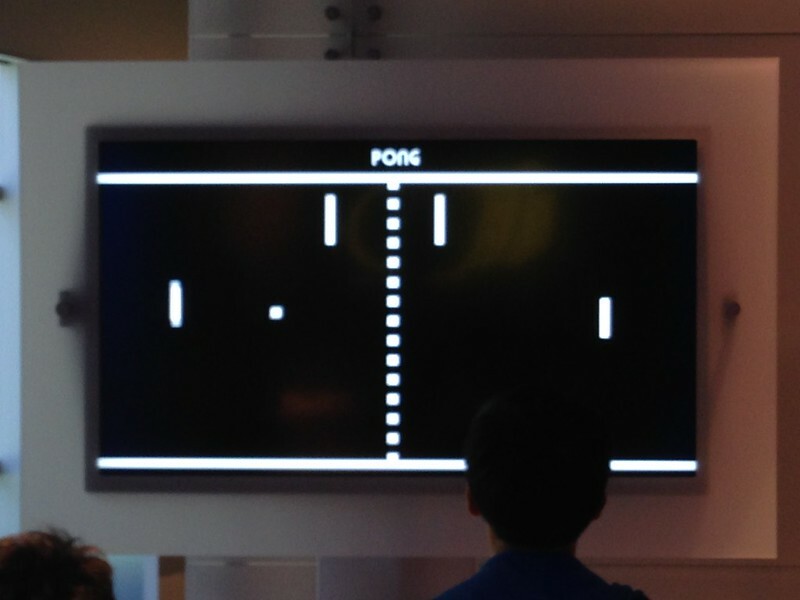 They even had some kids playing PONG. 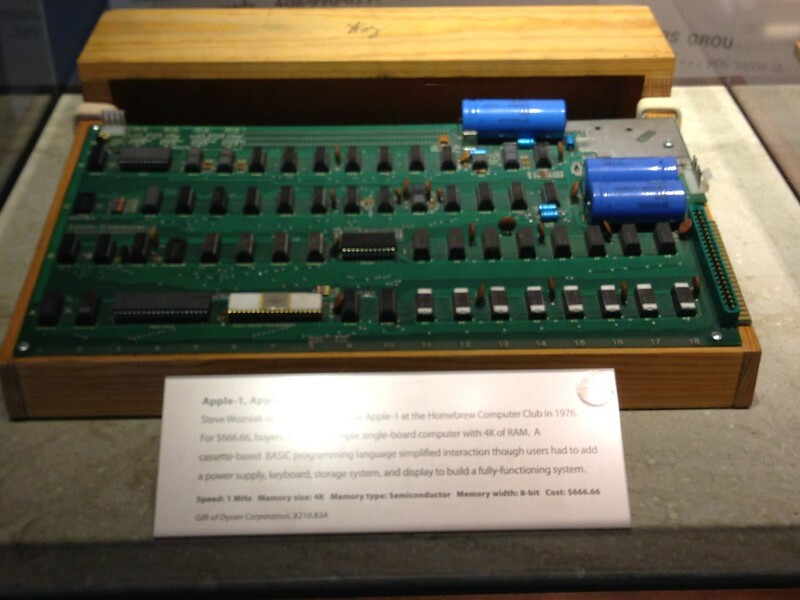 and finally an old Apple 1. 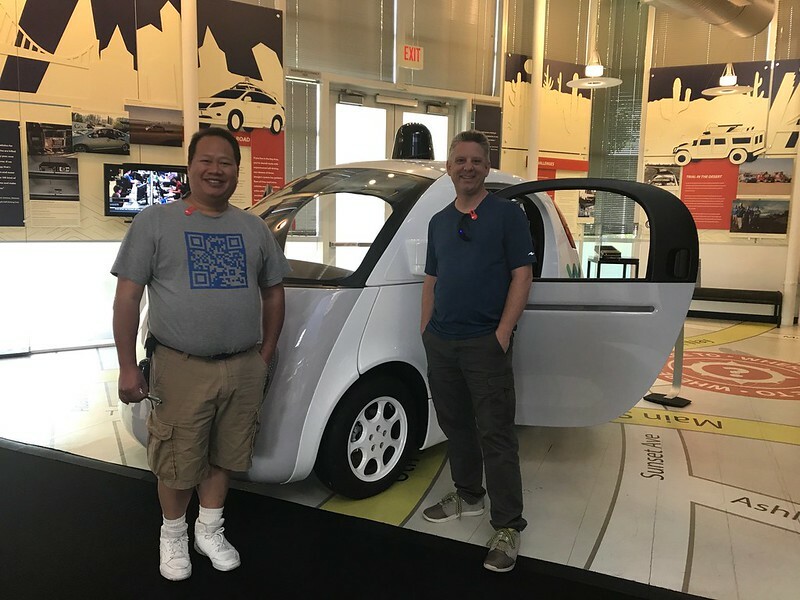 Before we took Trev to the airport for his flight, we take a picture in front of the Google/Waymo Pod Car. 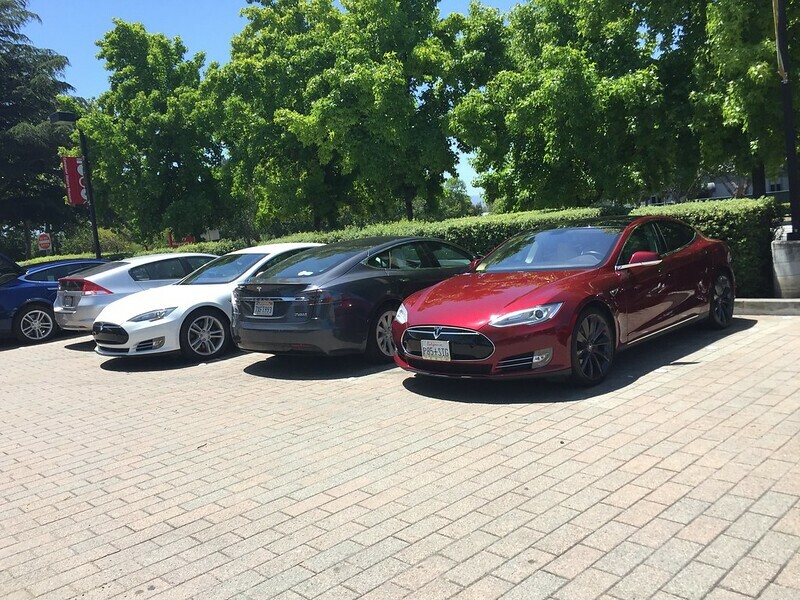 After dropping Trev off at the airport, we decided to charge up at the supercharger at the Tesla Factory. Though our hotel is a host to in the destination charger program, one of the L2 was broken, and it was easy enough to catch a charge there. 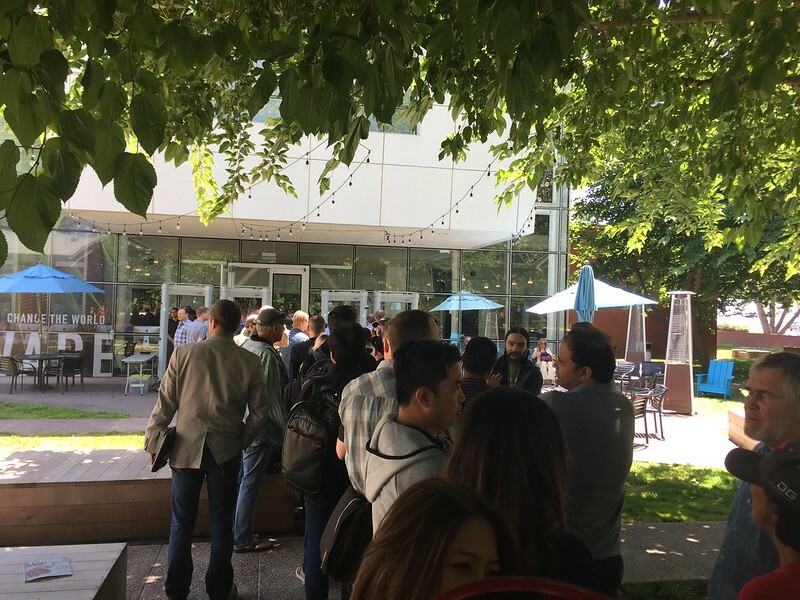 Besides, I had to get another drink of the Tesla Blend drip coffee that Tesla was serving us during our conference the other day. I was trying to do some lazy Model 3 spotting at the factory. And actually caught the Alpha being loaded back in the truck. Except, I was asked not to take any further pictures. It’s cool, but I’ve been way up-close to that car already. 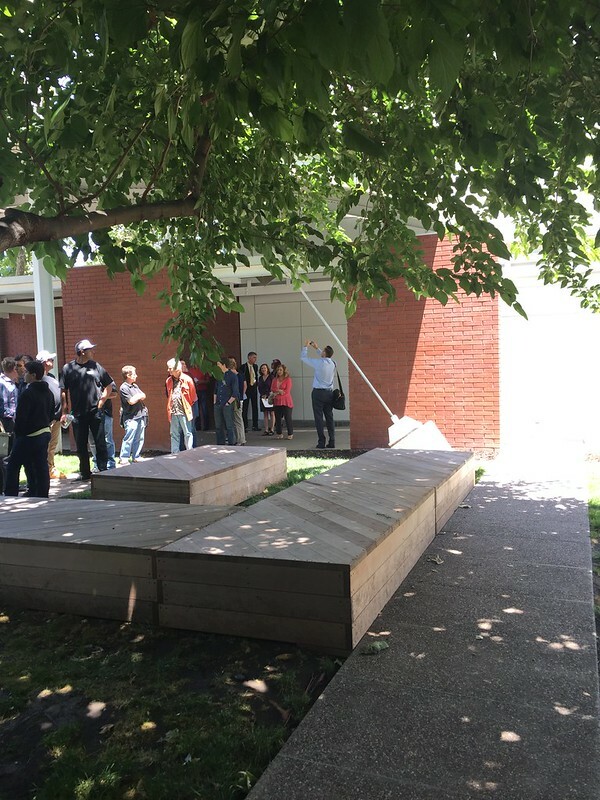 It’s the same one that was at the Tesla Solar Roof and PowerWall2 Announcement from a few months back, and I have a ton of better pictures of that. 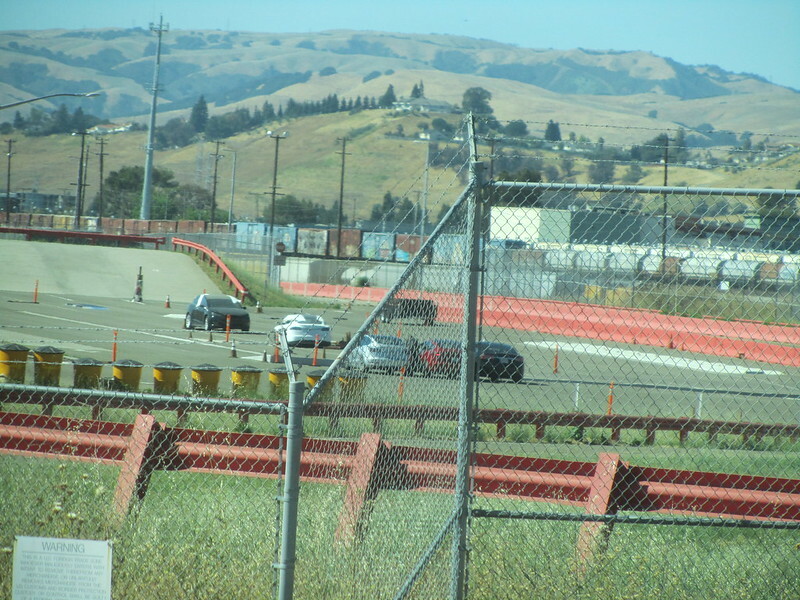 After being emboldened by our spotting of the Alpha car… I figured to take the long way back to the hotel, and drive close to the track that our Belgian friends spotted the Silver and Red cars being speed tested. 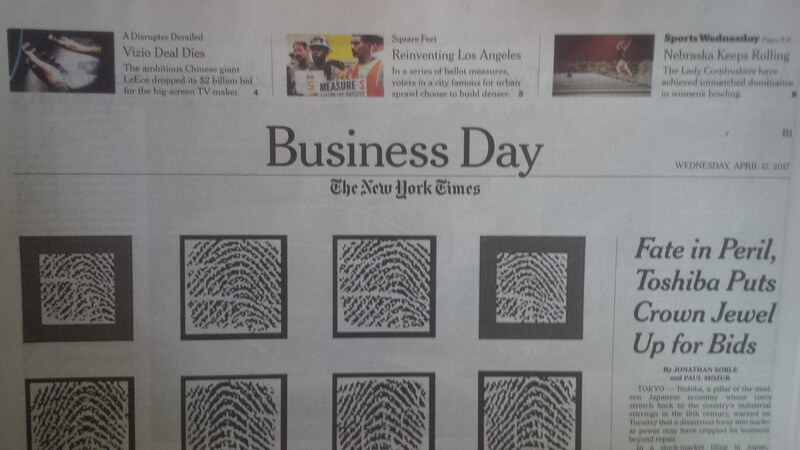 And sure enough, we spot two of them. 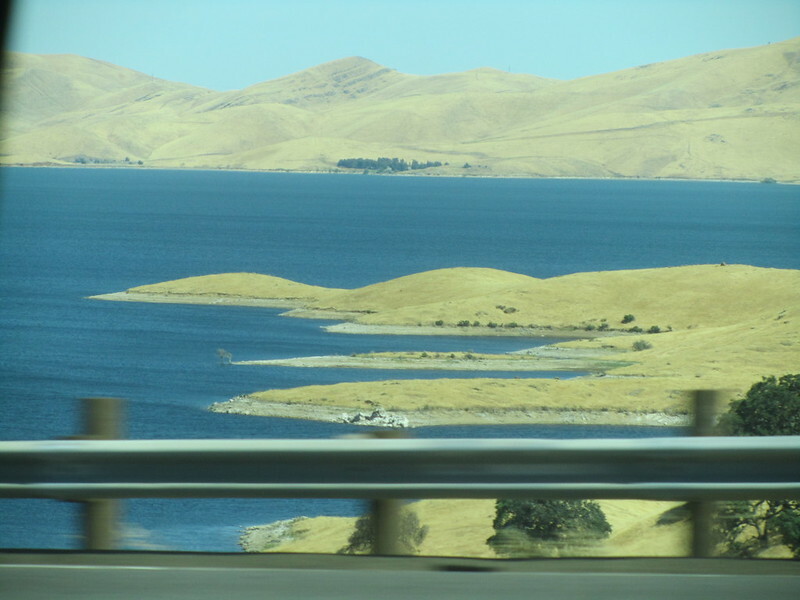 So, the first phase of our three phase trip was complete and we had a night to recover before our drive down to Morro Bay for the ActiveE West Coast North-South Reunion 4. (or WxNS4 as they’ve abbreviated it.) 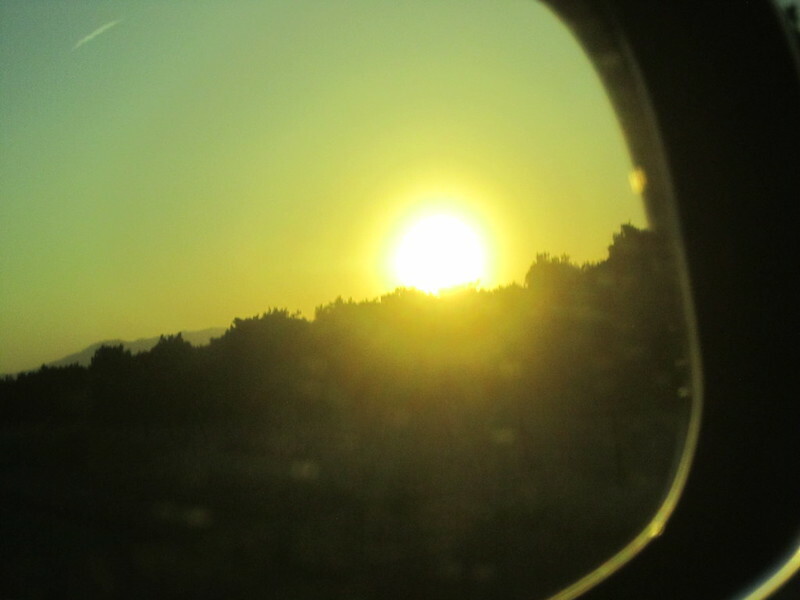 Click here for the next phase on this trip. 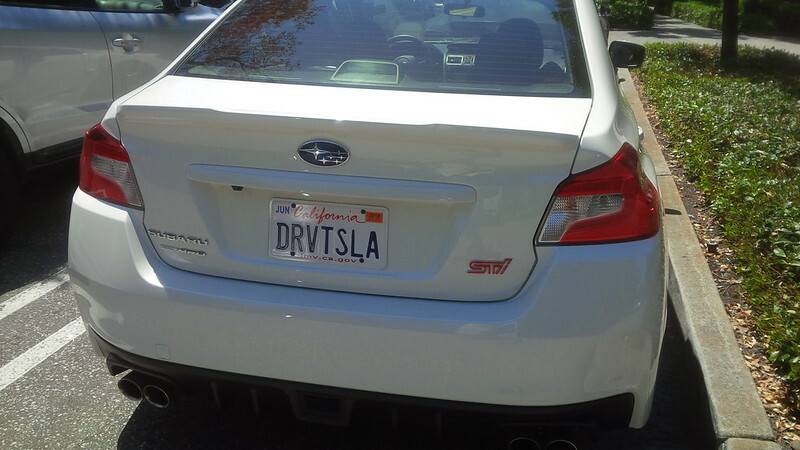 I’m sure that we’ve driven over six orbits of the Earth on EV power alone! 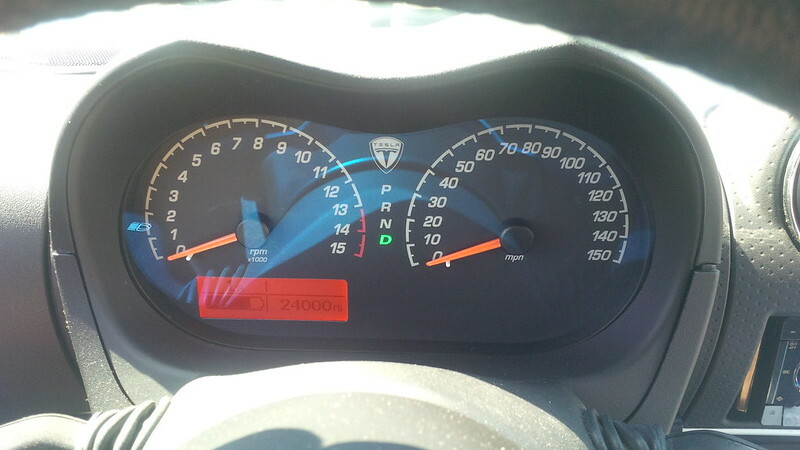 Last week, I noticed that my wife’s Roadster reached 24,000 total miles on the odometer on May 4. 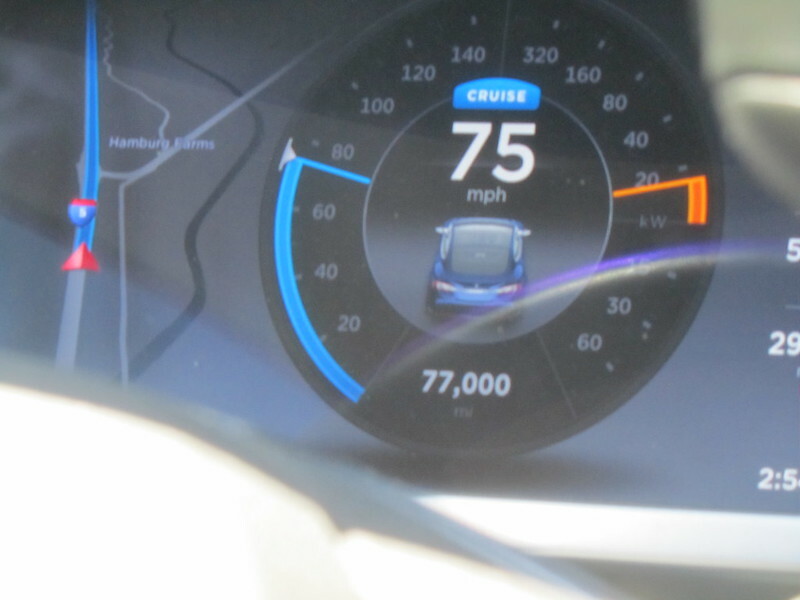 A few days later, on May 7, we reached 75,000 total miles on the Model S Odometer as well. 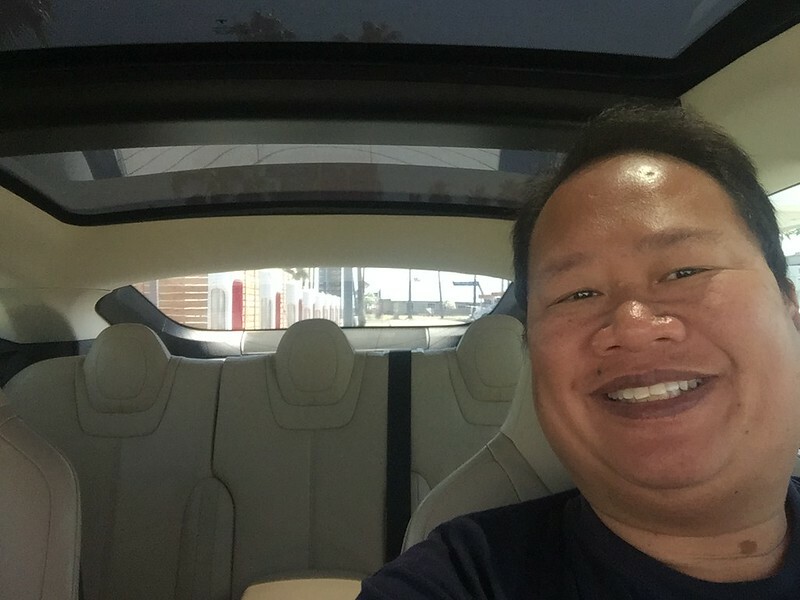 My wife is the second owner of her Roadster and it had 2,200 miles when we picked it up and the Model S had 22 miles on the odometer. 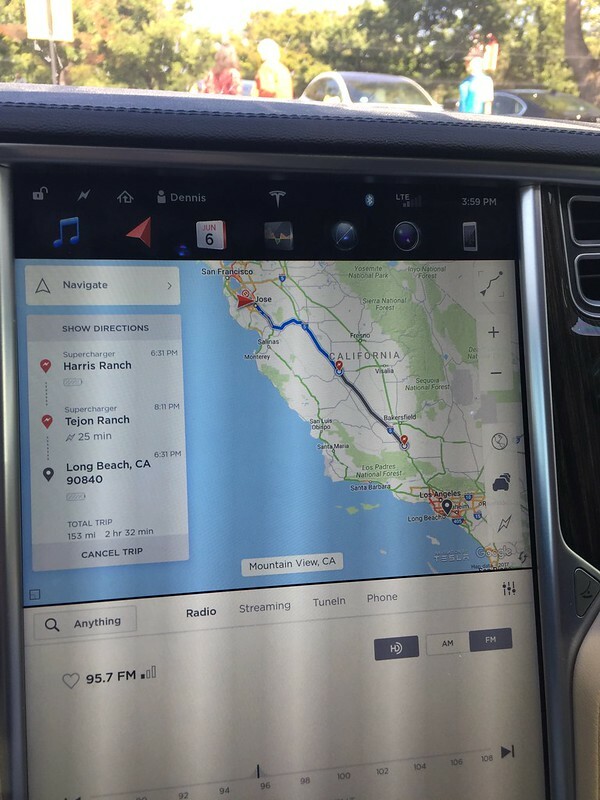 In the three years and eight months of Tesla ownership, it was a bit of a shock when I realized this morning that the total of these two mileages was 99,000 and that we were very close to having a 100,000 Tesla miles on our own vehicles. Considering that we turned in the Active E with 54,321 miles on the odometer in February 2014 after two years. 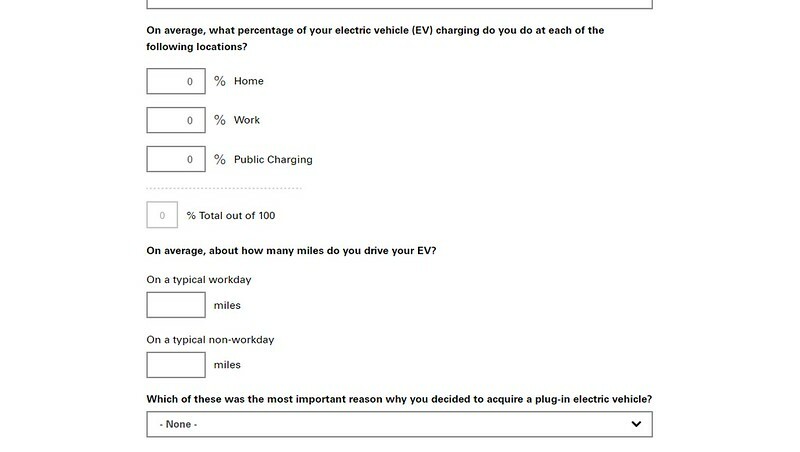 That means that our total EV mileage driven on vehicles that we’ve owned or leased now totals greater than 150,000 miles on electricity. As impressive as this is, it is even more interesting to note that our actual totals are much greater than this. 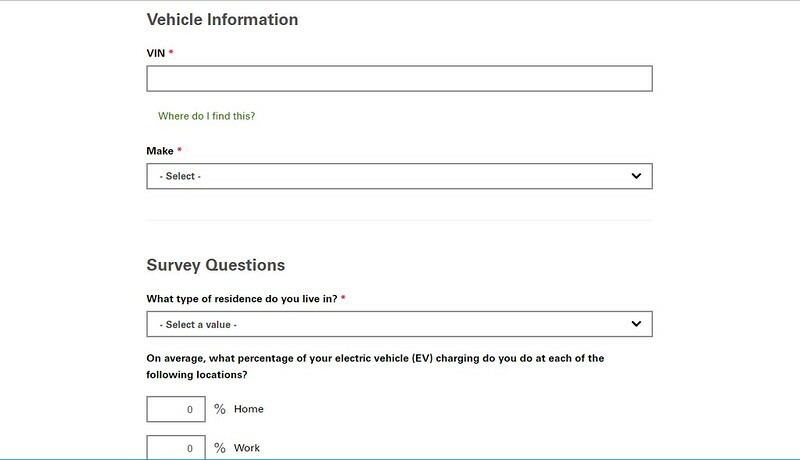 During periods when we’ve had our cars in for service, I’ve been tracking our EV vs ICE miles and we’ve done about 80,000 miles on loaners and rental EVs. 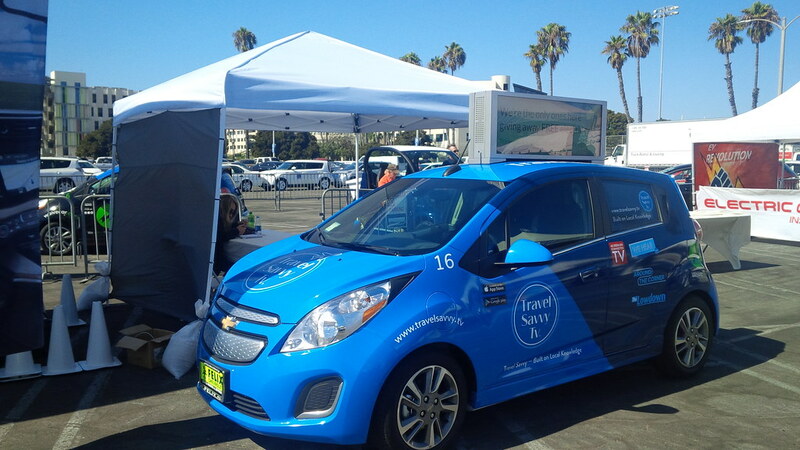 So, our actual total is about 235,000 miles of electric driving. In the meantime, we’ve done about 24,000 miles of ICE driving on our 2001 BMW X5 (both our driving, and when we lend the car out to visitors) as well as the times that we’ve rented ICE cars when we travel. 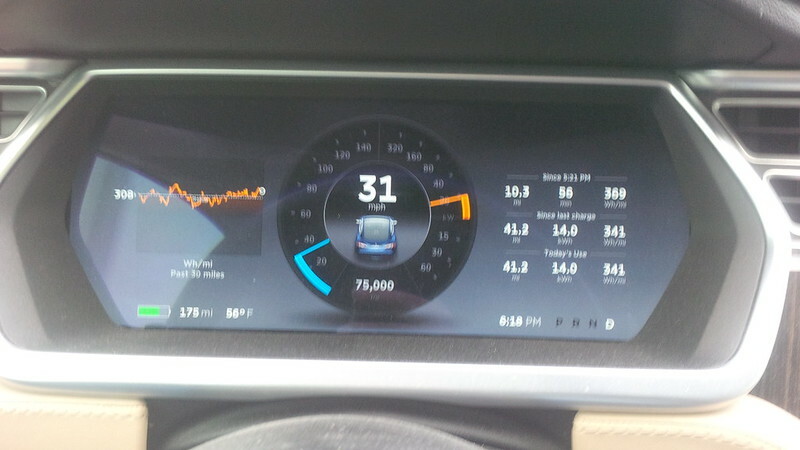 When I reached 74,000 miles of the Model S earlier in April, @Brian_Henderson (FYI: 75k is 3 orbits of Earth  driving pole over pole. ⚡) reminded me that a circumnavigation of the Earth is approximately 25,000 miles and this is also cool to hing that all the vehicles that we’ve owned or leased means that we’ve travelled 6 orbits of the Earth. So, that’s cool. 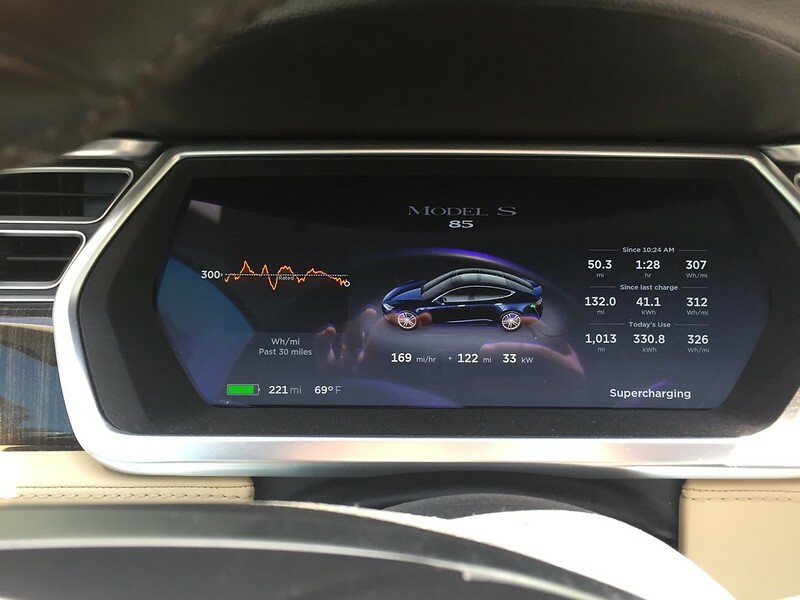 So, are we going to reach 75,000 miles on the Model S this month? I’m pretty sure that we’ll get there before the end of this month. If not on our beginning of June trip. 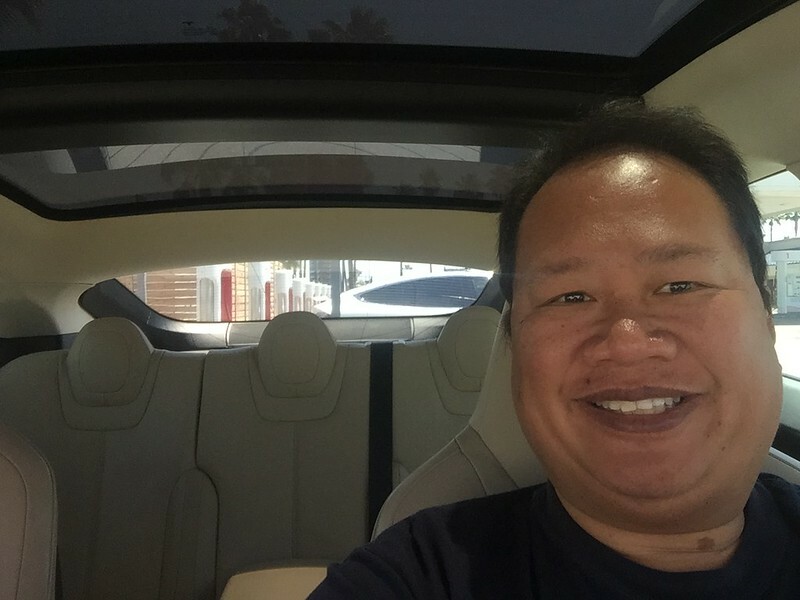 Posted on May 8, 2017 Categories ActiveE, Tesla, Tesla Model S, Tesla RoadsterTags ActiveE, BMW ActiveE, Significant Mileage, Tesla Model S, Tesla Motors, Tesla RoadsterLeave a comment on I’m sure that we’ve driven over six orbits of the Earth on EV power alone! 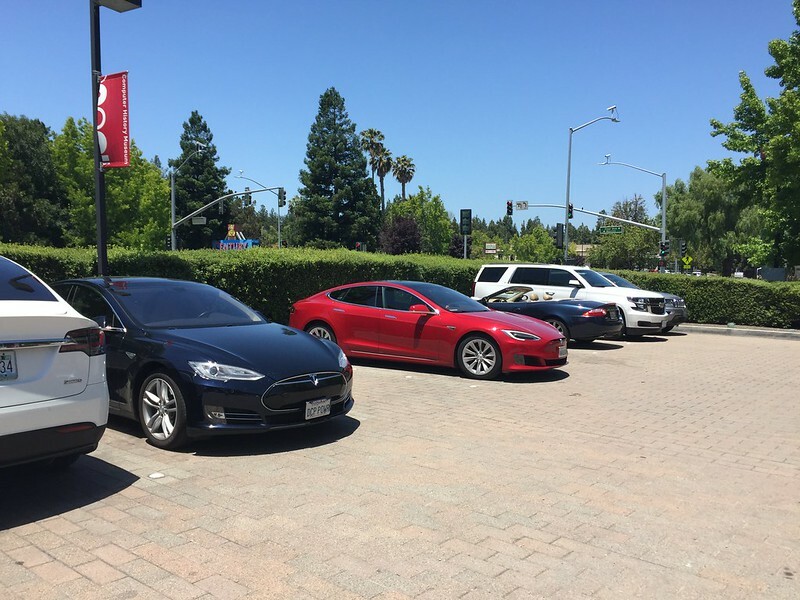 Impressive supercharger expansion plans were published on Tesla’s blog today. 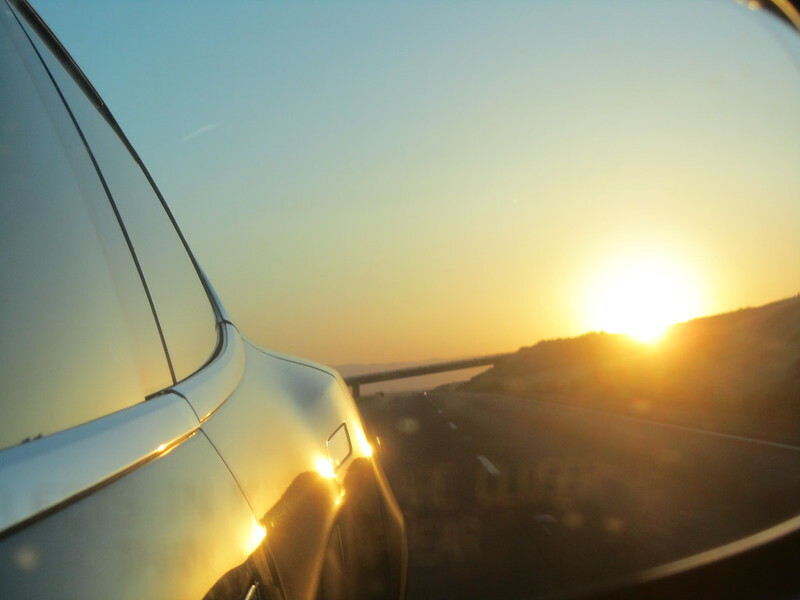 In the first couple of sentences of this latest blog, Tesla reaffirms its commitment to charging for its customers. 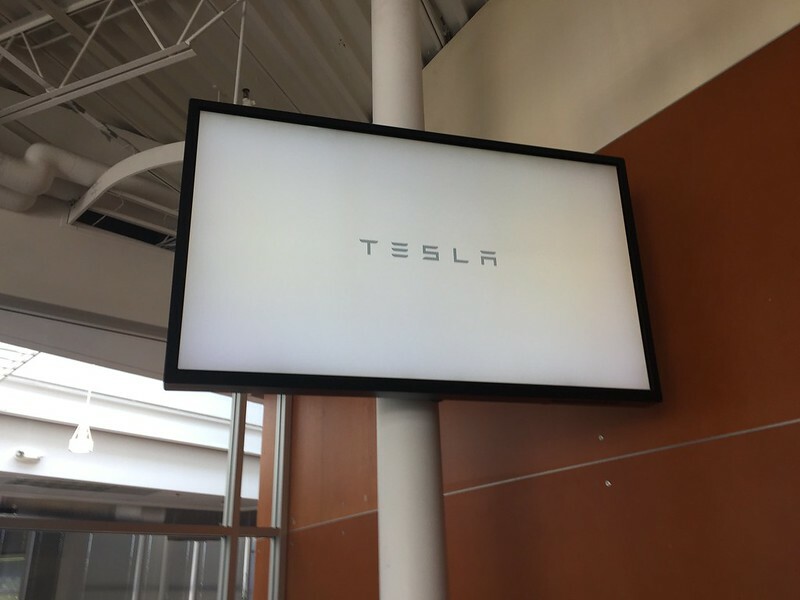 As Tesla prepares for our first mass-market vehicle and continues to increase our Model S and Model X fleet, we’re making charging an even greater priority. 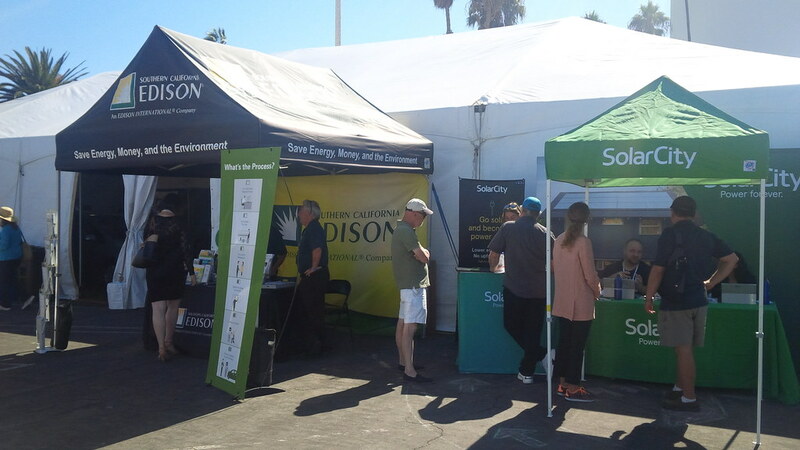 It is extremely important to us and our mission that charging is convenient, abundant, and reliable for all owners, current and future. 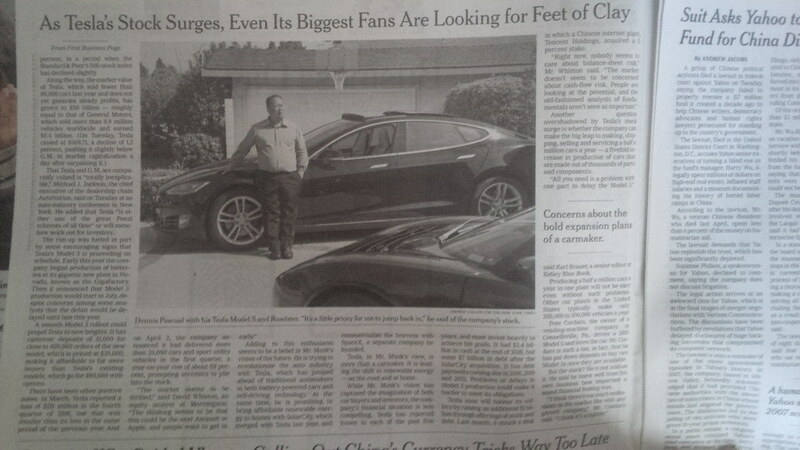 Well, supercharging does that for almost ALL the models of cars that Tesla has sold. Just not ALL the cars that they have sold. 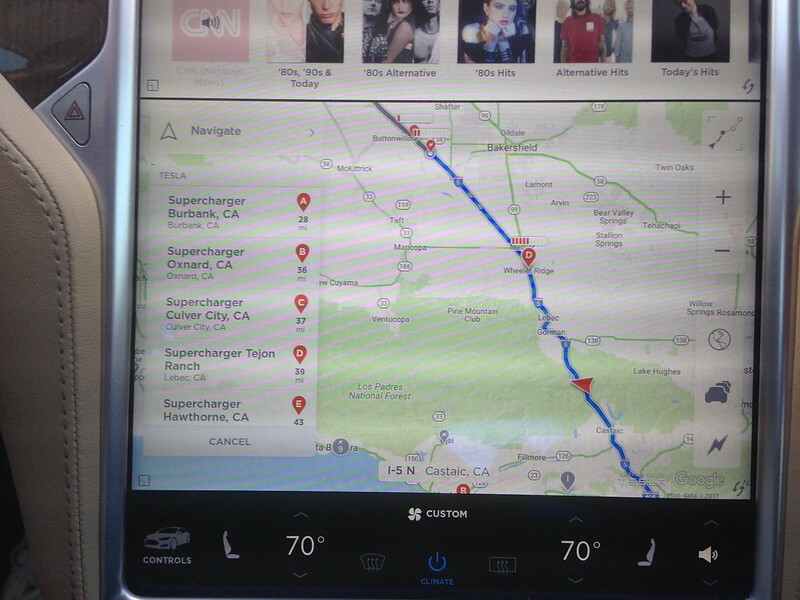 The Roadster and Model S 40 both do not have access to supercharging, but have ample range to make it the distances that are set up between MOST of the North American Supercharger network. I have not traveled on any of the other Tesla Supercharger networks, so I am unsure of the distances between their sites, but would presume that this statement also holds true for those distances. 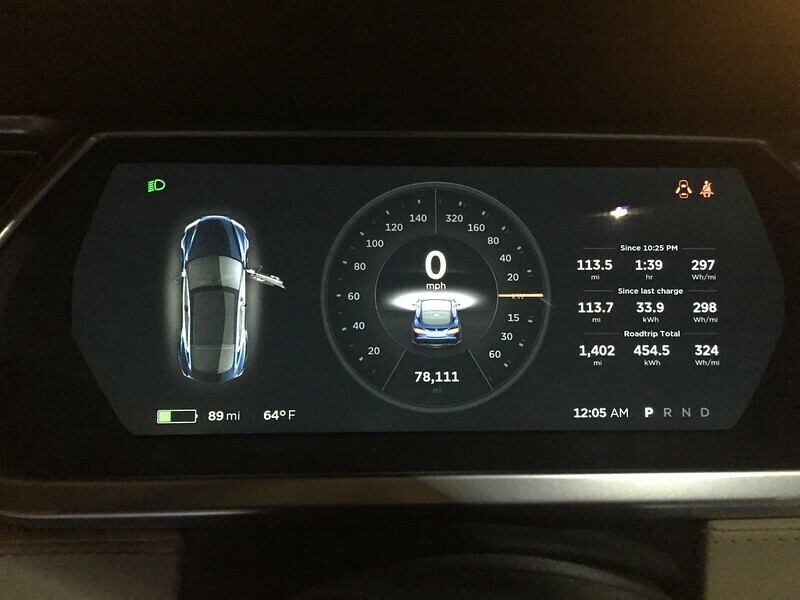 We have been blessed to have our Model S available for us to travel these distances, but we know of several Roadster owners who would prefer to travel these distances and I would like to try to do that, one of these days. 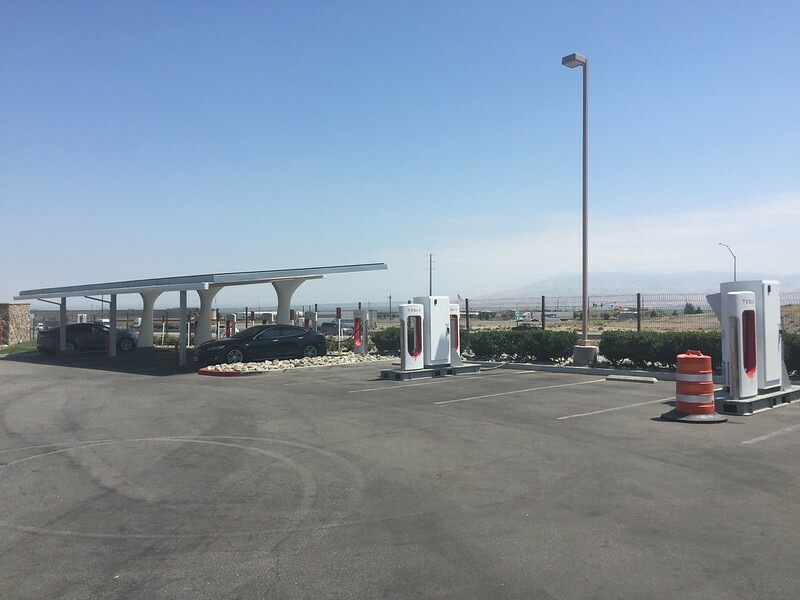 To that end, if Tesla’s blog-post is any indication, it would seem that Tesla’s next iteration of supercharging might indicate a LOT more space and dedicated Tesla lounges in the locations that would be dedicated to this activity. 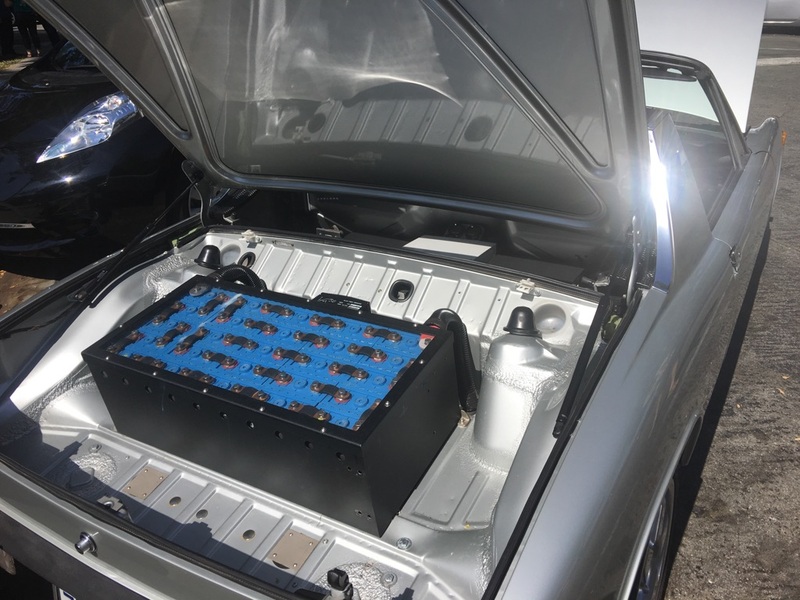 If this is what Tesla is planning to do, why not provide a couple of stalls with Tesla dedicated Level 2 for those that are not in need of a supercharge. 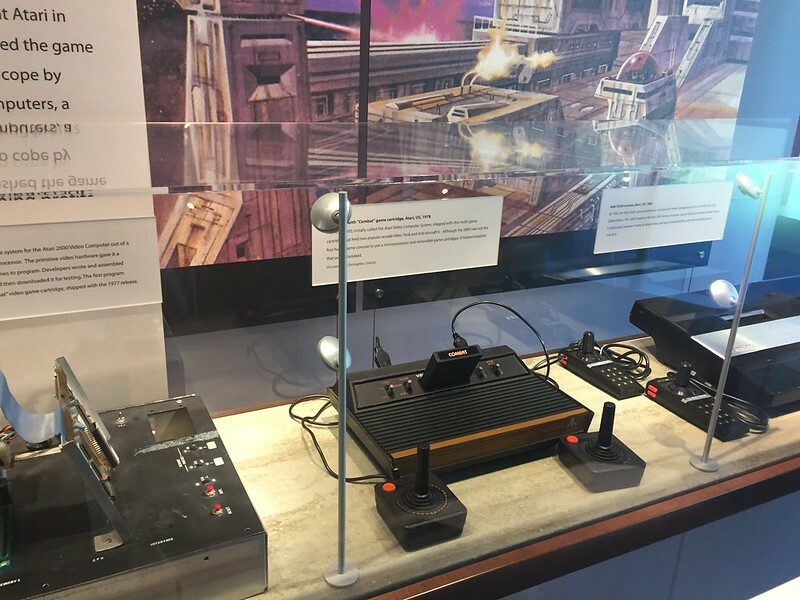 They can even fit these devices with a credit card or other payment system so that those opting for the slower charge can pay for the energy and/or stall that they are using for this travel. 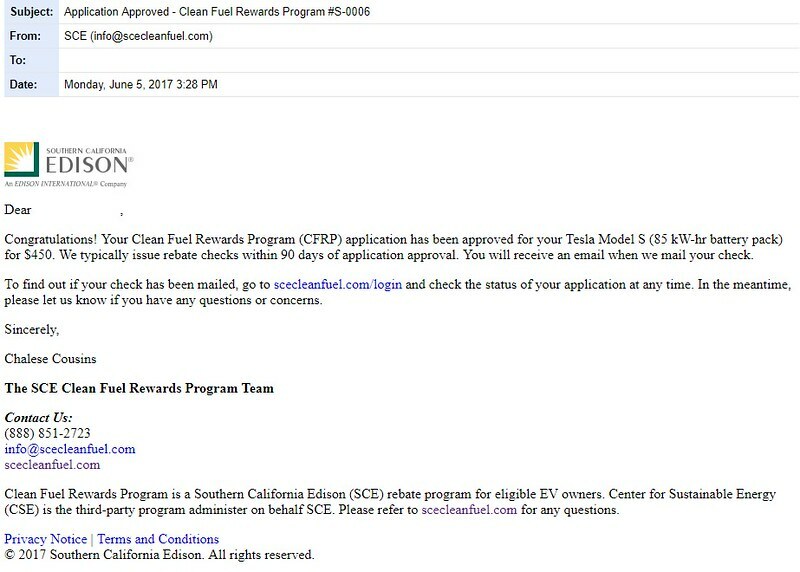 This allocation will then provide for Tesla to follow through on the statements that introduced this latest blog post. 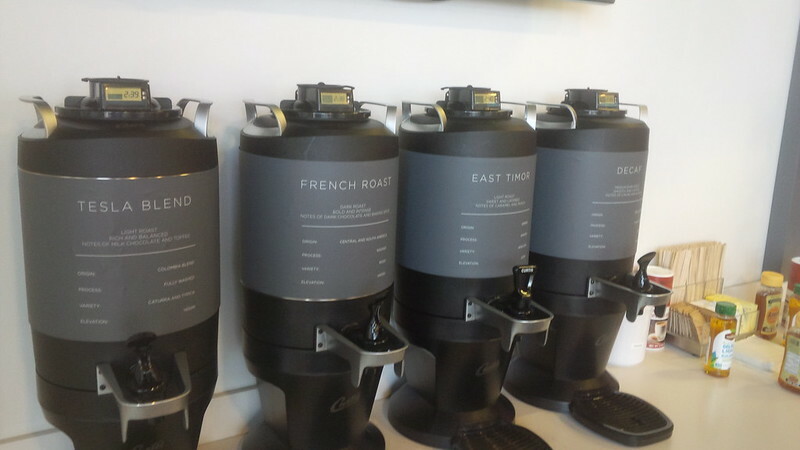 Besides, in terms of costs, it would seem such a high density supercharging location would be more vulnerable to higher utility costs than current density supercharger locations. 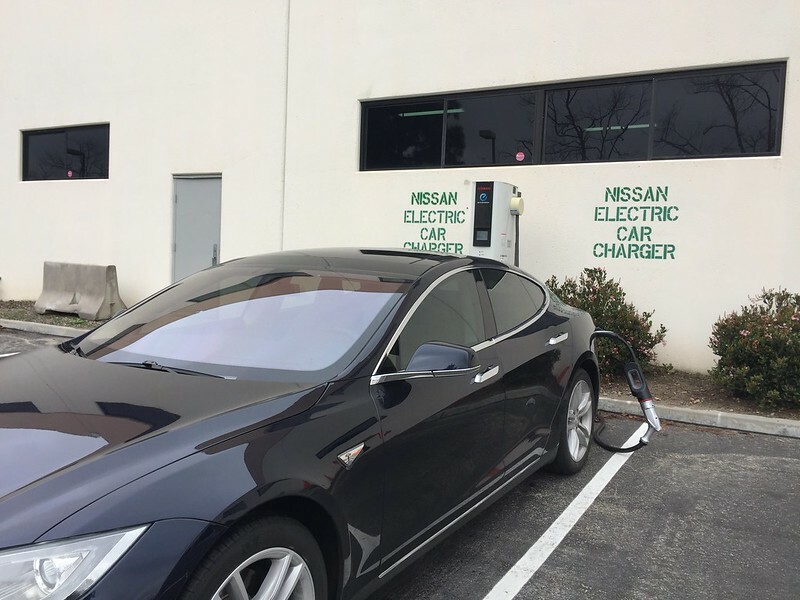 Things like demand charges and the like will definitely be a challenge toward the execution of this vision, therefore the costs associated with a couple High Power Wall Chargers (HPWCs) is really quite negligible. 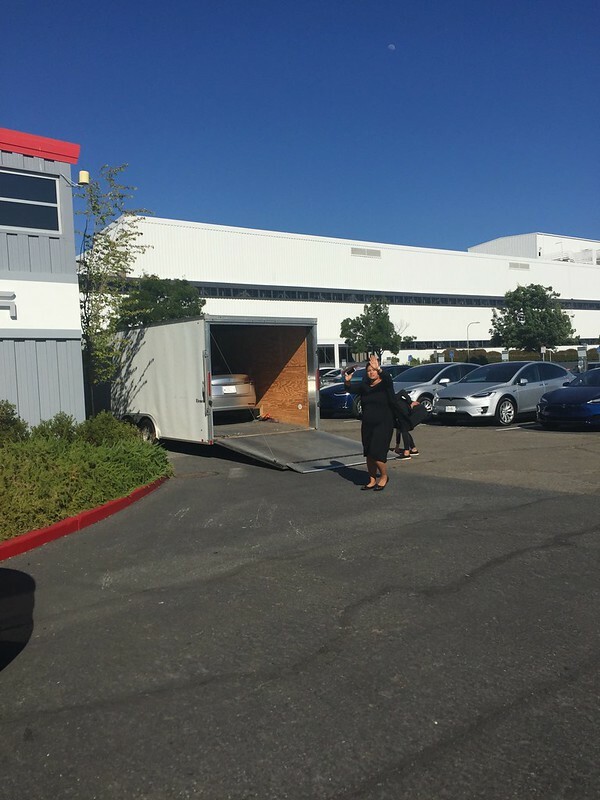 The other thought I had with this concept release was a feeling of “deja vu…” and I realized as I was writing this article that it reminded me of the Rocklin, CA Sales, Service, Delivery, and Supercharger location from Day 11 of 2016’s Long Way Round Trip to the Gigafactory. 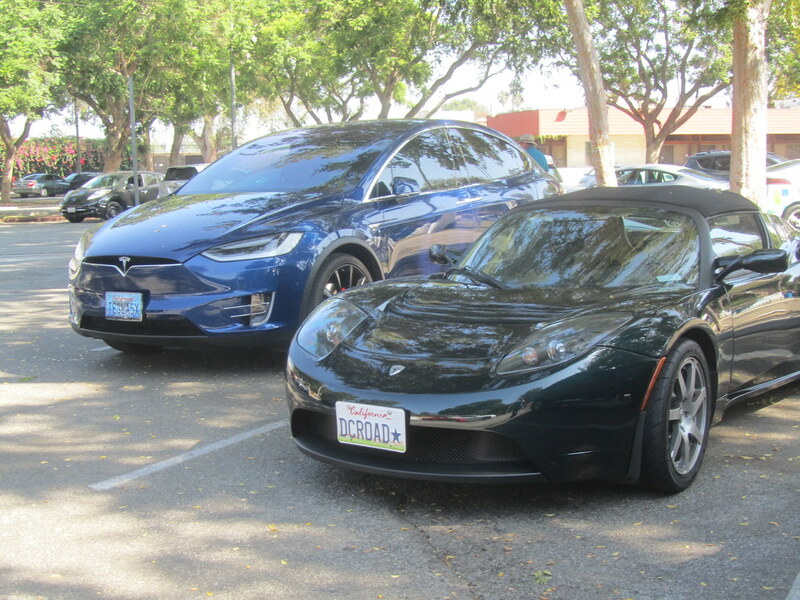 Which actually is a further case for this proposal to add High Power Wall Charger (for Roadsters, Dual Charger, or High Amp charger Teslas) at these new conceptual Supercharger locations. 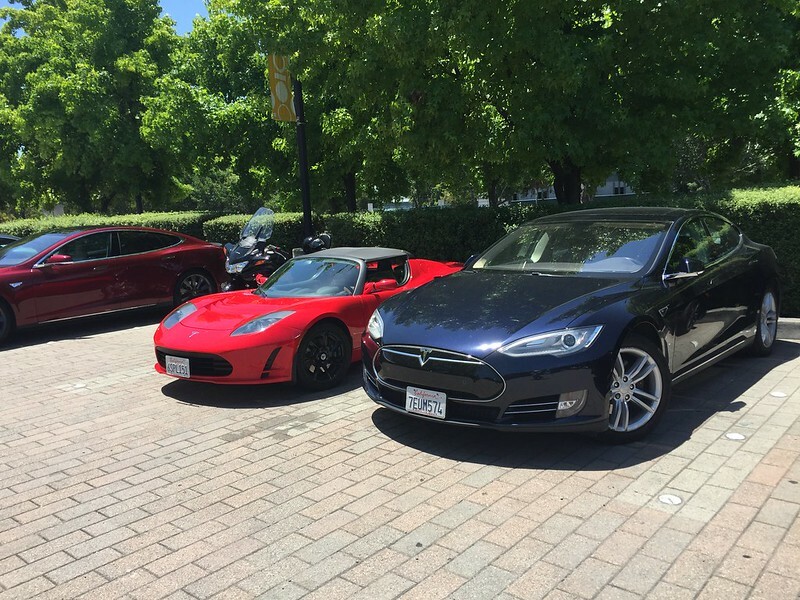 At this stop in 2016, we met with a couple who were also taking their Roadster up I-80 to Reno for the Gigafactory and TMC event. The direct costs for a stall or two of High Power Level 2 (keep it on Tesla proprietary plug if they must) covers all Teslas built. 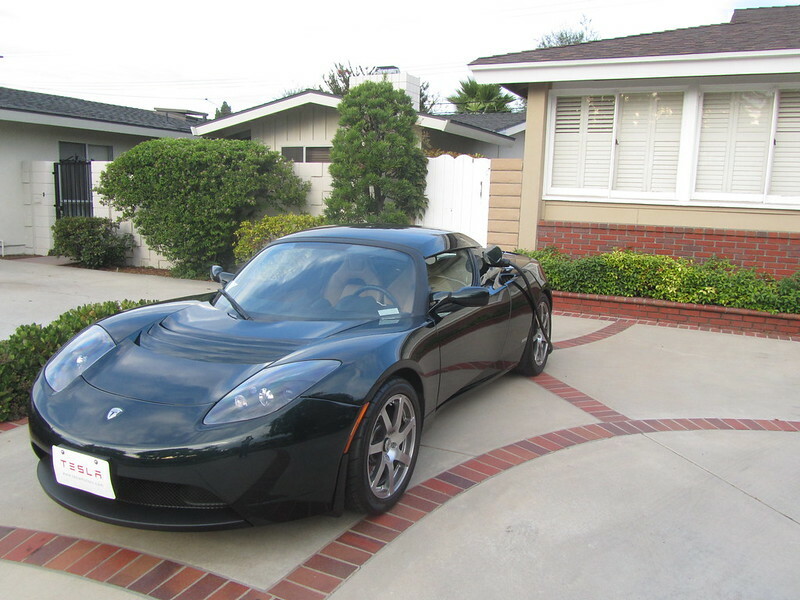 Most of the Roadster owners that I know have already purchased my recommended accessories for the Roadster, i.e. Henry Sharp’s The CAN SR/JR, etc. 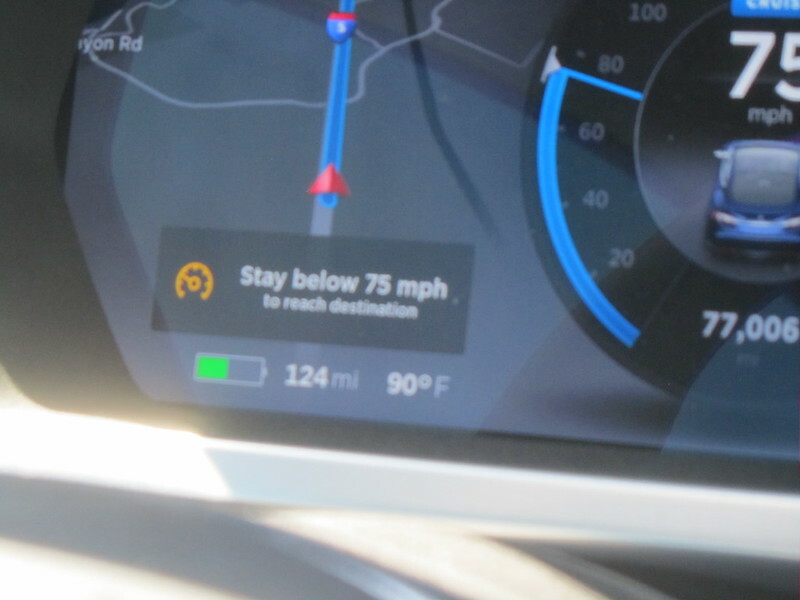 and can therefore work with the Model S/X North American Proprietary plug. 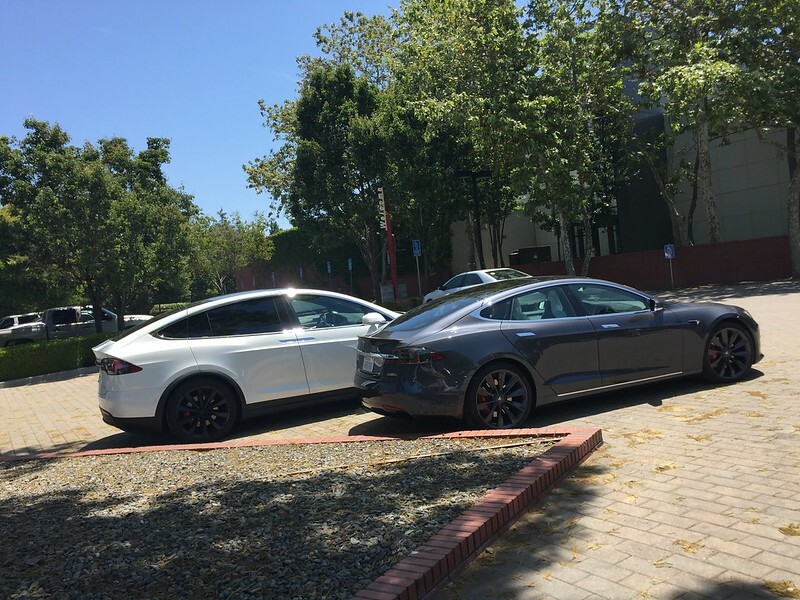 The more analytical may counter that the opportunity cost for two stalls on HPWC vs another pair of Supercharging stalls outweighs the benefits of covering ALL Tesla vehicles, but I say that the goodwill created by such a program is more important than that. 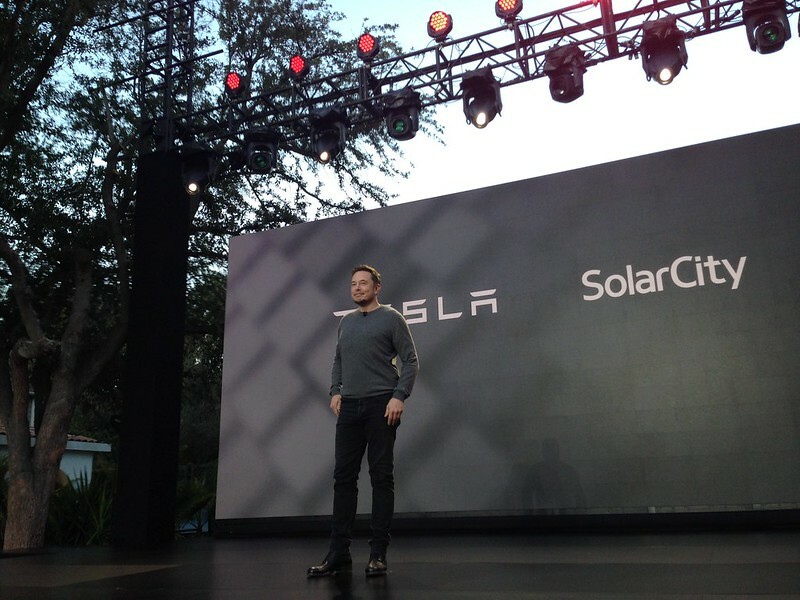 Tesla should execute on its statement today, but for ALL Teslas, not just the ones that can supercharge. February 23 is a special day for me. 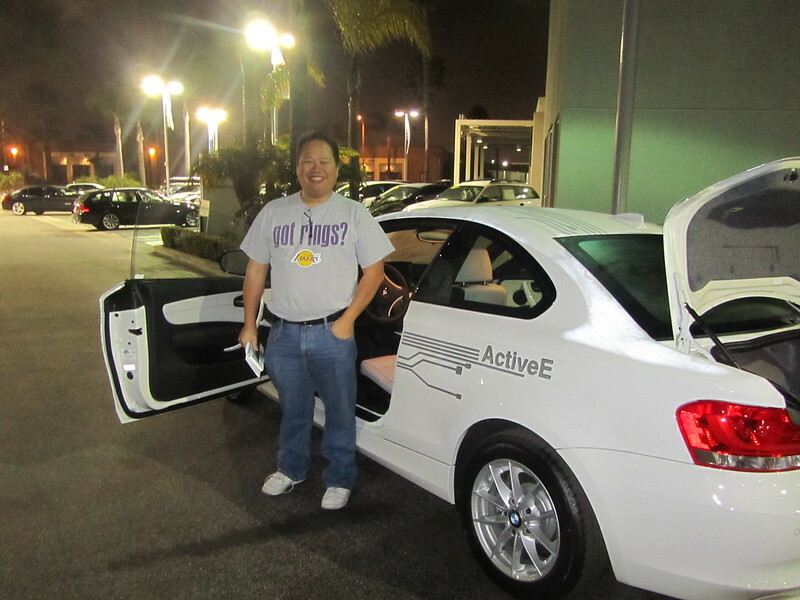 It’s the day that we took delivery of our first EV in 2012. 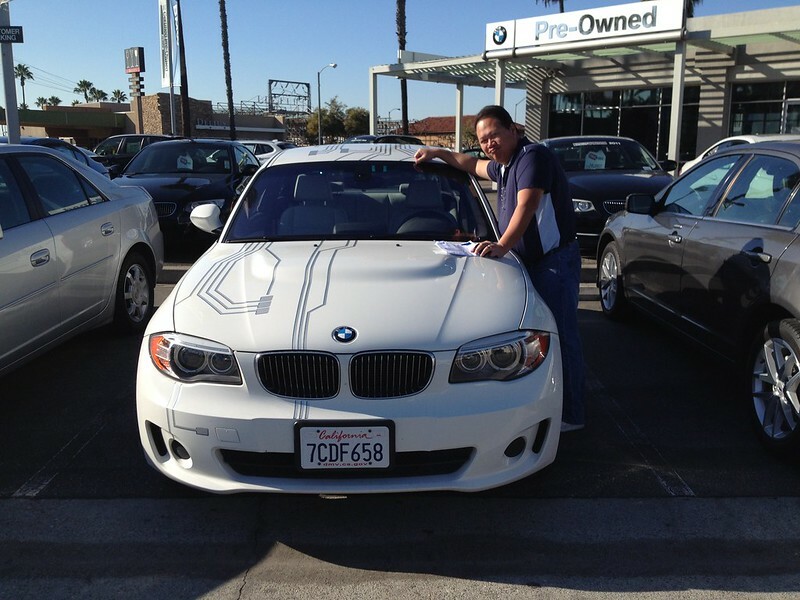 This means that five years ago, today, I joined the rEVolution and picked up my BMW Active E from Long Beach BMW. 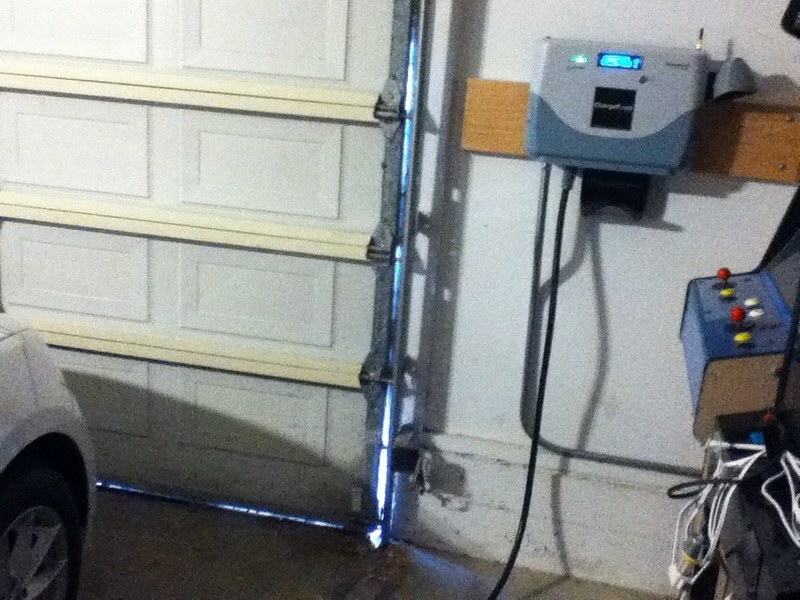 I didn’t even have Level 2 charging installed in the garage on that day and had to plug in the car on 110V. 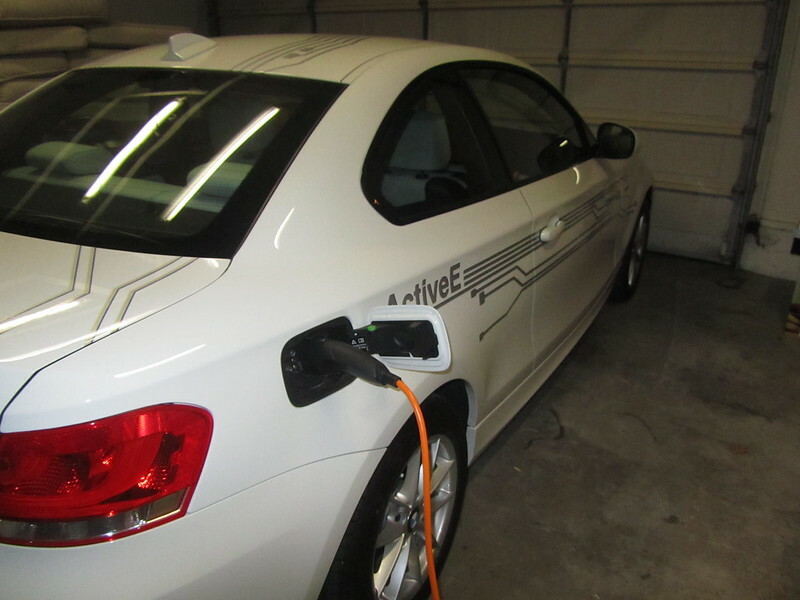 In fact, it wasn’t until several weeks have passed until I got our Level 2 charger installed under a grant that covered the charger, but not the installation. It’s a 30A J1772 charger from Chargepoint (CT-500) that is still going strong today (I use this for the Model S predominantly). It’s lost it’s networked feature as the modem in the device is no longer supported. What this also means is that February 23 is also a bittersweet day for me as well… As that same Active E was taken from me quite unceremoniously on this same day in 2014. Time does heal old wounds and I don’t pout when I say Active E anymore. 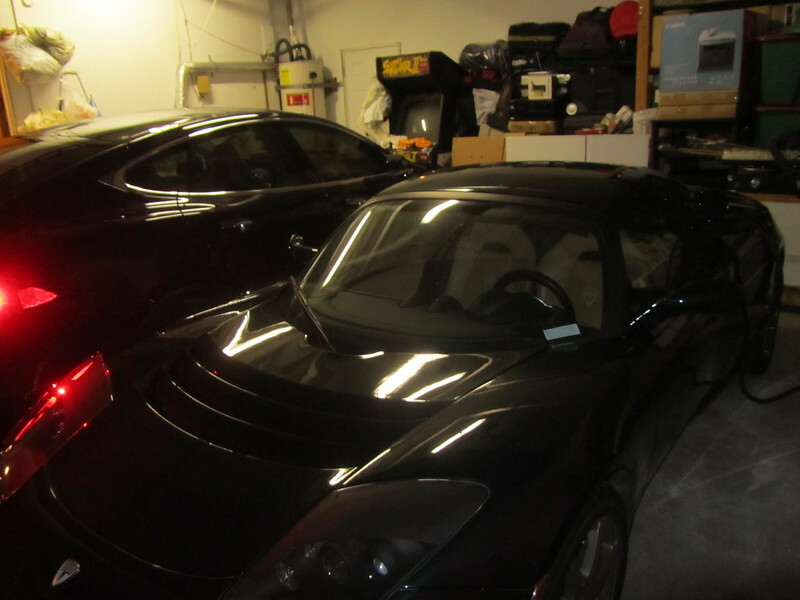 Then again, we did add the Roadster and Model S to our garage as we wait for our Model 3 and whatEVer else will take our EV future. 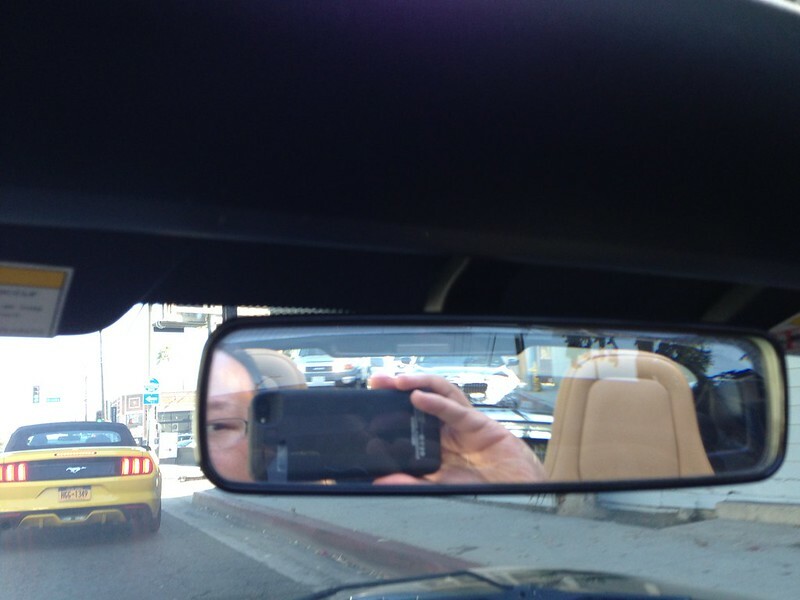 It helps that I can borrow the Roadster when my wife feels generous in letting me use it. and how it looks a week ago. 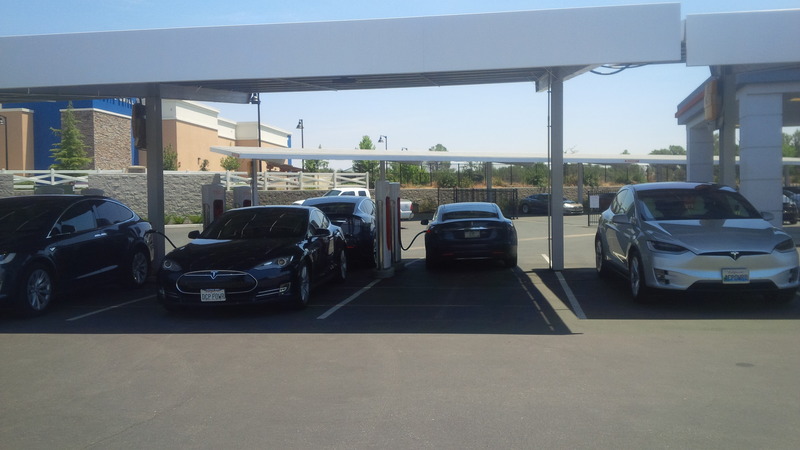 at its first Level 2 charge on our delivery weekend first roadtrip (in Sonoma for this shot). 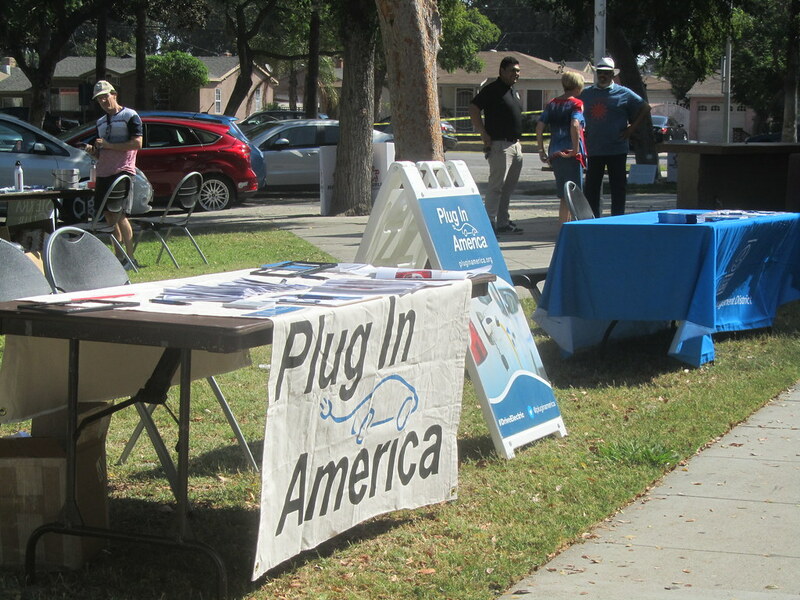 And this recent shot when I was using the CHAdeMO charger near the Fountain Valley Supercharger from almost two weeks ago. And a little nostalgia for those few months that we had more EVs than drivers in 2013-2014. 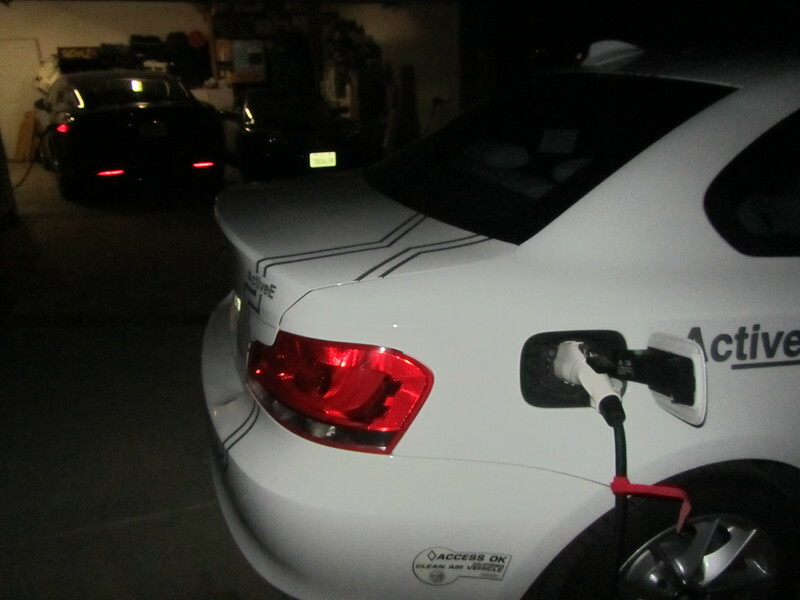 That was all three cars scheduled to charge at various times throughout the night on their own chargers. 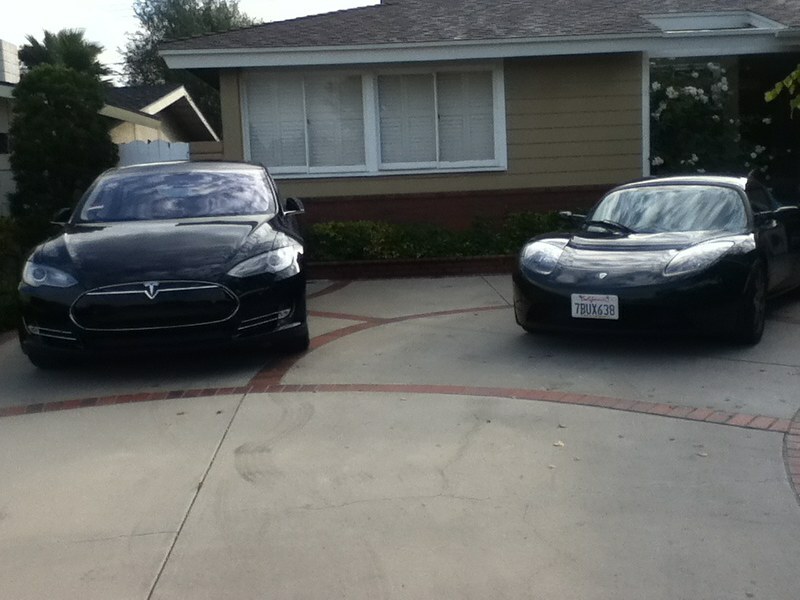 Unfortunately, didn’t have a better shot of all three cars… Here’s a classic shot of the Model S and Roadster on the Model S first day home. In fact, for the past five years since we picked up the Active E With all three cars (and various loaners and the few EV rentals we’ve done), we’ve added approximately 204,000 electric miles vs. 24,000 gasoline miles (both our own use, and when we lend our lone ICE car to visitors, as well as our use of ICE rental cars). What’s funny is how much fanfare I had when I first hit 100,000 electric miles, and 200,000 went by and I didn’t even pay attention to it. 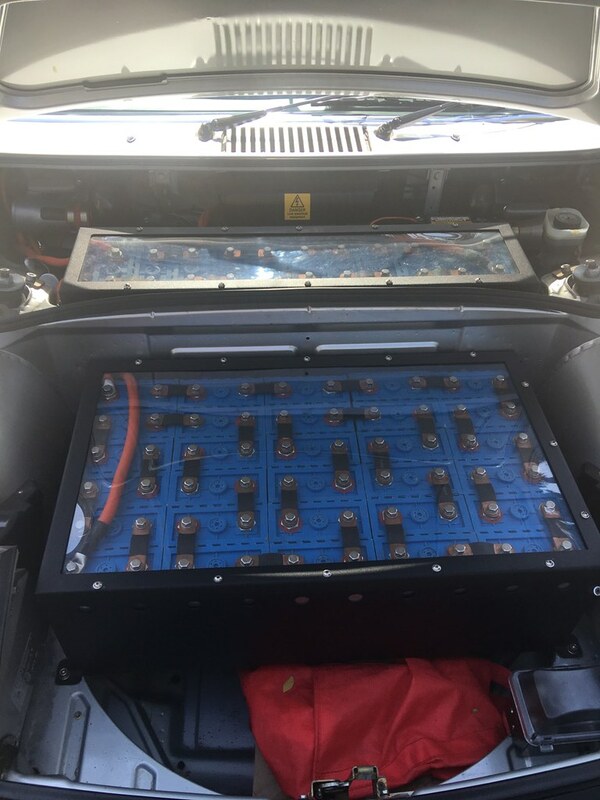 I’ve documented the challenges that we’ve had with all three cars and they’ve all pretty much “behaved.” In fact our Model S just replaced its first 12V battery earlier this week. 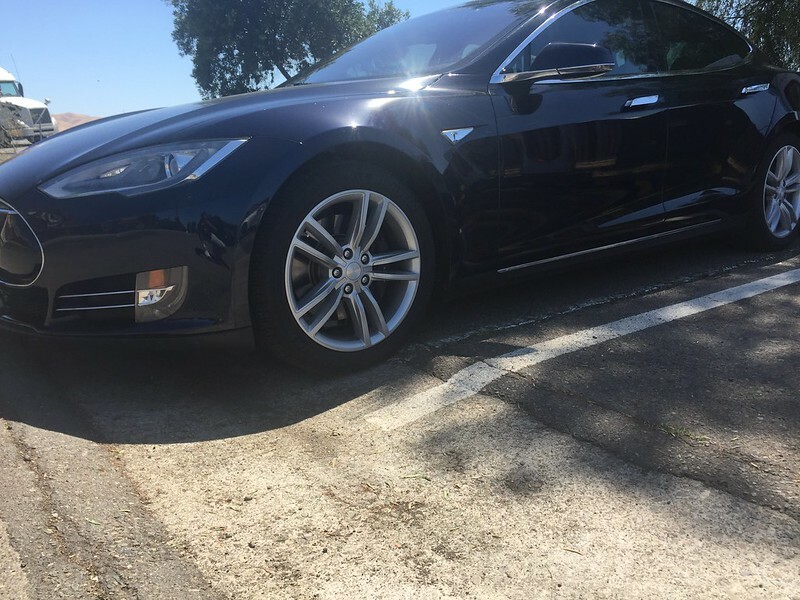 We’ve actually just replaced all four tires on the Model S a few weeks prior (still around 69,000 miles on the Model S). 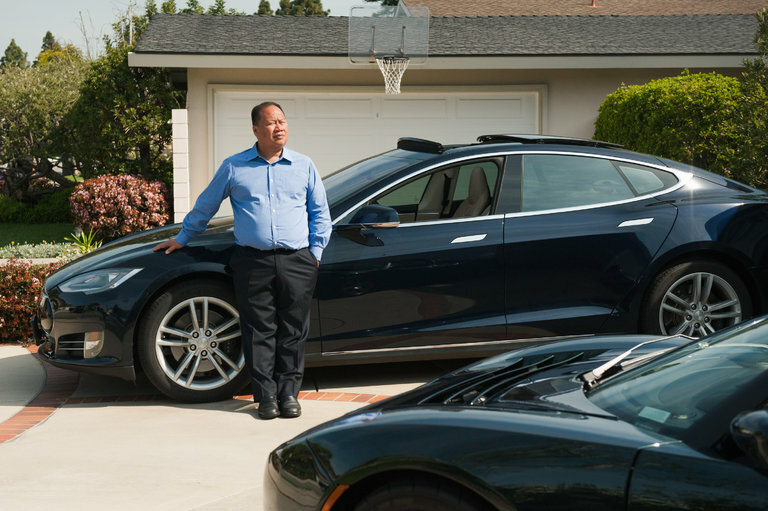 I guess what’s really special with driving EV is how “normal” it is for us now. 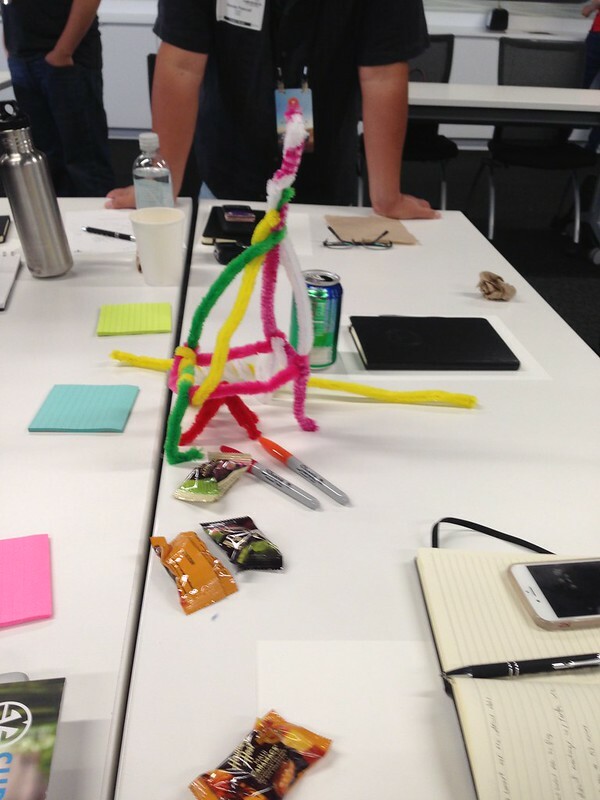 In the beginning everything felt like it was going to be a challenge. 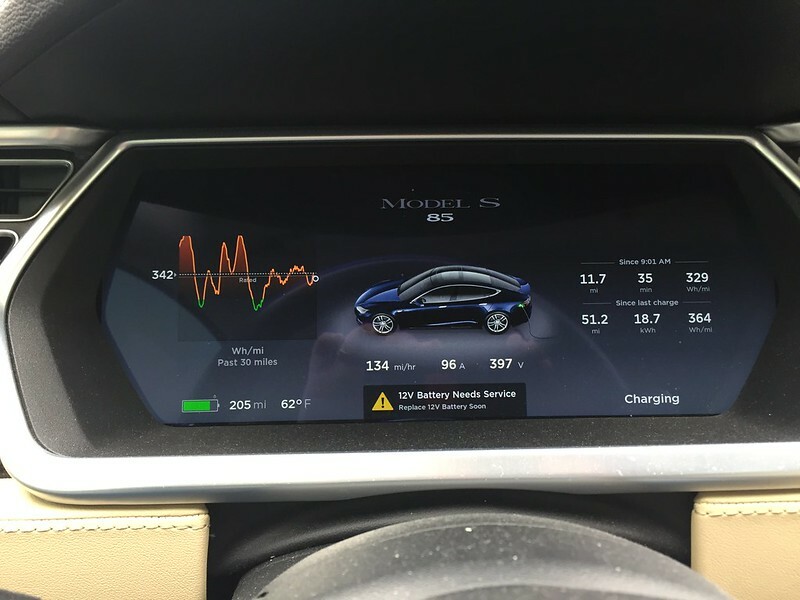 How we managed to get 54,321 miles in the Active E in the two years that we had it depended a lot on available Level 2 charging. The infrastructure was there and we planned our trips so that we can recover miles when we got to our destinations. With the Roadster, we didn’t need to plan as much. We often had enough range to get back home. 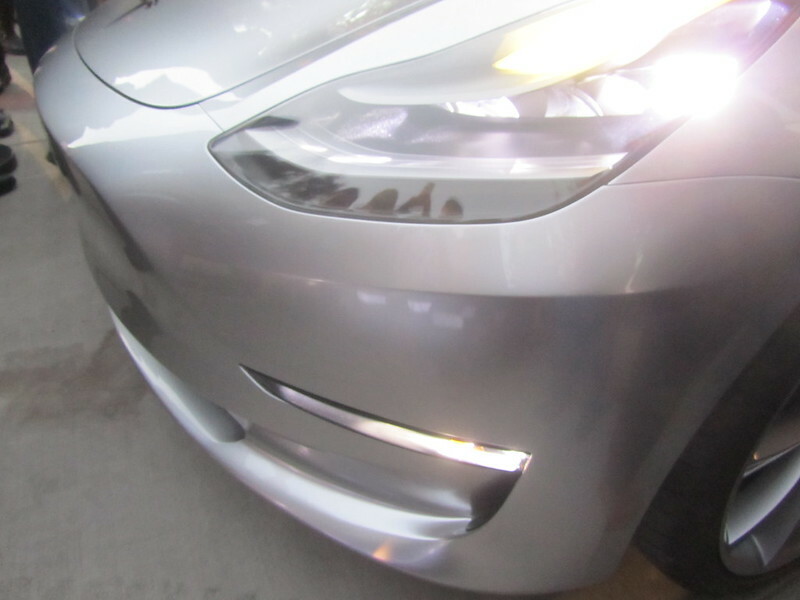 Now with the Model S, it’s even more interesting. 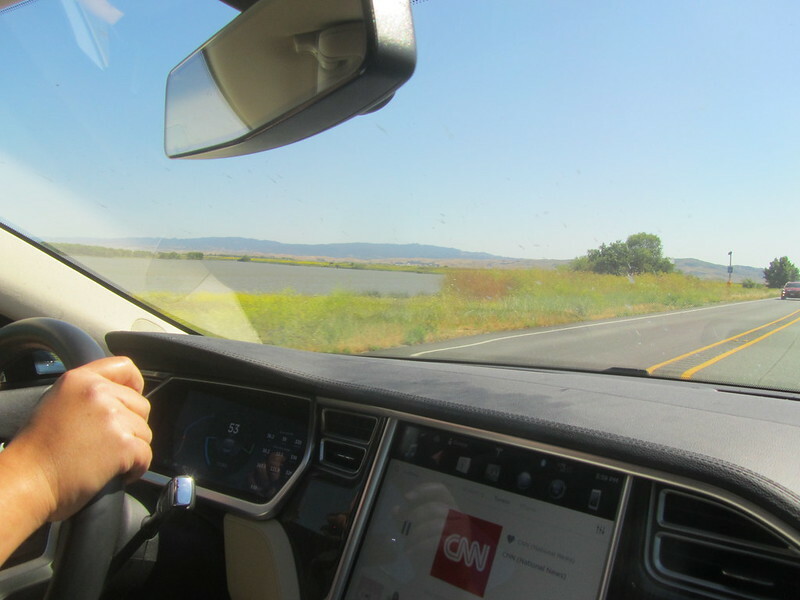 We went Here, There, and EVerywhere as well as the Long Way Round to the Gigafactory Party. 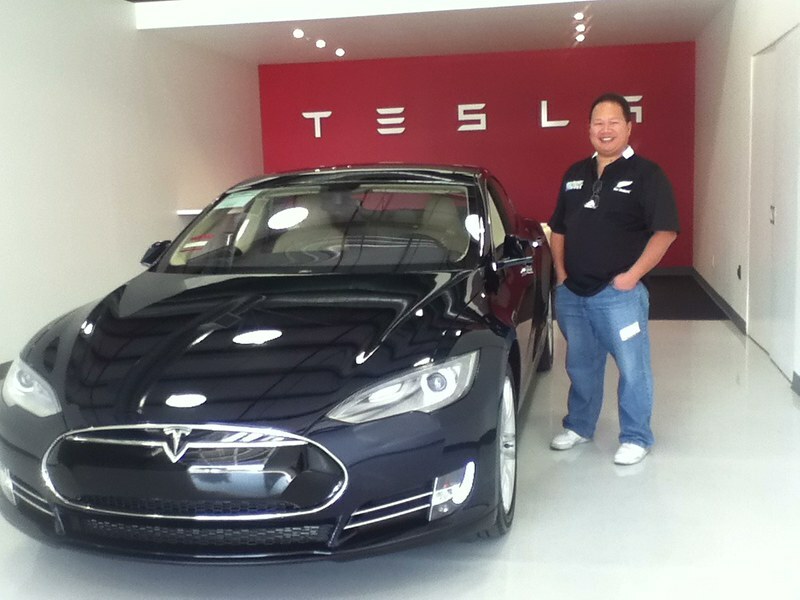 But the fact of the matter is, we picked up the Model S at the Fremont Factory. 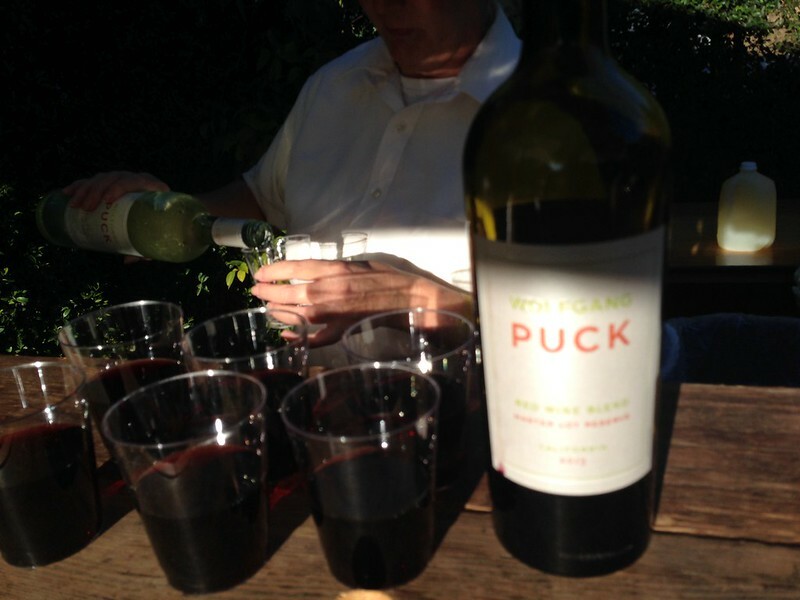 Went to Sonoma for wine and then back down to Southern California in November 2013, without much planning. 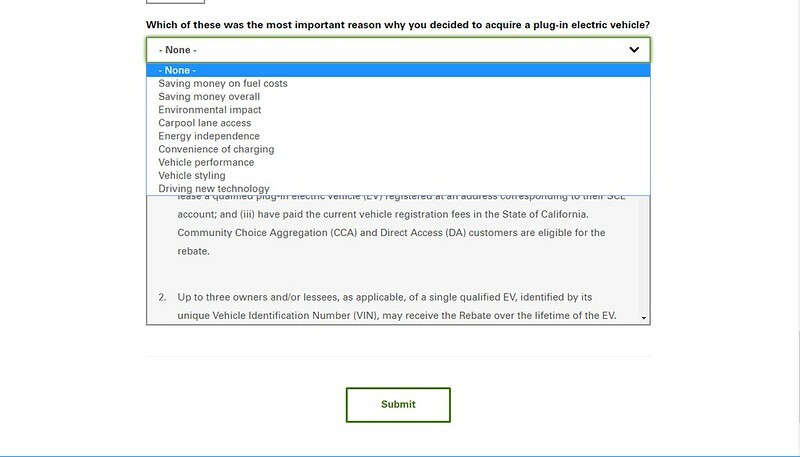 That’s what EV ownership should be like. Pick up and go. Are we there yet? To me, I’m there. But to the rest of the world, perhaps we’re getting there. It’s been a great 5 years and 200,000 miles of EV driving, and I’m looking for more and more EV adventures. Stay with us and see where electricity will take us. 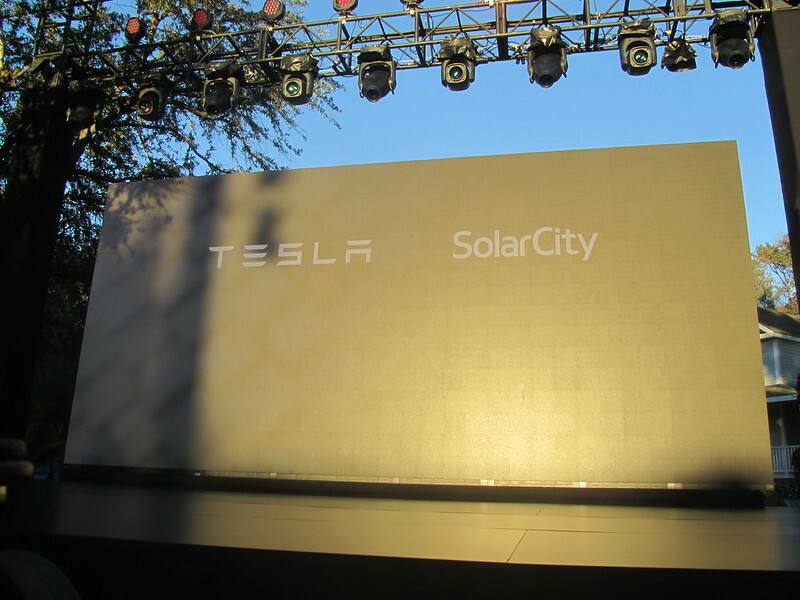 On Friday, October 28, 2016, approximately a year and a half since the original Tesla Energy launch EVent on April 30, 2015, Tesla improved upon the PowerWall and PowerPack, Tesla revisited Tesla Energy with the launch of the Tesla/Solar City product launch for the Solar Shingles. One could say that neither the PowerWall nor its succeeding product, the PowerWall2 really makes economic sense for our use case either. 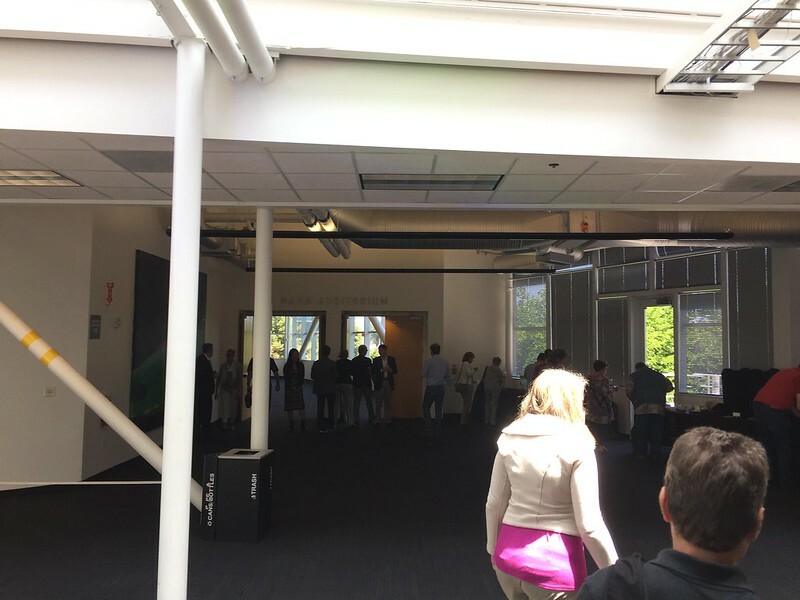 With net-metering still in effect in California, the economics of the PowerWall2 is not the reason to go ahead and purchase one. 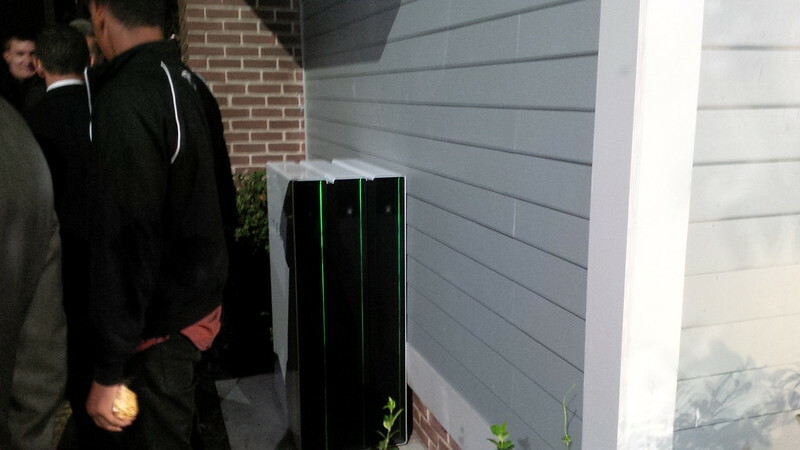 However, coupled with time-of-use, and the whole-house backup capabilities of the PowerWall2, it looks like a great solution for a whole-house backup system. 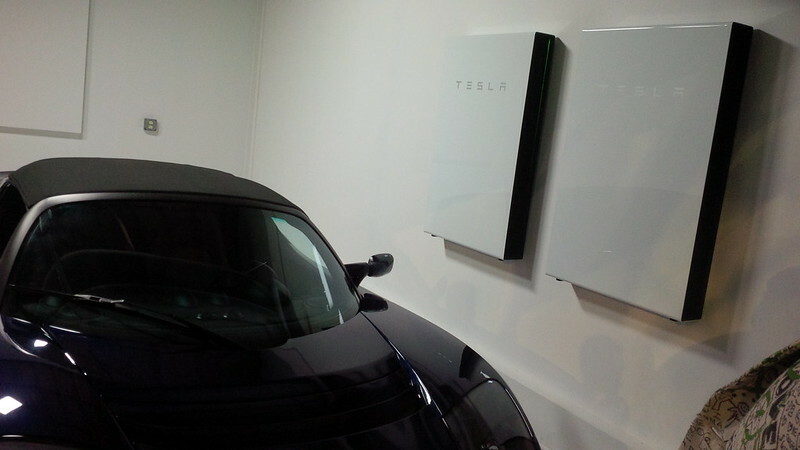 With our summer peaks generating power at 40 kWh, two units may be all we’ll ever need. I intend to recharge the system during the super off-peak time of day and get more bang for our buck by feeding back our solar production to the grid at a higher rate. 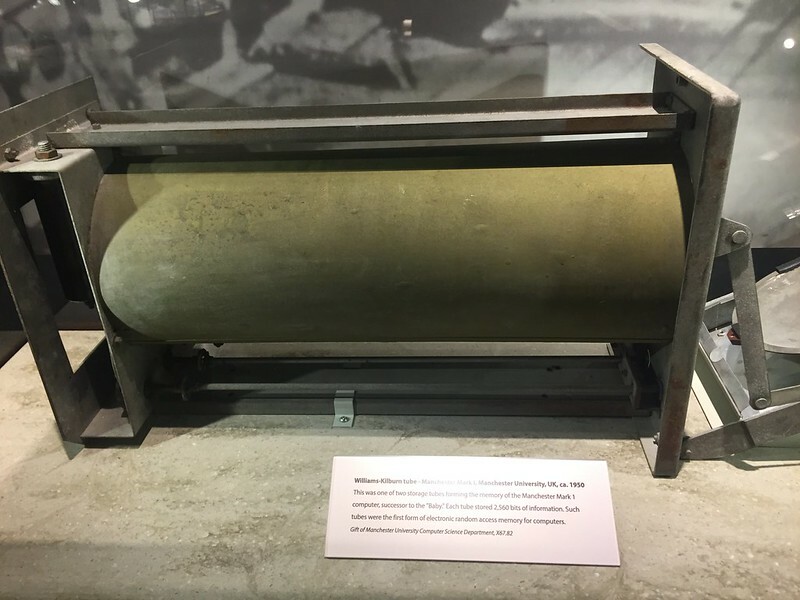 Southern California is known to be very seismically active, and a whole-house backup system might just be something that would be really cool to have. 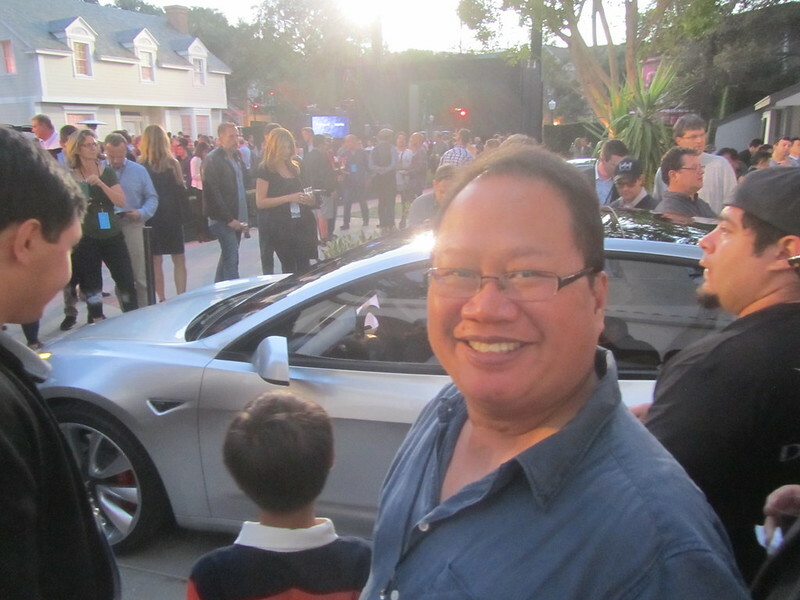 I was involved in tweeting out details for the event this past Friday through both my own account and my friends at Teslarati’s as well. 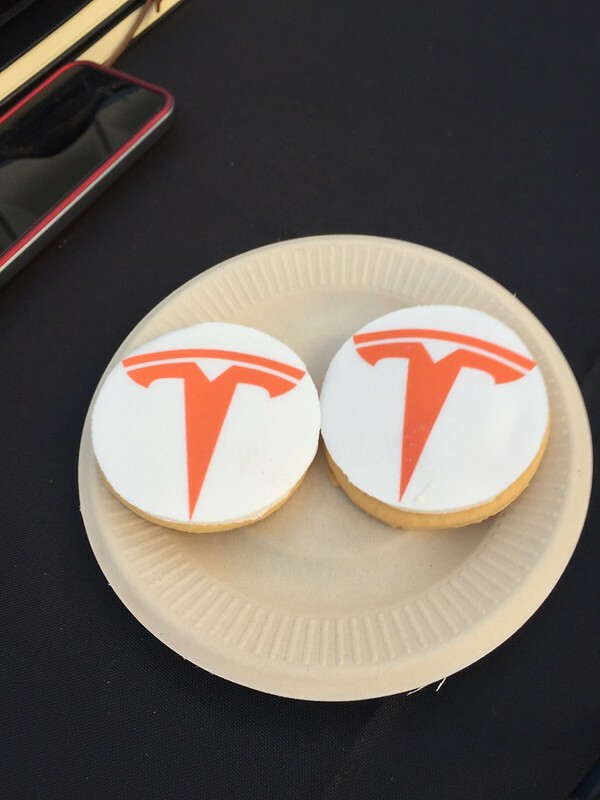 The guys at Teslarati had family commitments to attend to during the event and I was approached to see if I could possibly cover their Twitter feed for them, so I embed those tweets that I sent out here. 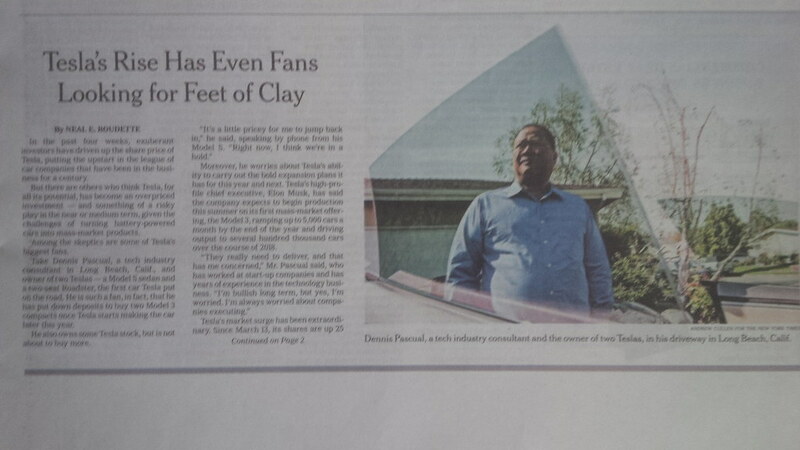 Hope those of you that follow Teslarati and my Twitter accounts enjoyed the coverage. 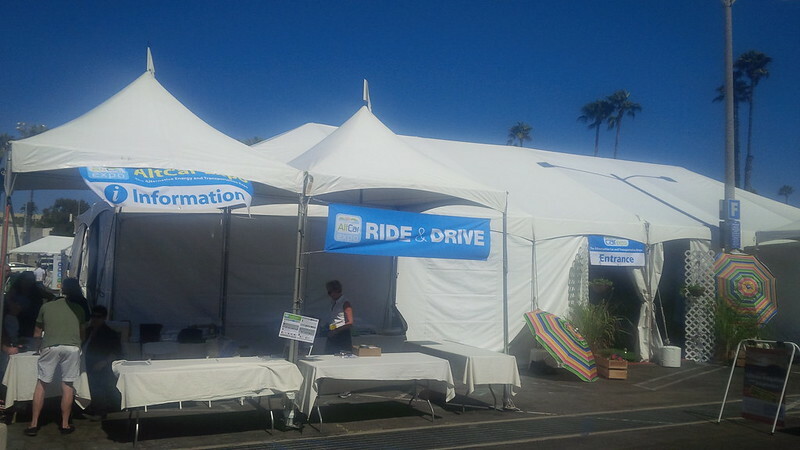 Since I committed to cover the event for Teslarati, I figured that we should arrive a little early. No press pass for me, but covering it as an owner was fine for them. 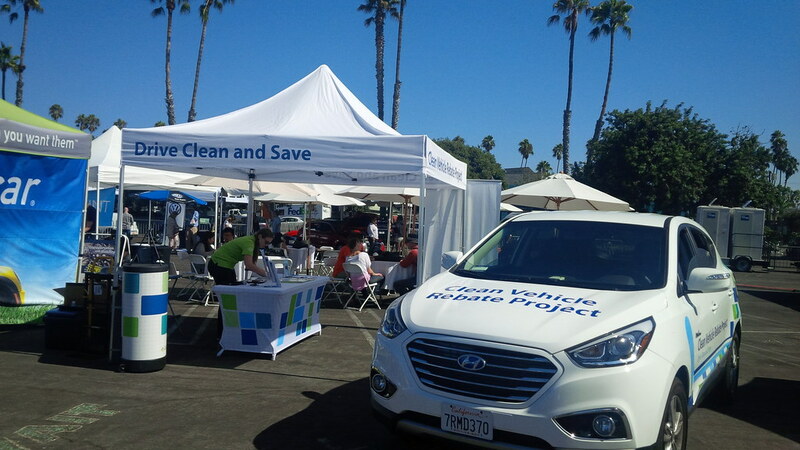 The valet at this event provided sent us a text with a mobile website to handle the request and retrieval of our vehicle, it’s a lot more greeen than handing us a paper voucher. 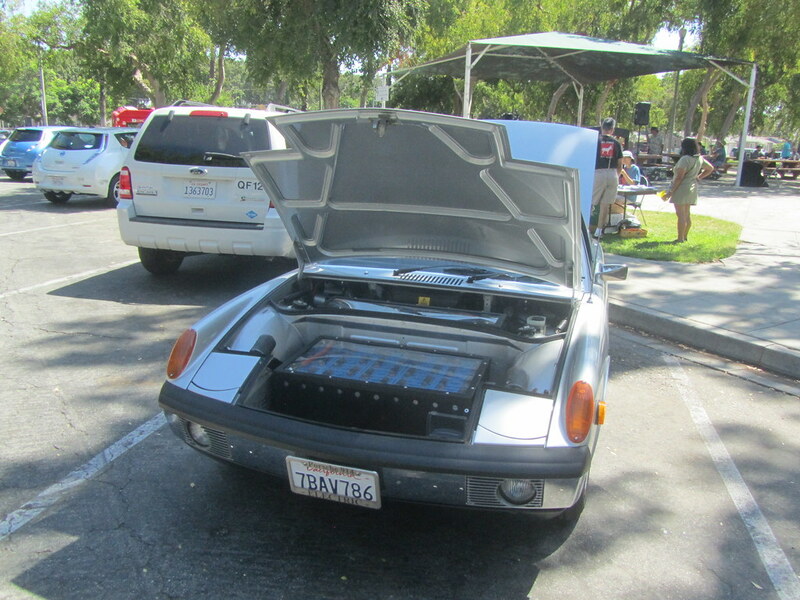 I don’t remember whether they had this system at the last event we drove in for. 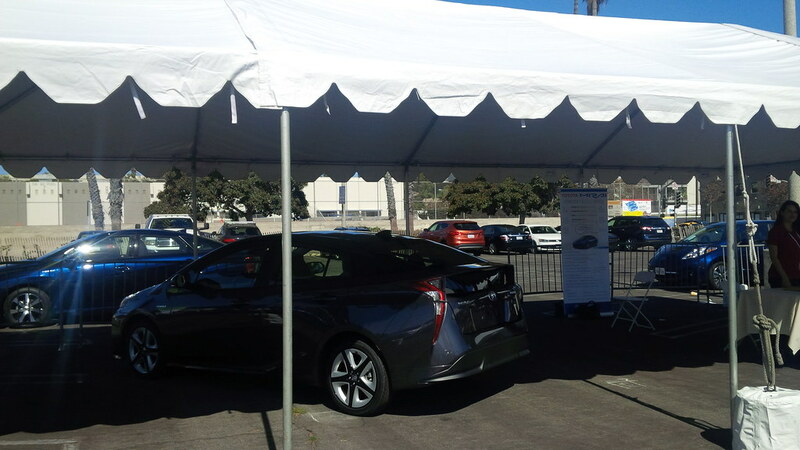 It’s been a while that we valet parked a vehicle at a Tesla EVent since the last Tesla event for us was the Gigafactory Party that was the subject of our Long Way Round Round trip. 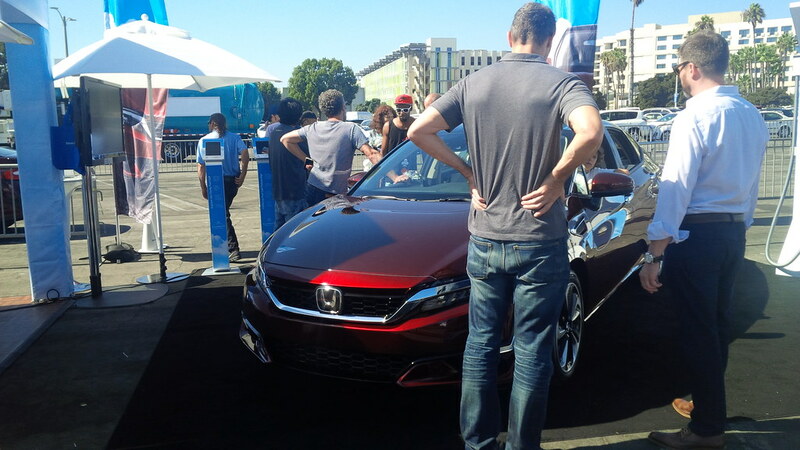 However, we took a loaner to the event. 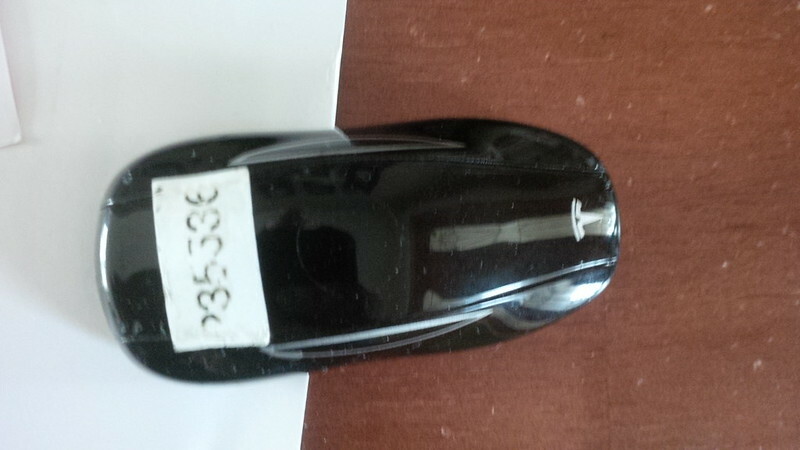 So, I photographed the vehicle and key to ensure that I know what I’m looking for. 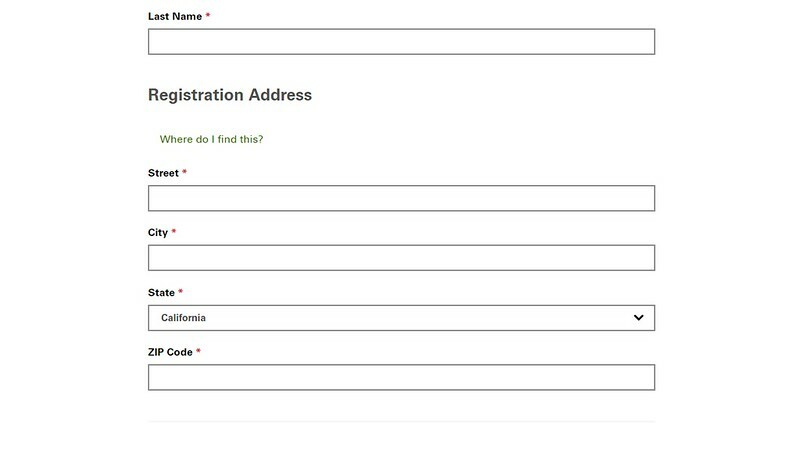 Just in case this SMS ticket method were to fail. 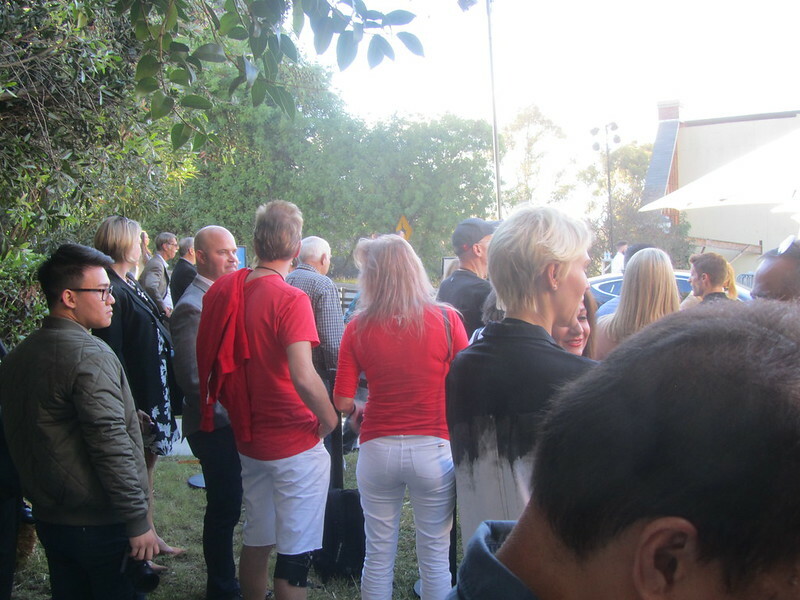 We were among the first ten cars through the valet and had been asked to wait in a lounge area to the right of the check in desk until they opened the “neighborhood” area. 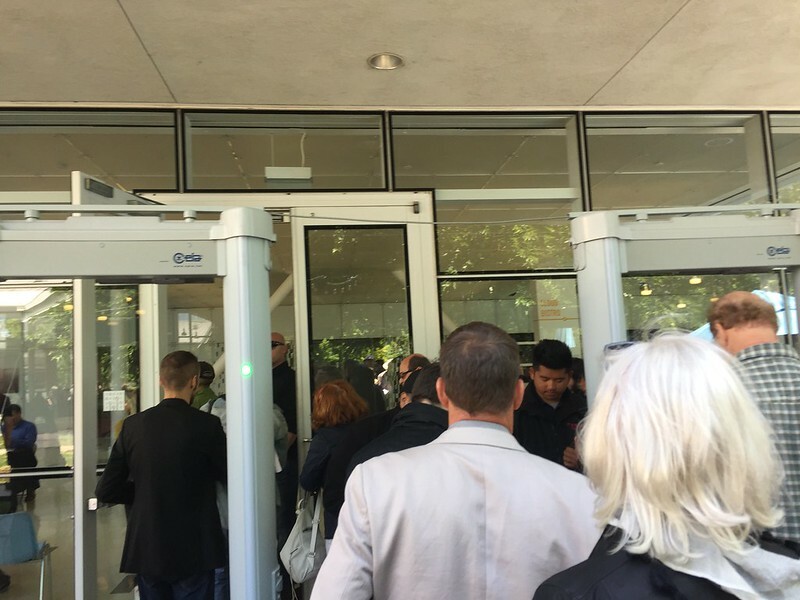 I think that the folks were unprepared for the number of people forced to wait in this area. It was standing room only. 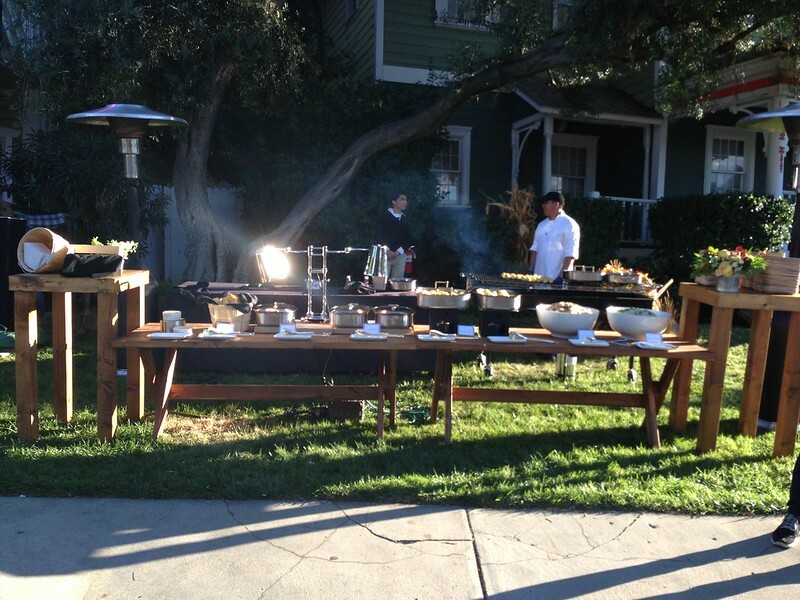 Tesla’s catering services were the best that we’ve had in the various parties that we’ve attended. 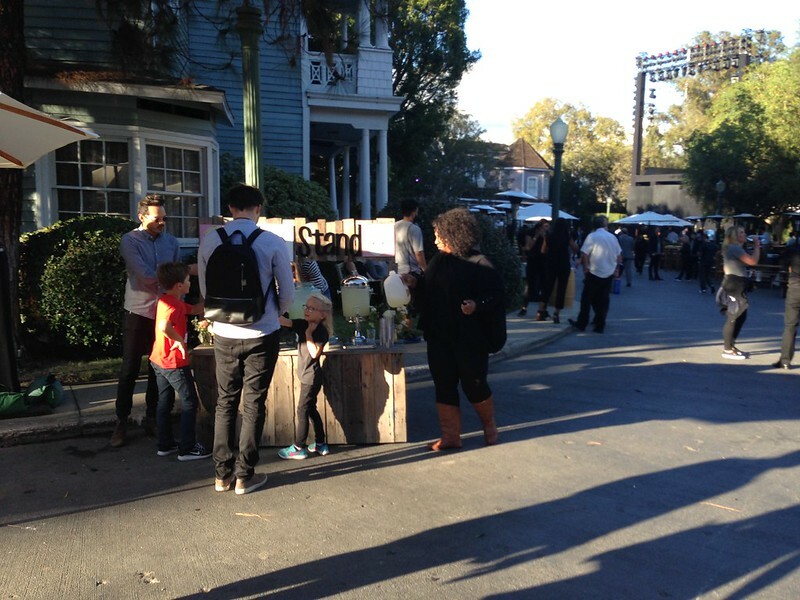 The neighborhood setting had enough seating, the food and drink was plentiful and did not run out as they have in the past. 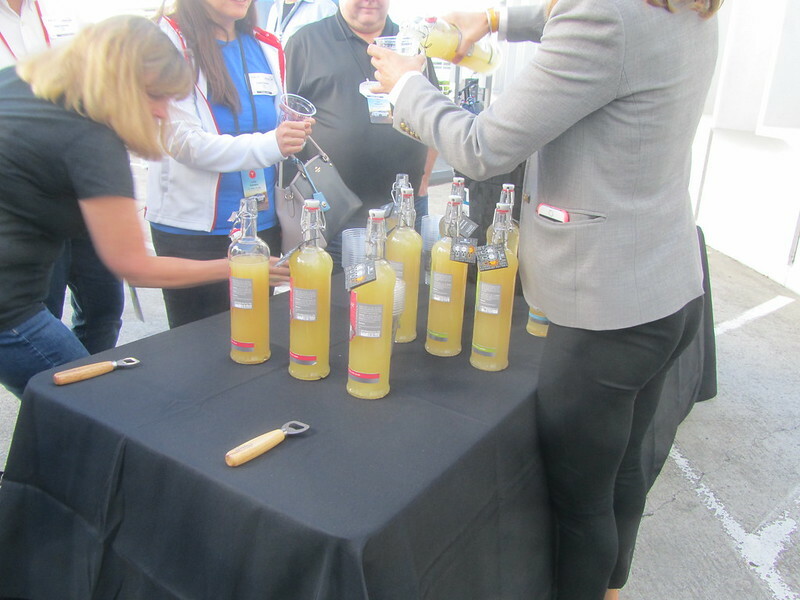 There was a mix of self-serve sections as well as server provided locations. 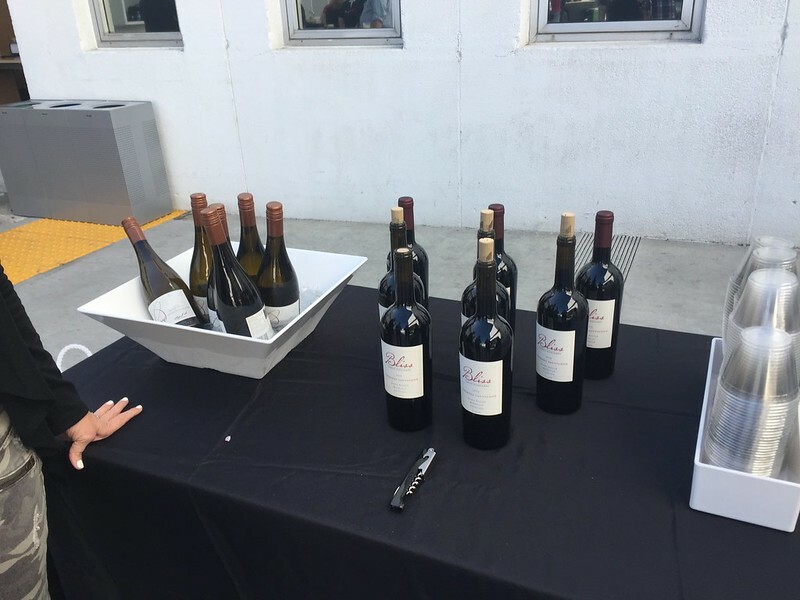 The bar lines were manageable and had a good selection of wine and other drinks. 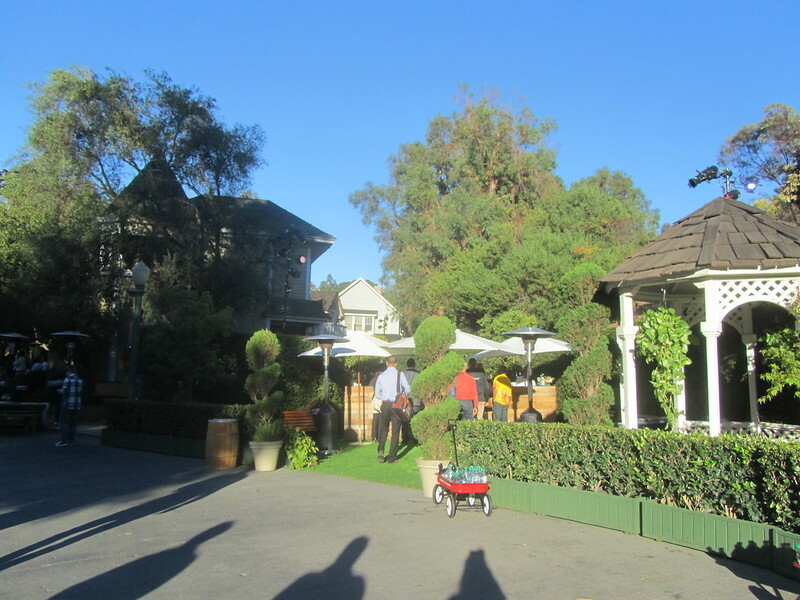 A few panoramics of the first neighborhood, before the section with the four remodeled houses was opened for the presentation. 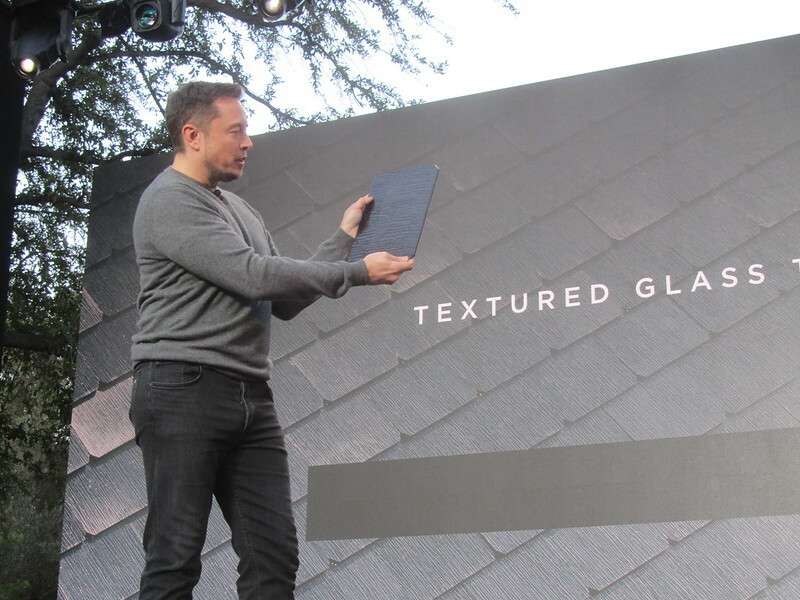 And right around 5:30pm, they let us into the neighborhood with the new Solar Tiles. 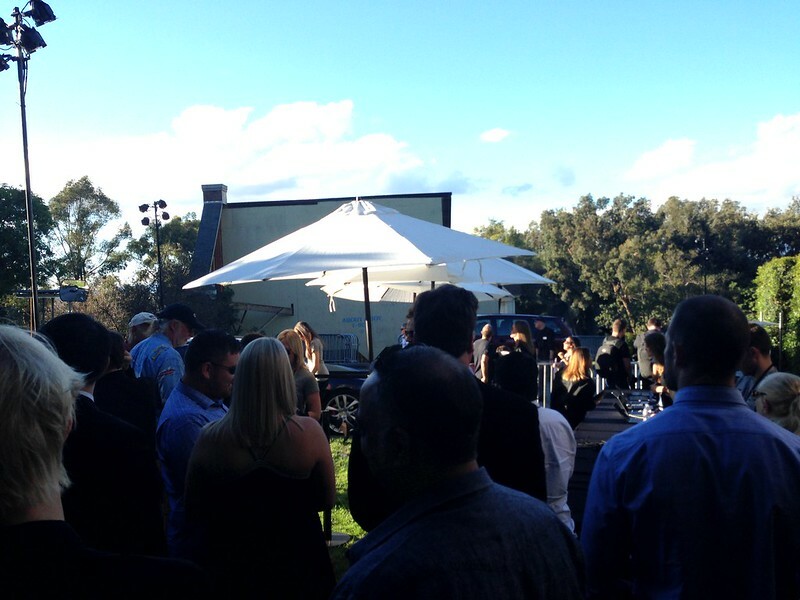 Here’s the stage with the sun shining brightly on it. I was able to take one panoramic shot of the stage and the two closest houses to it. 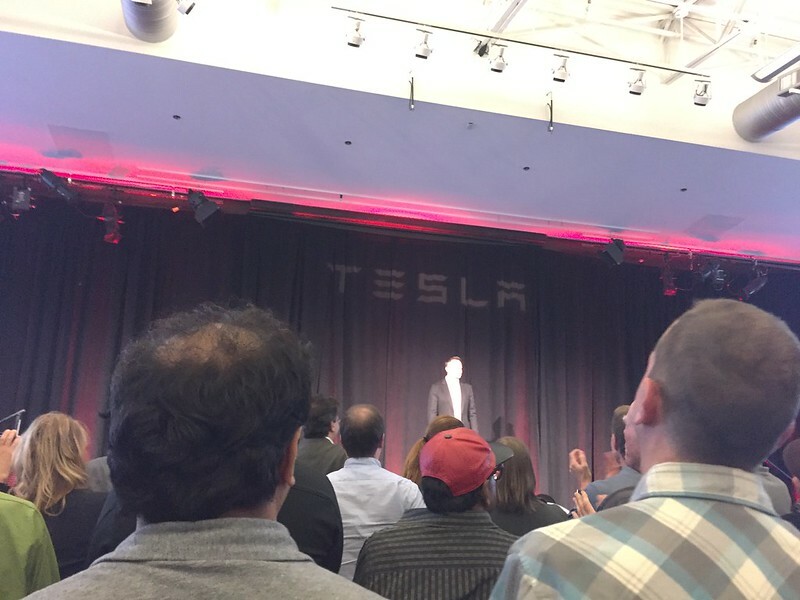 On the left side of the stage is the house that the Model 3 prototype will emerge from later in the presentation. I didn’t actually notice it emerge as I was closer to the right side of the stage. 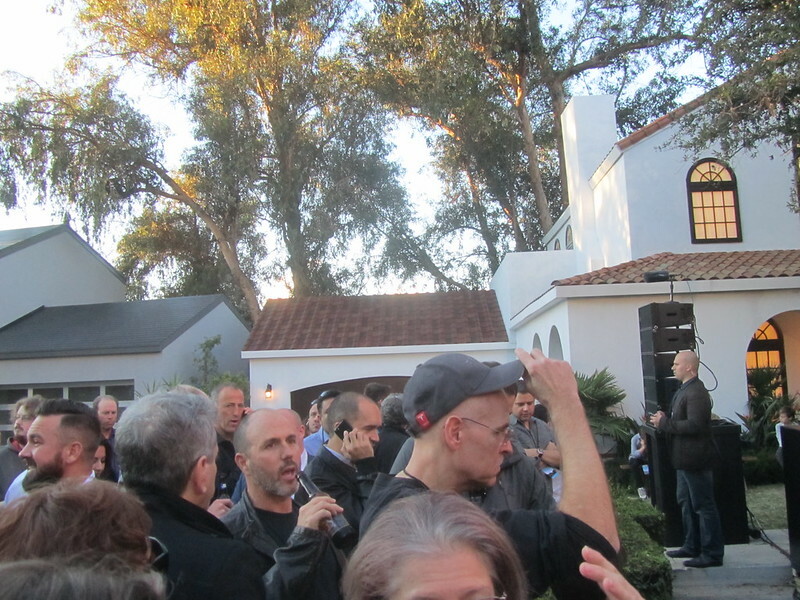 Here’s a closer shot of the house with the Model 3 in the garage before it emerged during Elon’s presentation. The house on the right’s shingles was more obviously solar shingles. However, aesthetically they were quite pleasing. 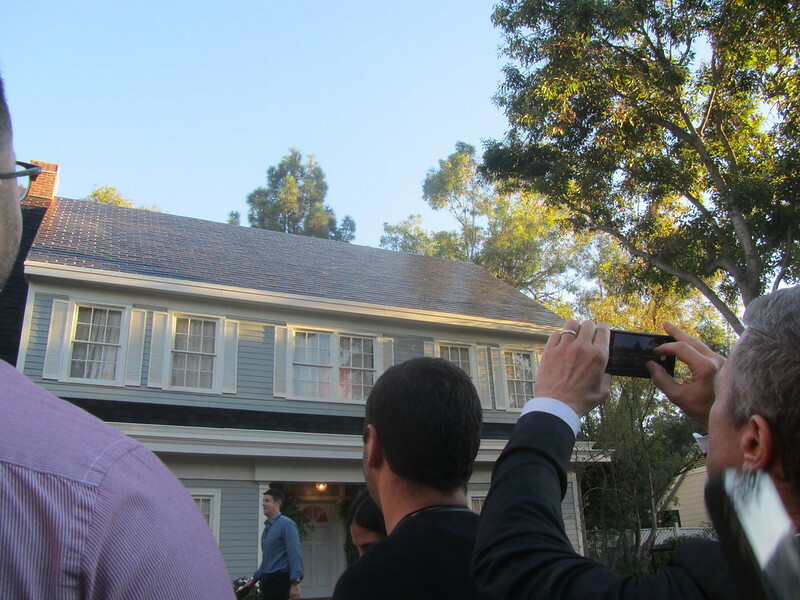 While waiting for the event to start, we were looking at the two houses on our left and were wondering whether they were solar shingles. Something that Elon revealed as fact during the presentation. 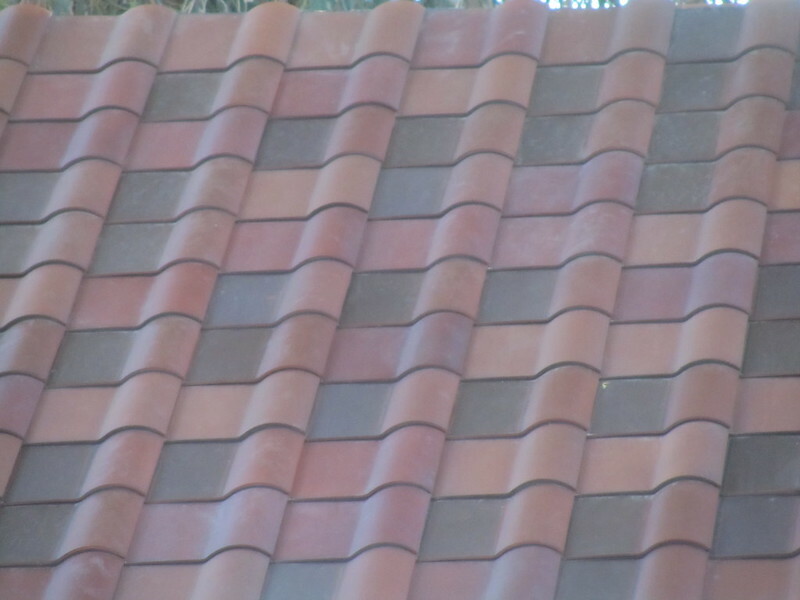 The Tuscan Solar Tile, as this model was revealed later, is ideal for many homes in Southern California. 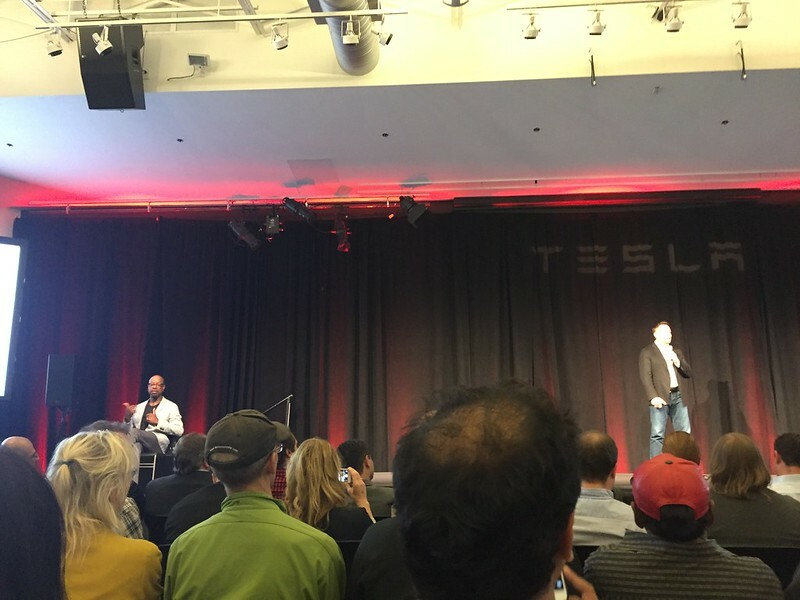 I even tweeted my suspicions just prior to Elon’s talk. 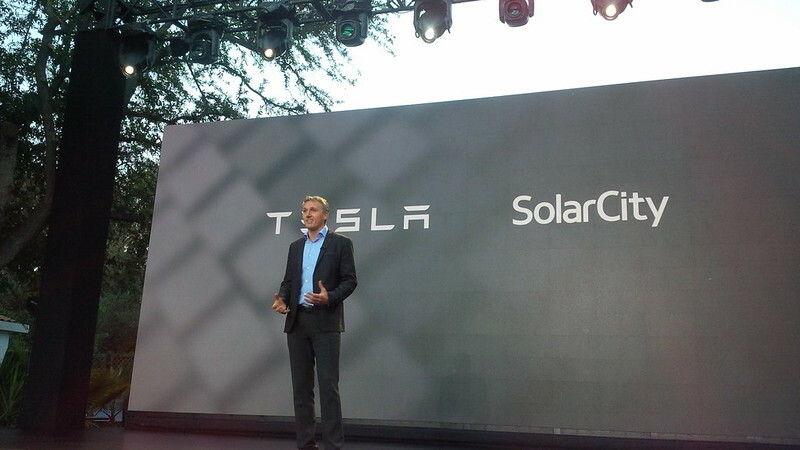 Since the presentation was a joint Solar City/Tesla Event, it started off with a few minutes with Lyndon Rive, Solar City’s CEO and Elon Musk’s first cousin. 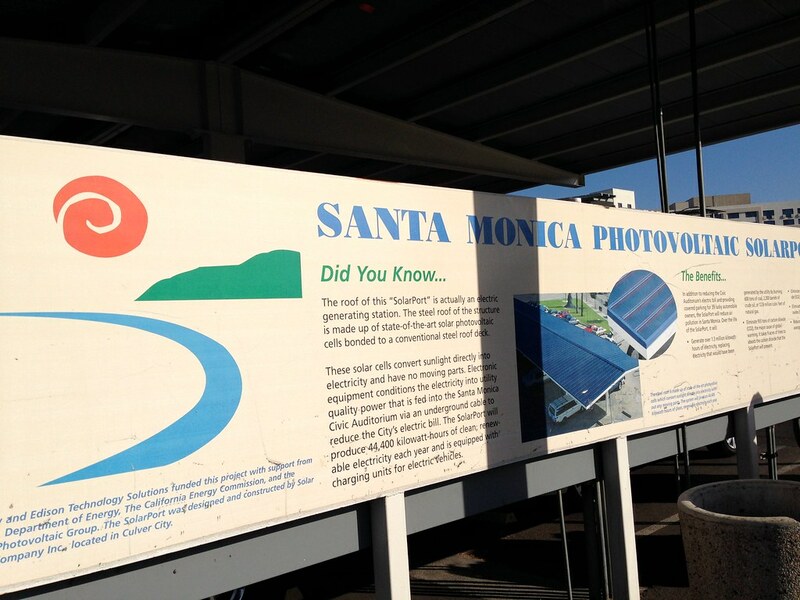 Needless to say… The Solar Tiles are impressive. However, as I previously mentioned, we recently re-roofed when we installed our Solar Panels four years ago. So, that’s just not going to happen. We paid less than $20 for last year’s power and have recently hit our break-even point for our solar panels. We did take a few good close ups, but a lot of the pictures can be seen on our Flickr Album of the event. Here are some of the pictures on the album above. 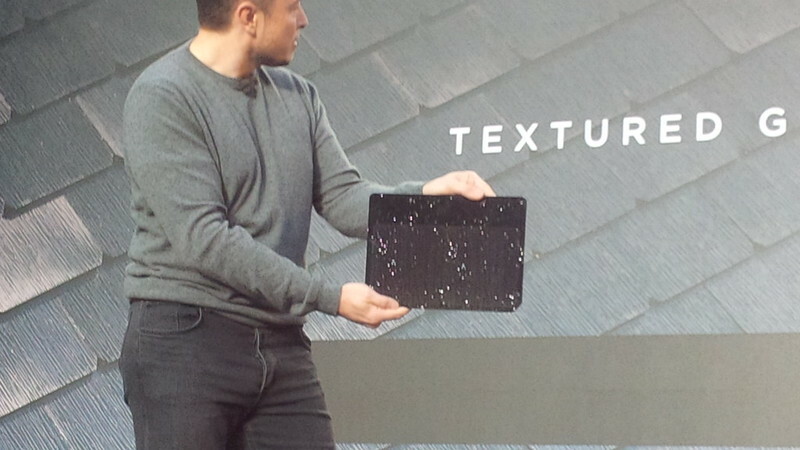 Even though we’re probably not going with the cool solar tiles, the whole house backup thing though is VERY tempting. So tempting that we put in a deposit for a few of them. How many you may ask? 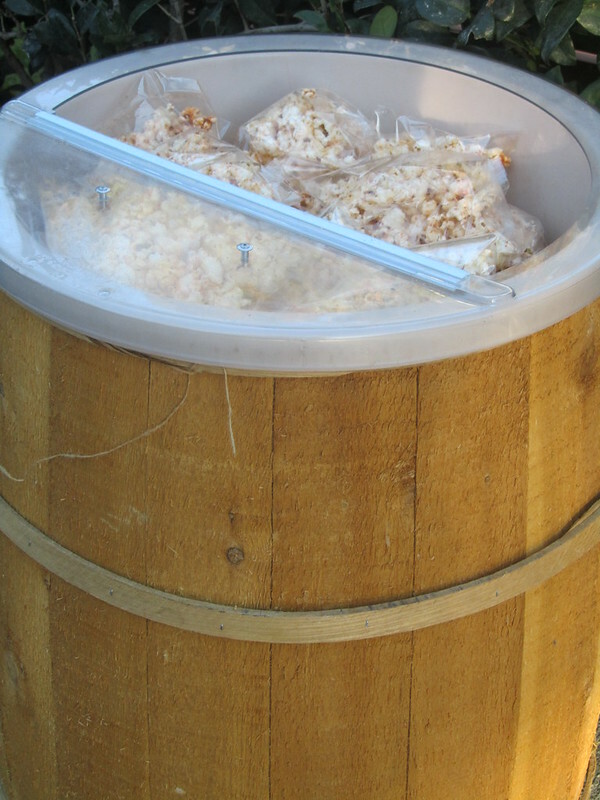 Probably more than we needed… But here’s a hint. Especially since the new version can be more efficiently mounted and stacked this way. 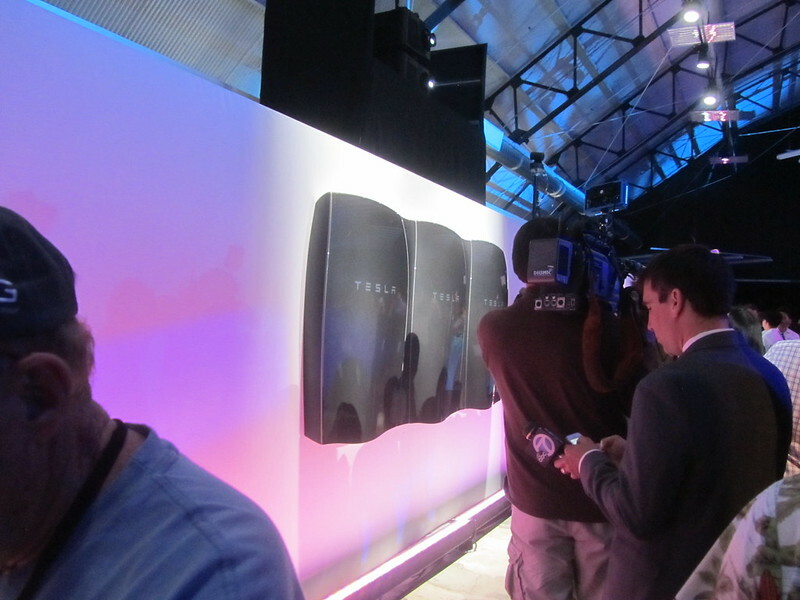 The original PowerWall had to be installed side by side and mounted on the wall. Looks really cool, but I think it’s probably more efficient to install it stacked. 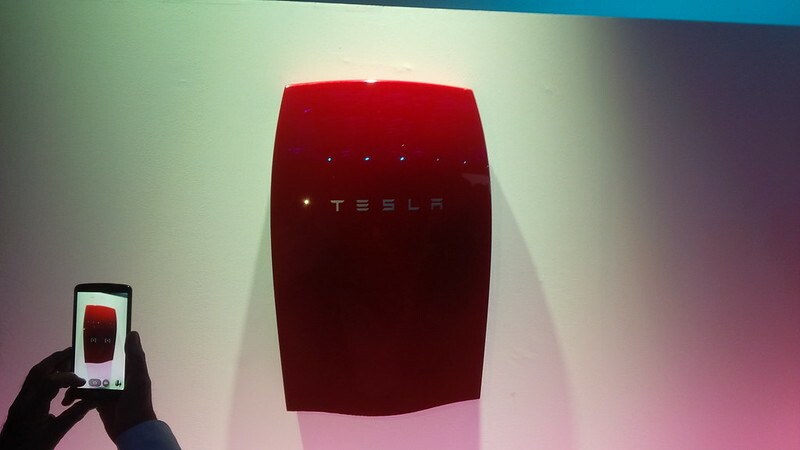 One other thing about that Powerwall… It’s capacity is doubled in the same amount of space at less than double the price, considering the fact that the AC-DC Inverters are included. 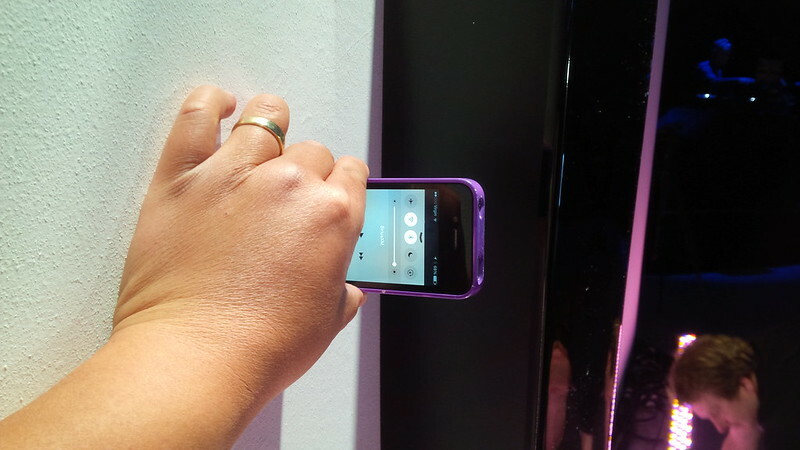 I also did the iPhone 4 width test that I did with PowerWall 1 with PowerWall 2. 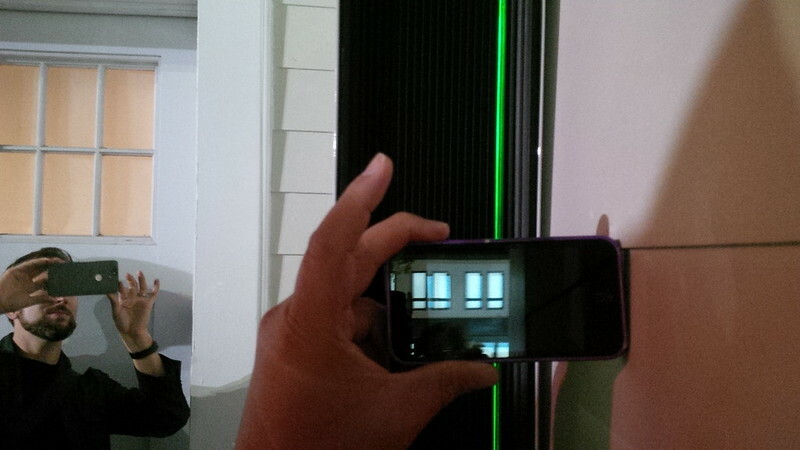 PowerWall 1 compared to an iPhone 4. 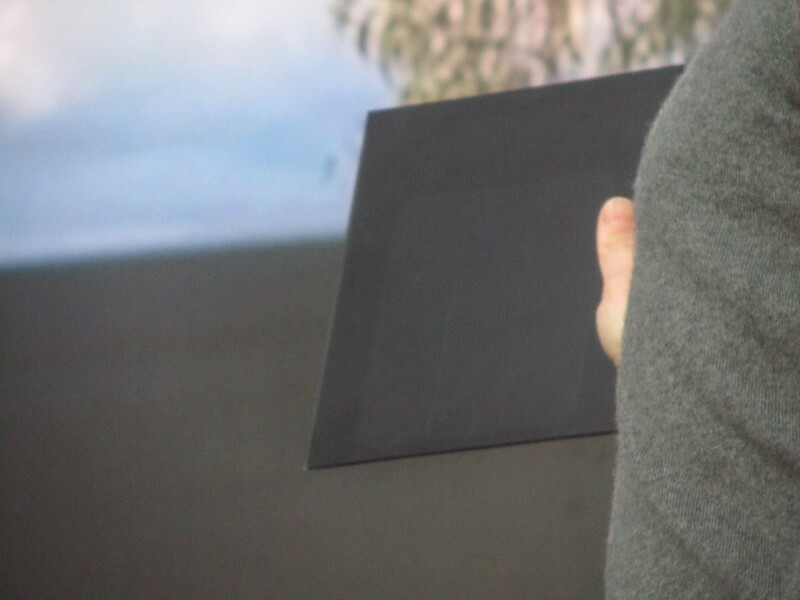 PowerWall 2 compared to an iPhone 4. 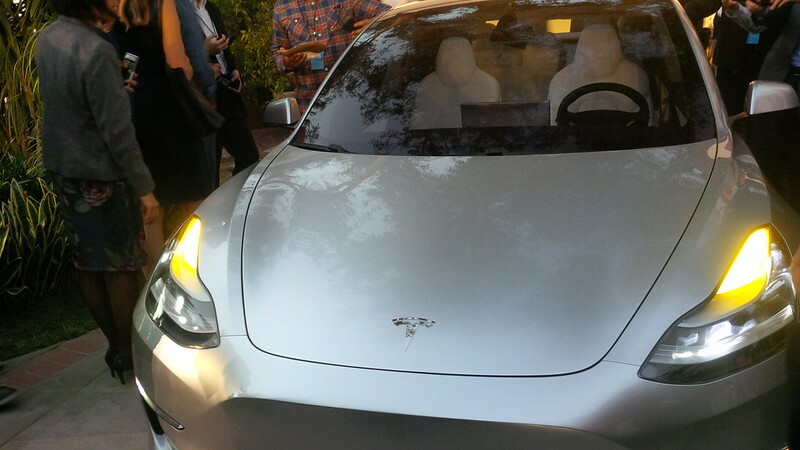 The surprise for me was the appearance of the Prototype Model 3 at such close proximity. 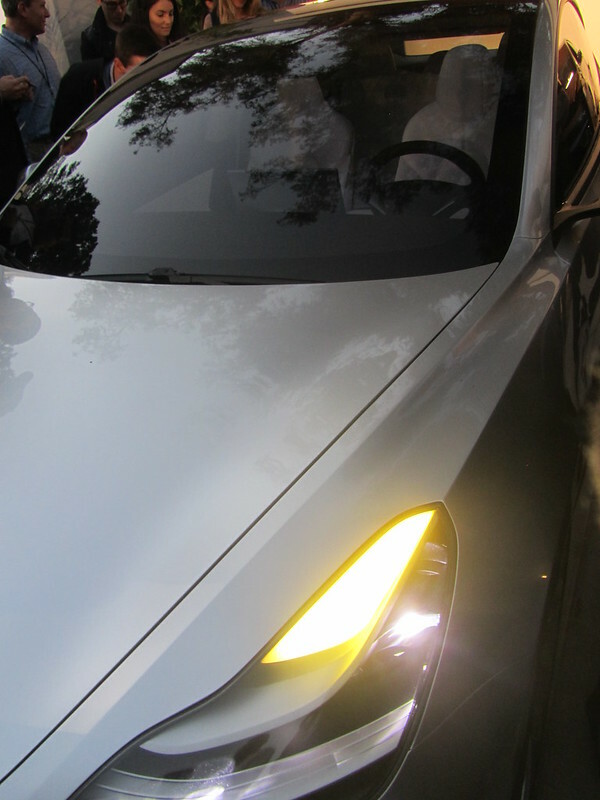 The album for the event has a lot more pictures of the Model 3, but here are a few more shots. It’s bigger than I had hoped. 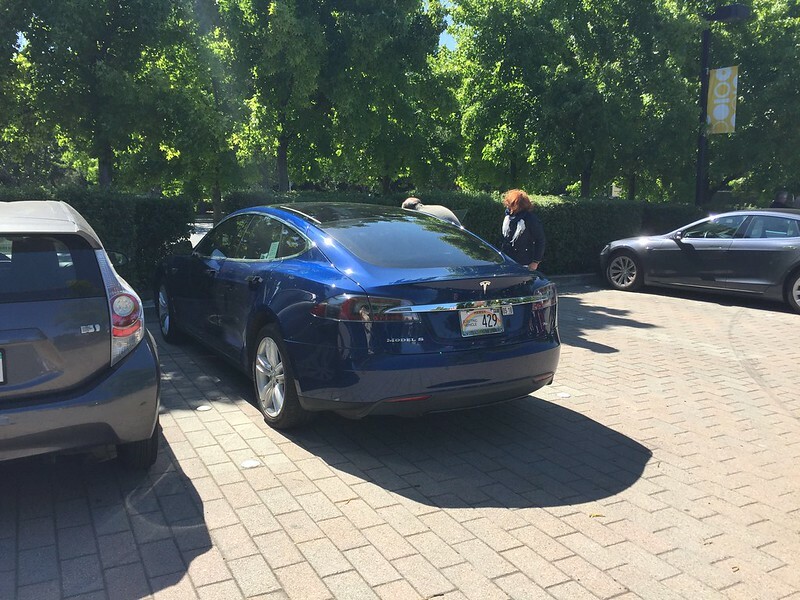 It is smaller than the Model S, but bigger than the Active E. We got a few great shots in before security cordoned off the vehicle from closer inspection. Still a great shot that the better half took of me with the Model 3 in the background. 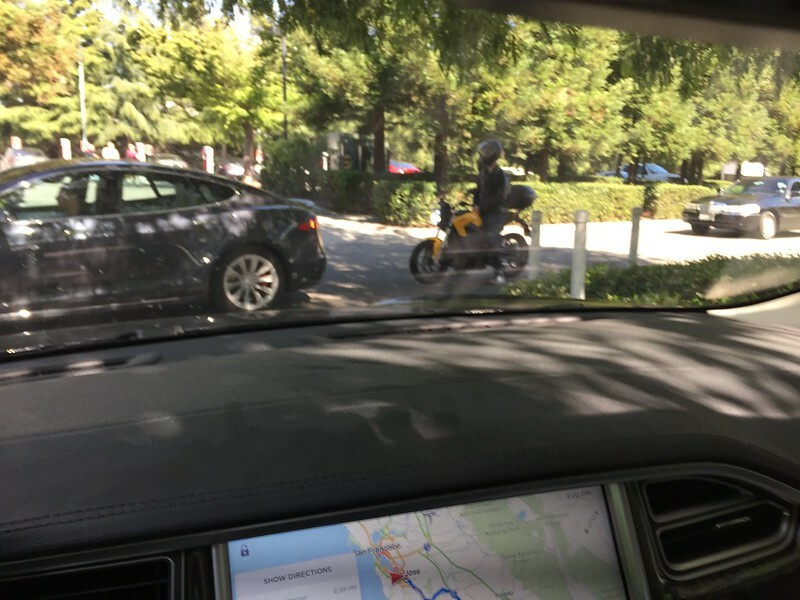 We didn’t get any good interior shots, but this was the best shot of the Model 3 interior… Security was starting to cordon off and was kicking us out. It may be bigger than what I expected, but I still like the Model 3. 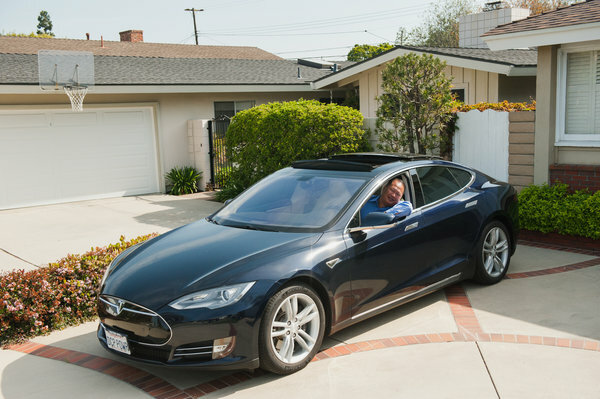 A multi-Tesla neighborhood… Sounds like a nice, clean environment. 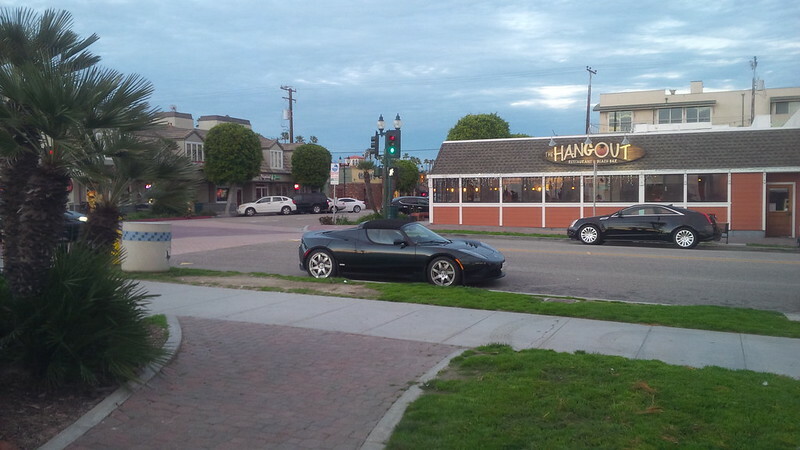 There was also a nice, blue Roadster there. It was a fun event. 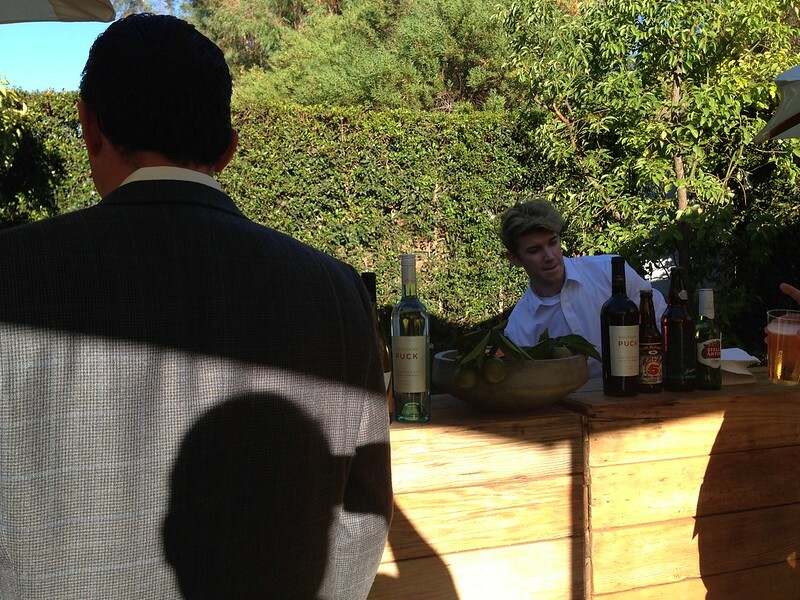 The food and drink was the best service of the ones that I’ve been to. 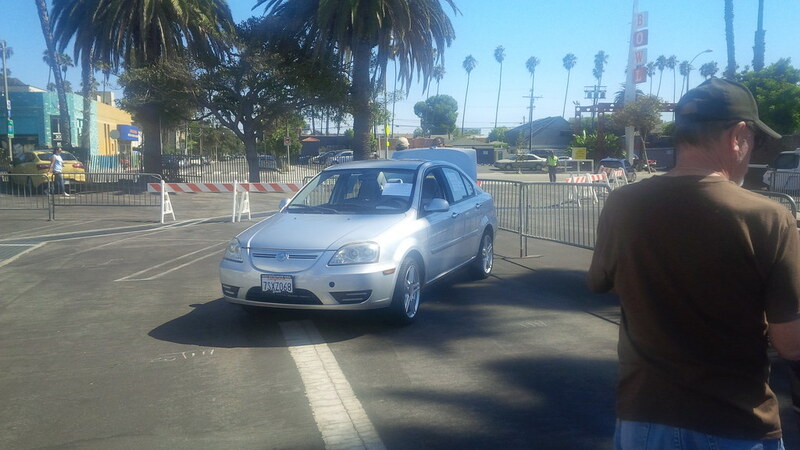 The valet had a wait, but I think that it was better than previous events that I used valet in. 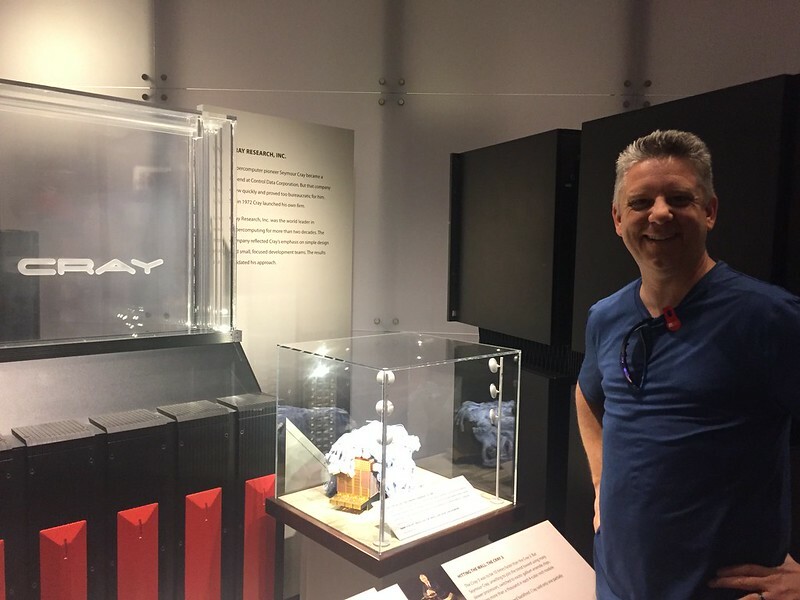 Take that last sentiment with a “grain of salt” since I used the bus at the Gigafactory Party, and I found that to be the most relaxing way in and out of a Tesla Party. The party may have been free to attend, but I walked away with a very expensive deposit for some batteries for the house. We’ll have to see how long before we get these installed.